Earlier in the year with a ton of practical jobs looming, a few friends and I decided to set up a Job Club. Big tasks can sometimes be a little overwhelming and hence get procrastinated or aren’t enjoyable. I’ve been aware of this for ages but thought that it might just be my issue or I just couldn’t see a way around it. However, Leo, over at the lovely blog Zen Habits talks a lot about us all (human beings) suffering the same problems. I guess understanding this on an intellectual level is the easy bit, making the emotional leap is different. I had noticed however that people, including myself, often struggle with the amount and nature of certain tasks. I know from my years of working in gardens that having company can make things rock along just fine. Not that I’m knocking the solitary sphere, just that sometimes many hands do make light work. Which is another point made over at Zen Habits Sea Change – the usefulness of making habits social. I was luckily the first name to be drawn (not fixed, honestly your honour) and five of us tackled the weeding and sorting of my polytunnel and assembled some wooden staging I’d bought. I forgot to take pictures I was so excited about getting stuff done – and the homemade cake which turned up with two participants. It only took about 3 hours on a Saturday morning which left the rest of the day free. Yesterday we went to P’s, she needed her garden sorting out. 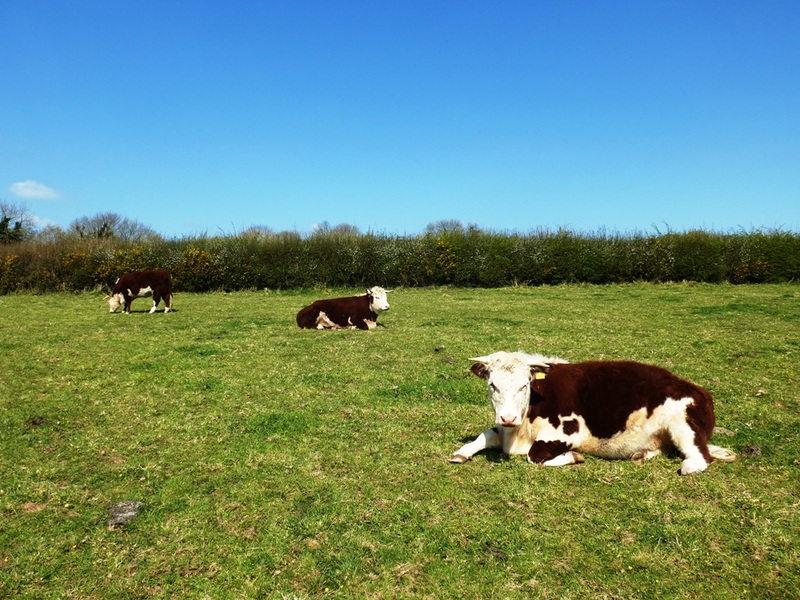 As you can see the cows have been enjoying all this fine weather too, though they are slightly miffed that I won’t let them have more grass as I am trying to keep them slim for the AI in May. Anyway, I was telling my brother-in-law about the job club and he told me about the organisation Timebank where people swap skills, simply an hour for an hour. What a good idea. I know these kind of schemes have been going for years, but they seemed in the old days, though innovative, dominated by people who offered theraputic massage and other such healing things, which didn’t really get you very far when you needed a plumber. Or an architect. Or an IT specialist. Fast forward a few years and it’s gone a bit more mainstream and you can find out all about it here. I’m sure the internet has been totally transformative for things like this. I think I might sign up. Our pole barn finally died in the winter storms. 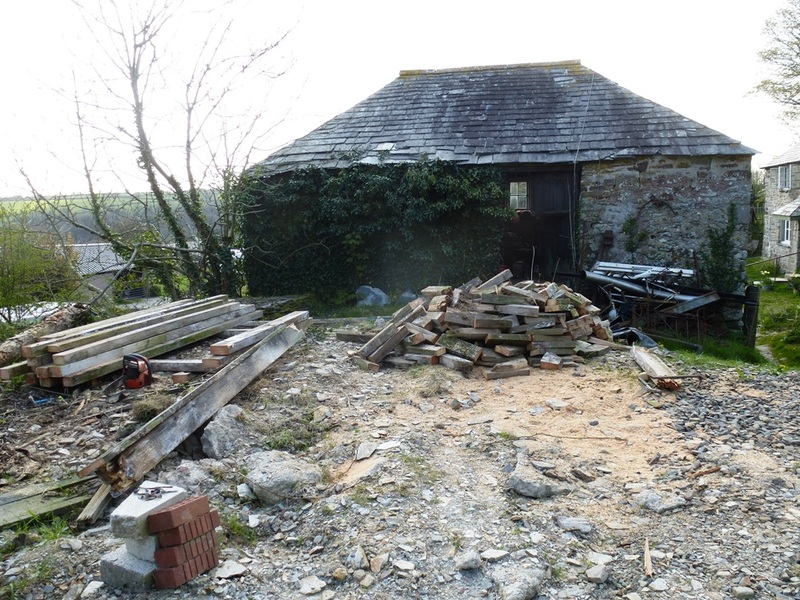 We will be putting up a new barn (all being well with the planners) soon. Some of the unusable wood sawn for next winter. We’ll put it in the closed stove as it will spit like mad. It burns fast so excellent for heating water quickly. Despite the sunshine the trees still looks pretty wintry down here. With a huge aging population in most affluent countries the challenge to carry on living well into old age is a hot topic. There’s some great ideas on there for making extra cash and it’s just at the start of its life so expect lots of interesting posts about innovative ways to live into retirement. Enjoy earning in later life! 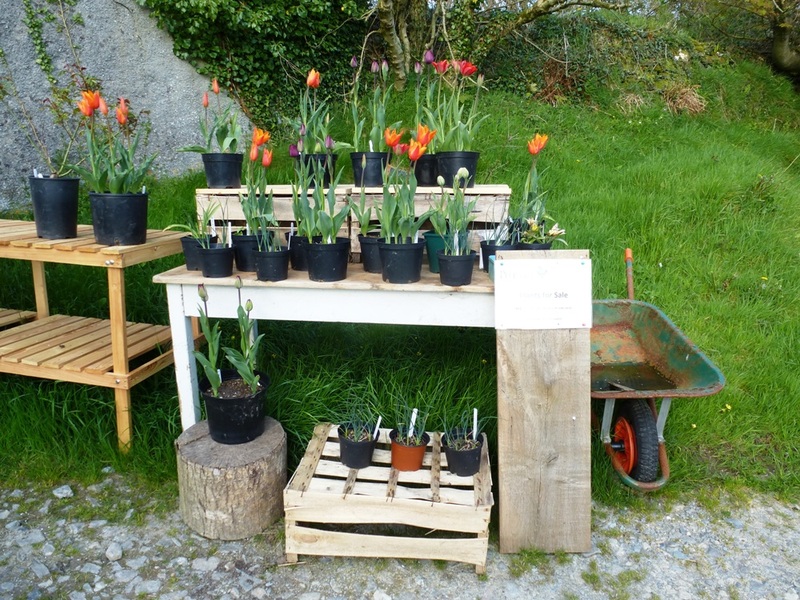 The Perennial stall is up and running again. 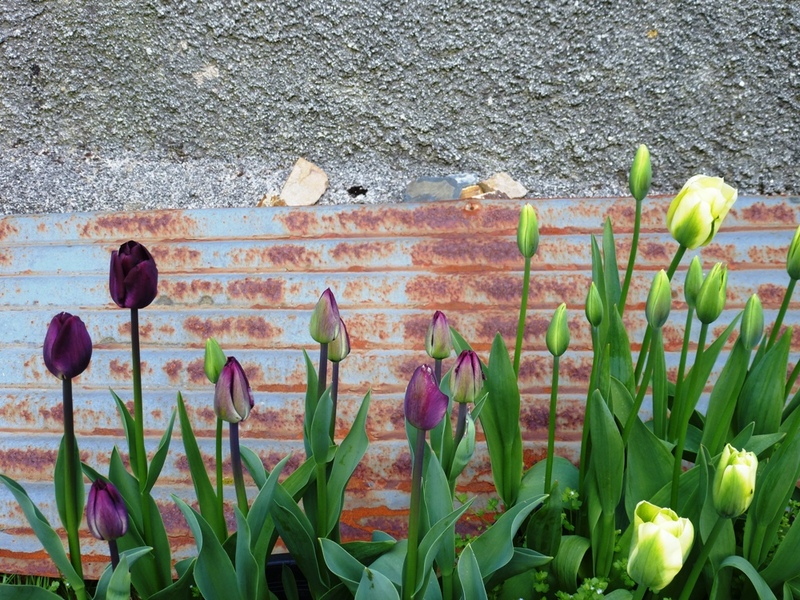 I’ve now got a plant hospital as well as growing from scratch – rescues from other gardens. The charity is trying to raise an extra £175,000 this year. 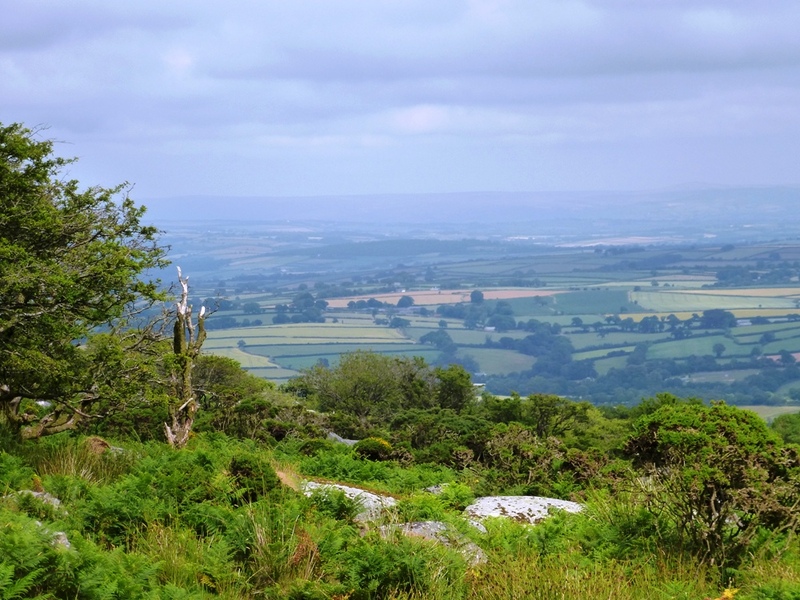 Some friends and I are planning a coast to coast walk in August in Cornwall, hopefully we can contribute something to the pot after our effort…it’s not a massively long one, just 3 days. Better get into training nevertheless. Wish me luck! This morning I struggle with the swollen front door, meeting a wall of wind which makes me stagger. 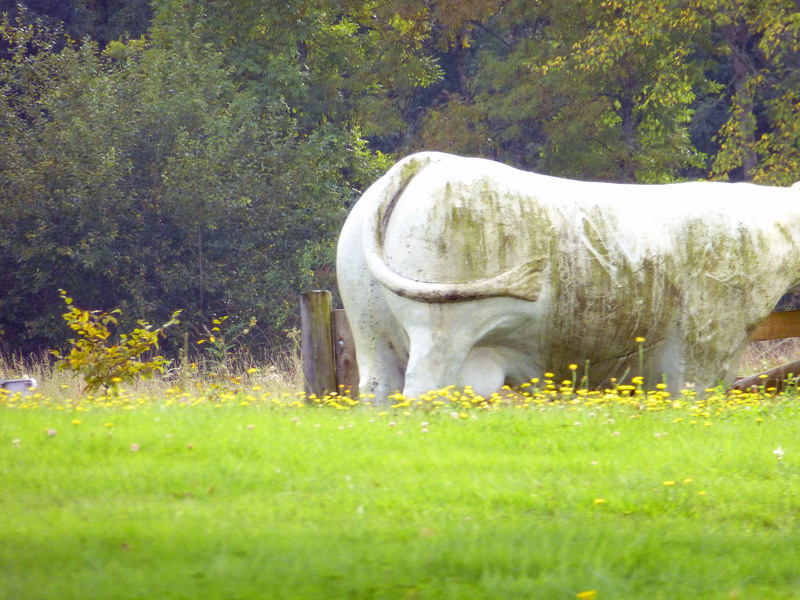 I head over to the cow field. The going is getting really tough, each foot sinking into a sticky squelchy hole. 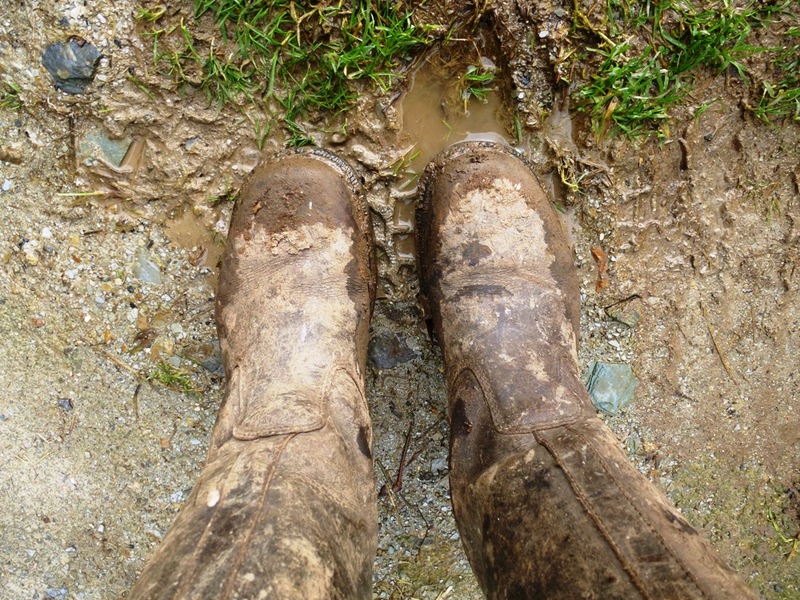 A jet of liquid mud and manure is nicely timed to splatter over my jeans. This morning we heard on the radio that the main train line has been washed away by the sea at Dawlish. 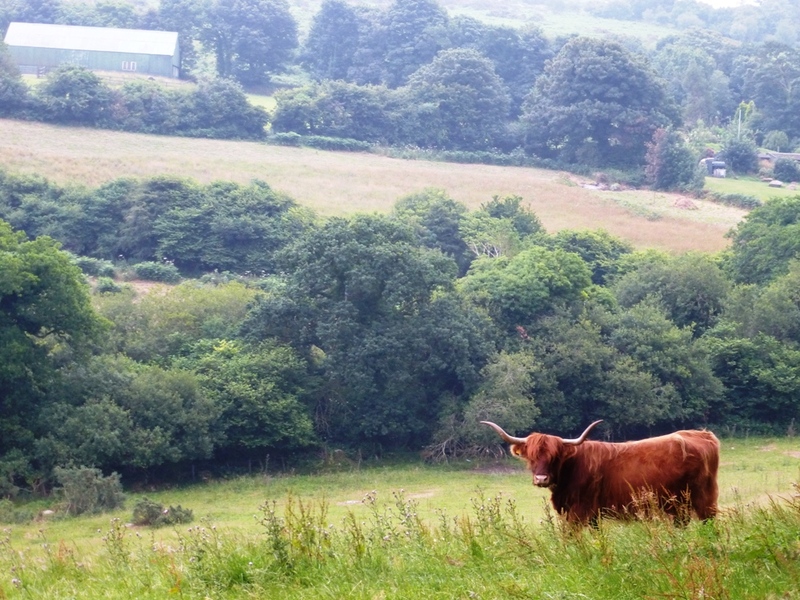 This is the view from the cow field. Normally you can’t see the river very well as it is hidden by steep sides. 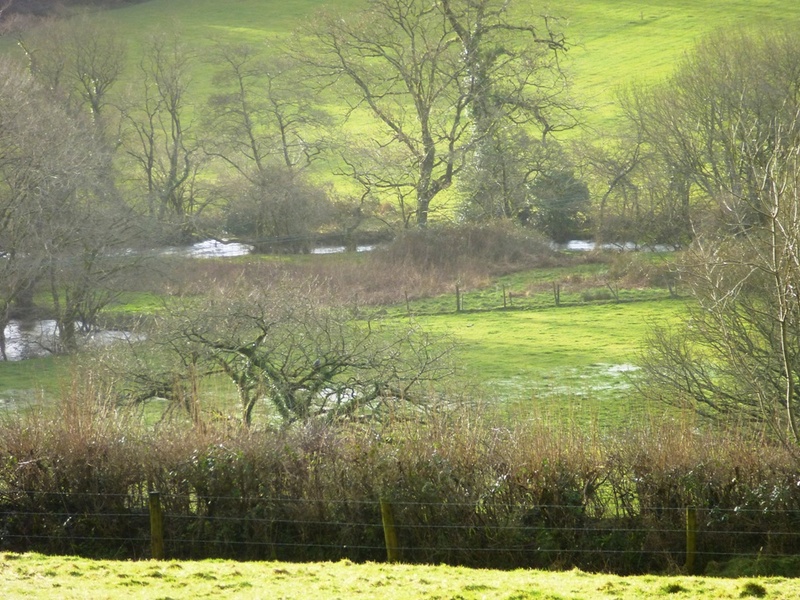 The adjoining field aslo flooded here. Despite all, we have managed to get some some winter jobs sorted out on the dry days. 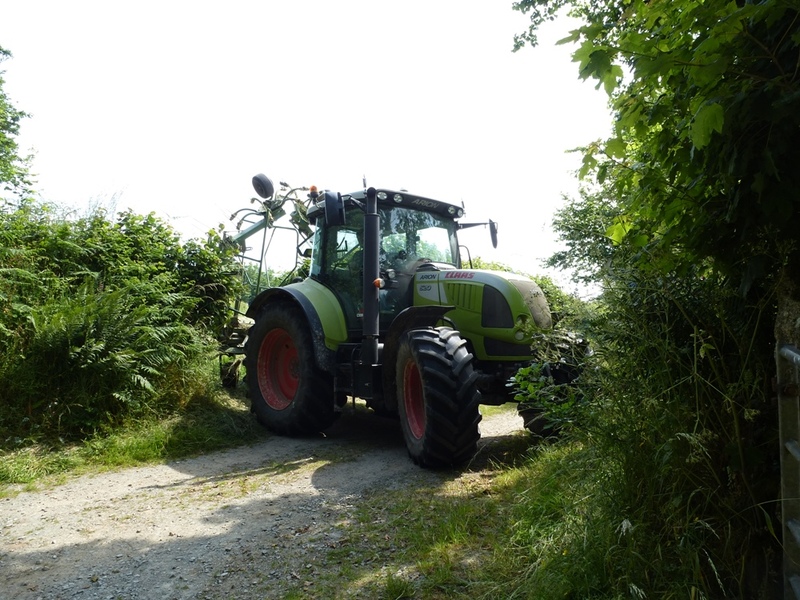 Hedge work has been ongoing for a few years as we are in the process of restoring our hedgerows – not on our own though, far too big a job for us alone, we have lots of help. It doesn’t come cheap but we think it’s worth it. 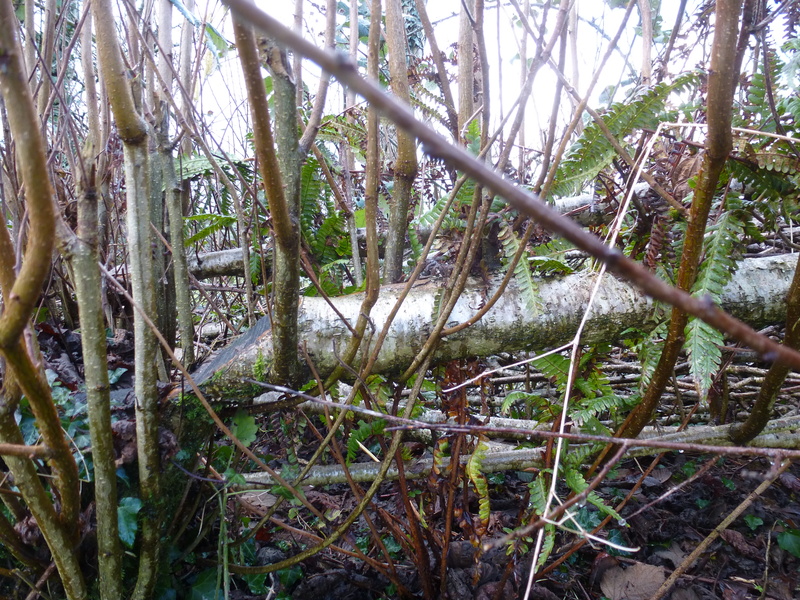 This is new growth sprouting from the hedgelaying last winter. 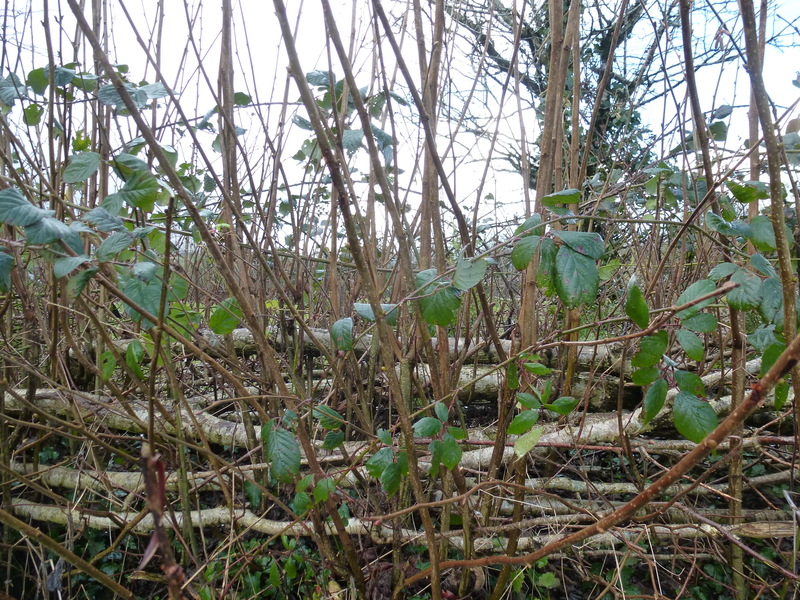 It’s a little rough and ready and not as beautiful as some hedgework but we are working with what we’ve got – in this case, outgrown hazel. Hawthorn whips were planted to fill any gaps, though the hazel is quite dominant. In the past, without barbed wire the bulk of the hedge would have been hawthorn or ‘quickthorn’ as it is known colloquially. 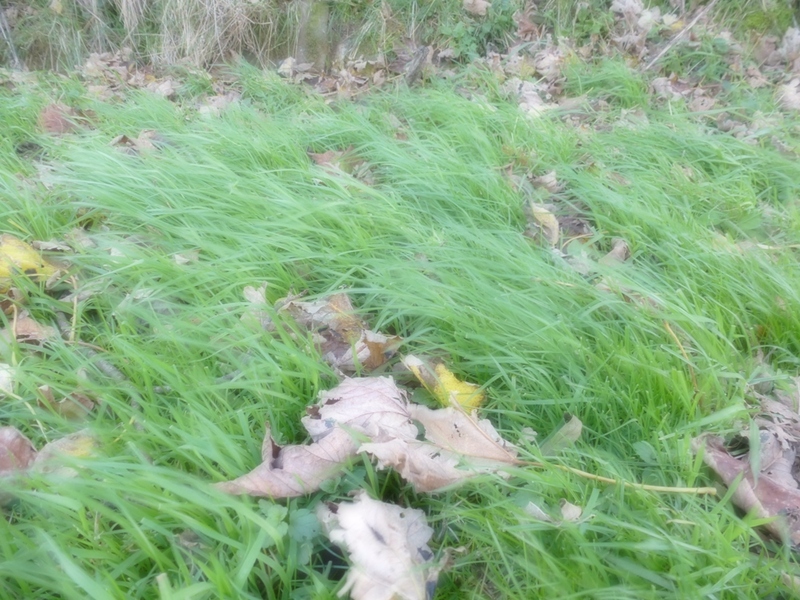 You can see here where the hazel was laid down with a cut from the billhook. The thicker hedges will provide a great habitat for wildlife. We leave some trees at intervals, as is tradition. 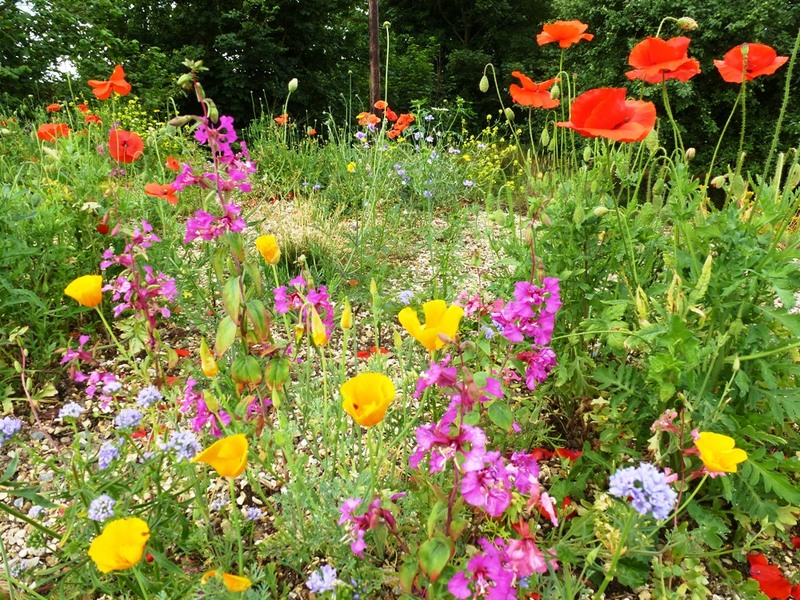 These provide shade and another kind of habitat. 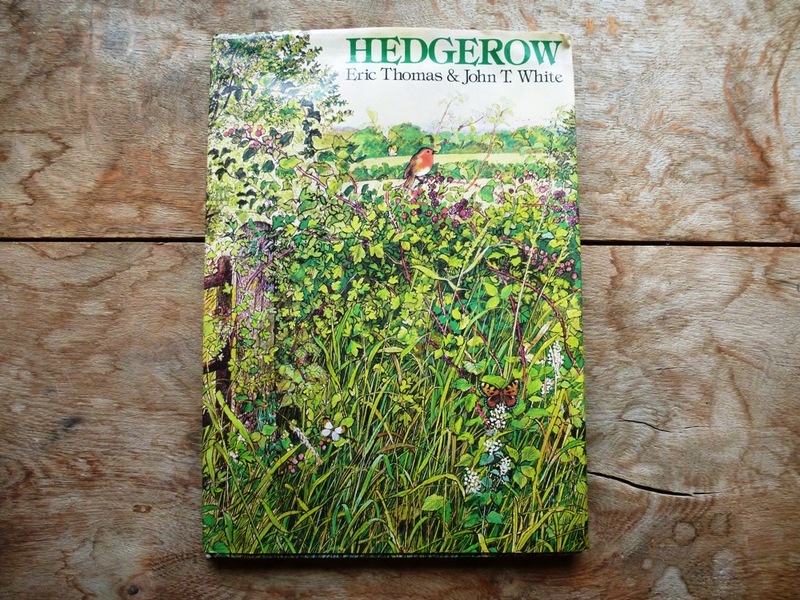 This book ‘Hedgerow’ by Eric Thomas & John T White is now out of print but it is a lovely book and some copies are still available online. I think it deserves a reprint. It’s supposed to be a children’s book but hey, why let them have all the fun? 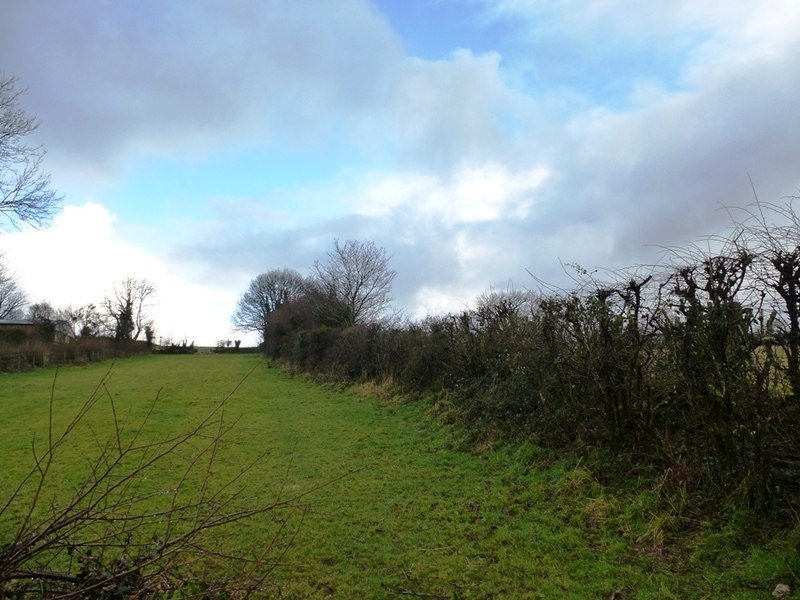 This is one boundary which had overgrown into trees. We’ll do the other half next year. 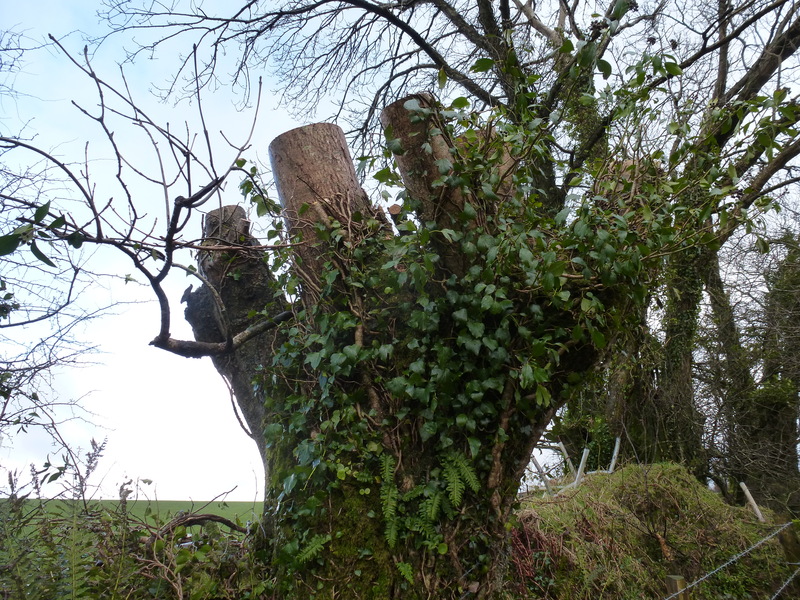 This hedge down the bridlepath has a lot of sycamore in it – not something you want in a hedge. 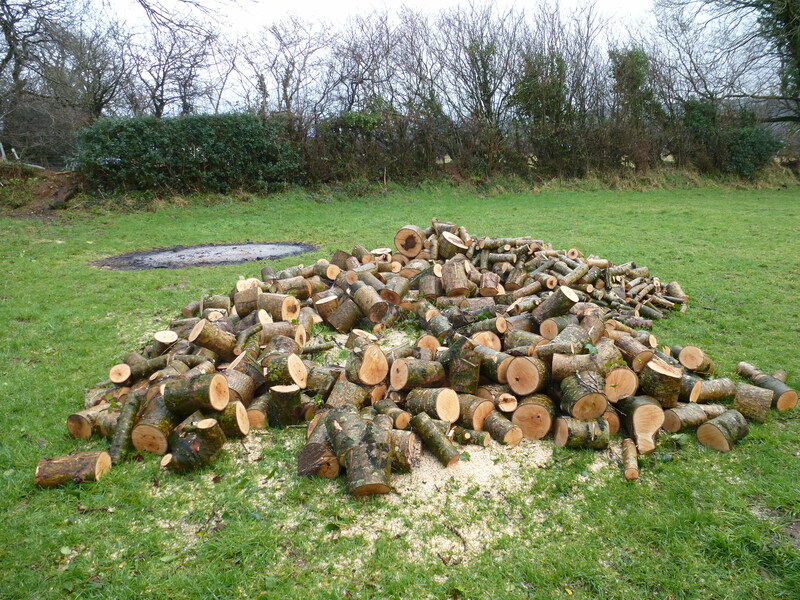 This year we have taken on getting rid of them by cutting and poisoning the stumps. 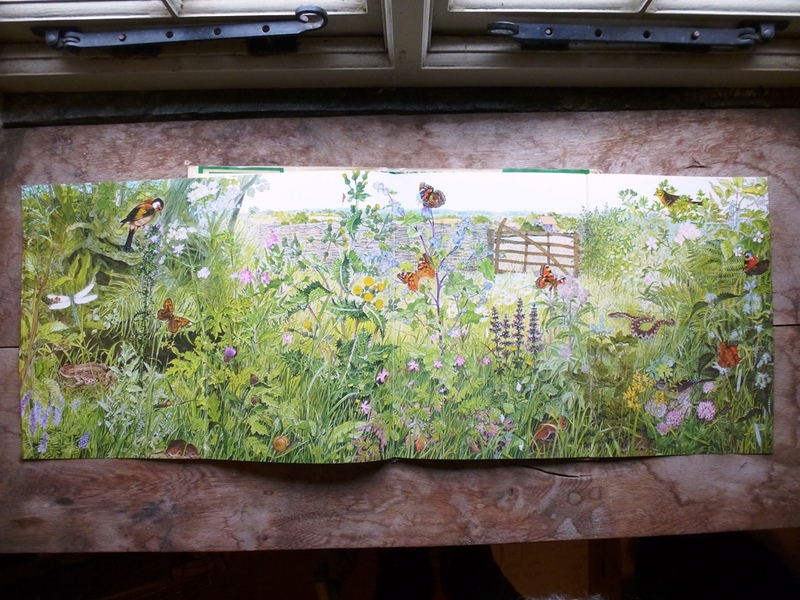 This work has to be done in the winter, soon the shoots of bluebell, campion and stitchwort will appear. 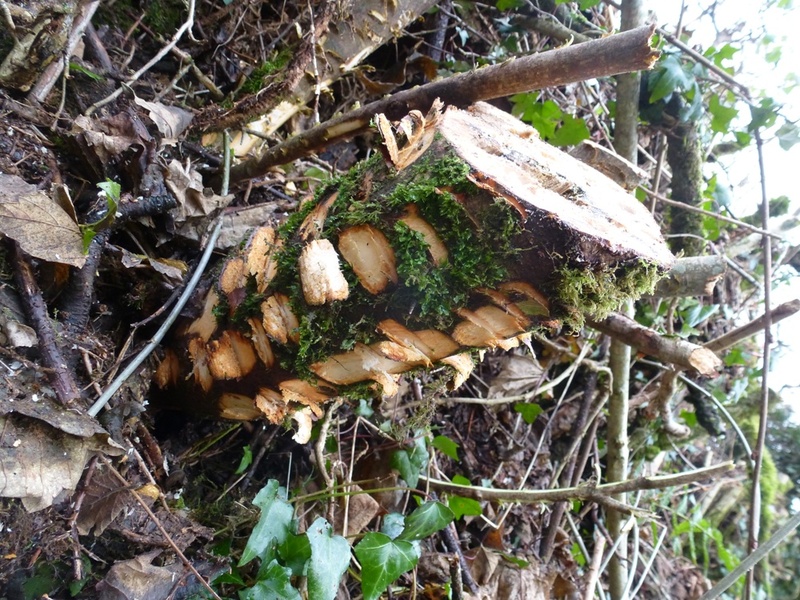 One of the sycamore stumps ready to apply the poison. I drilled holes into the top as well. It looks brutal but will be beneficial in the long run for the all the flora along this stretch. 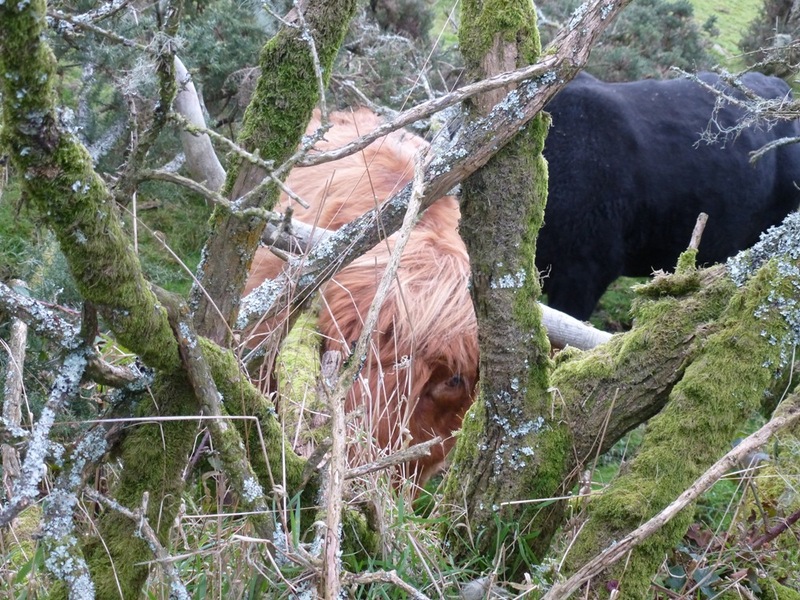 Hello, what are you doing in the hedge? Bit windy? 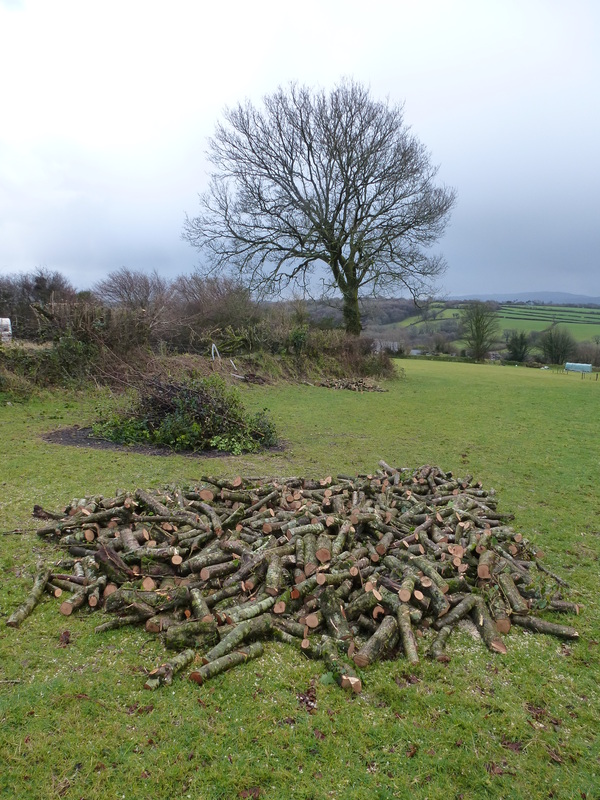 We are also having trees cut for some of next winters firewood, using old pollard points to take the trees back to. 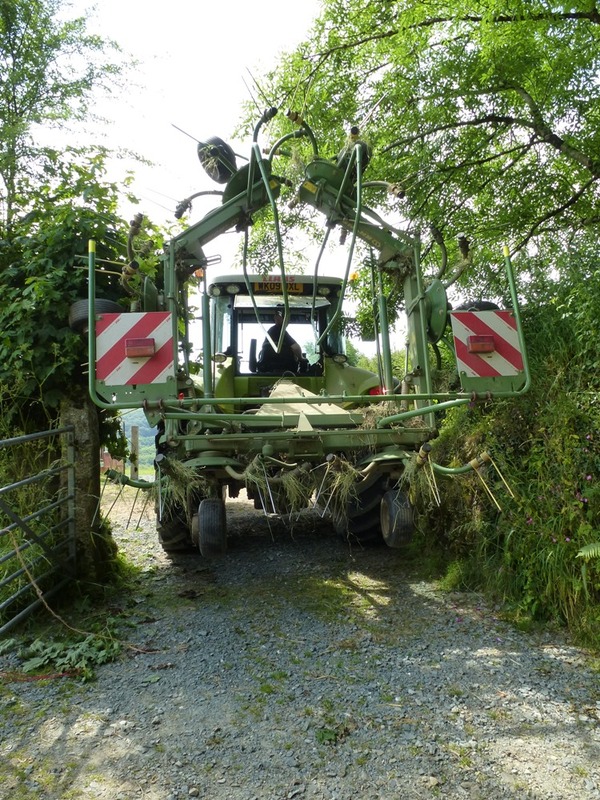 Pollarding is an ancient practice of harvesting tree growth at a manageable height. 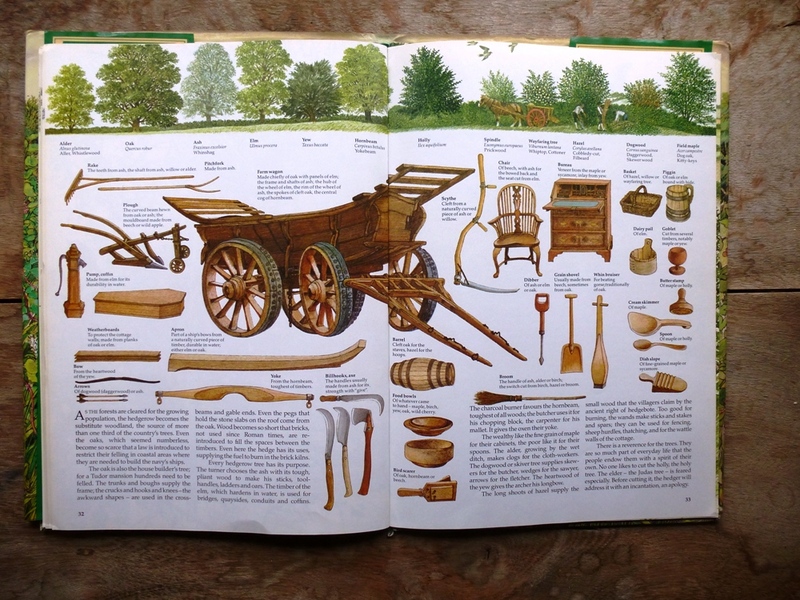 This wood had many uses in the past…animal fodder, firewood, wood for the production of simple household items such as door handles and broom sticks. 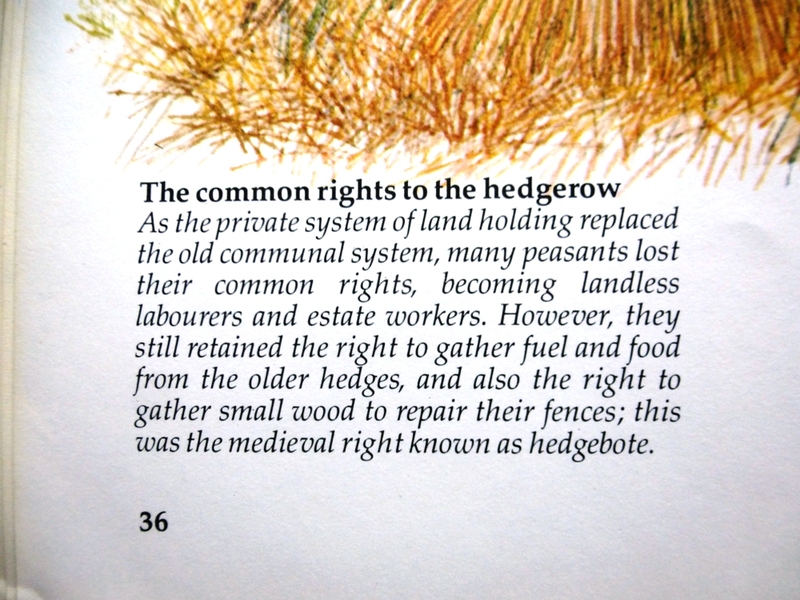 The Hedgerow book takes you on a fascinating journey into the history and culture of the hedgerow. 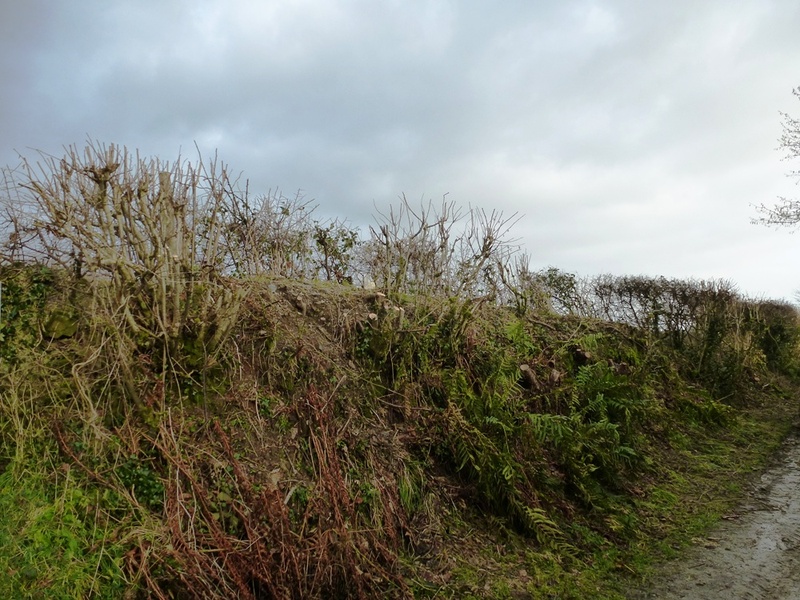 Slightly neater than ours… Hedgelaying competitions are still held every winter to find the quickest and neatest craftsman. 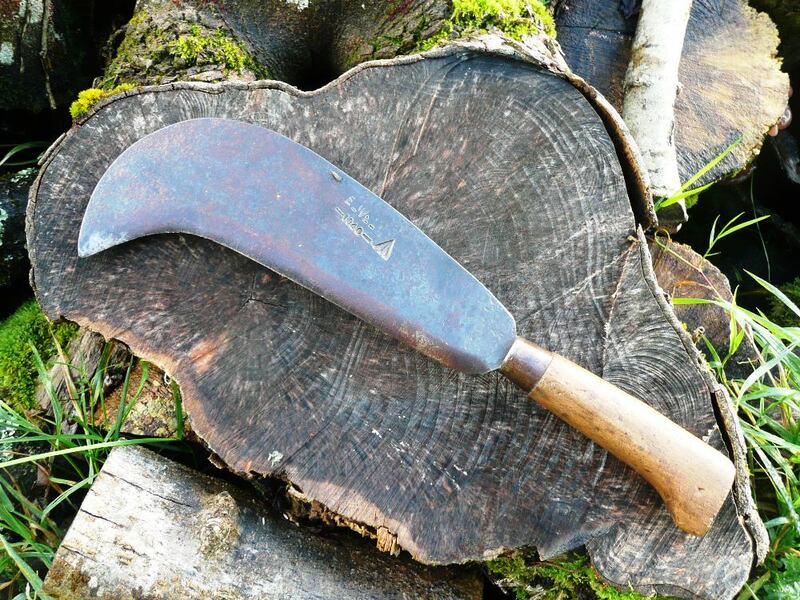 I’ve always enjoyed the process, if you get a chance, do pick up a billhook and give it a go. 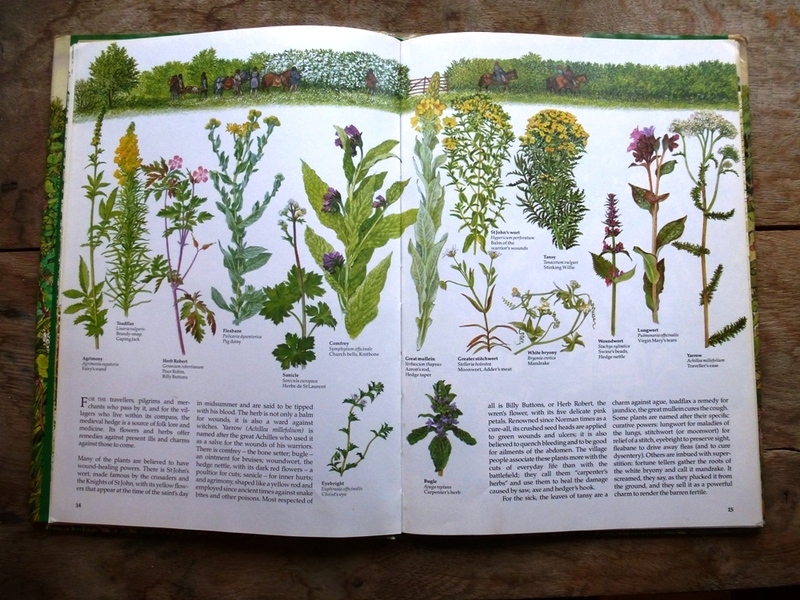 The hedges’ summer bounty – showing edible and medicinal plants. 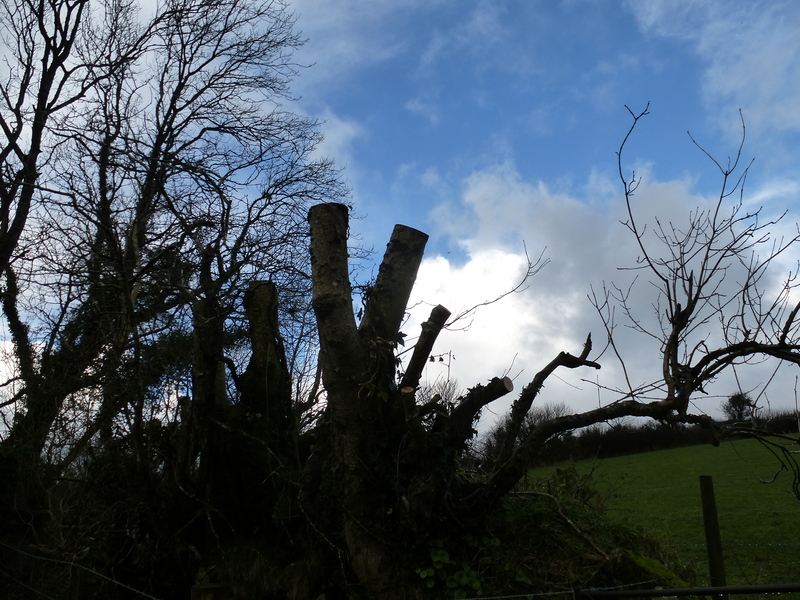 An ash taken back to old pollard points – this tree has been managed like this for many years. 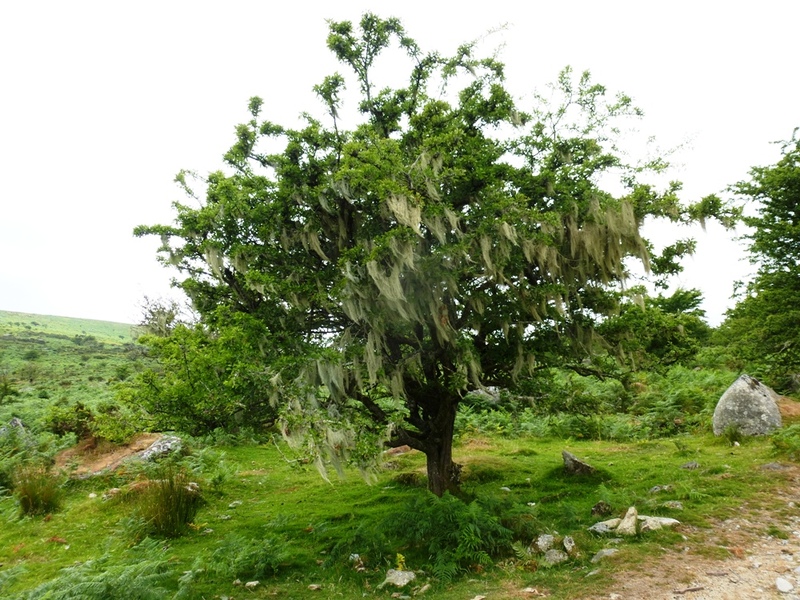 Pollards live for a very long time – some oaks pollards have survived 600 years. I always think about the people all those years ago cutting in this same way. 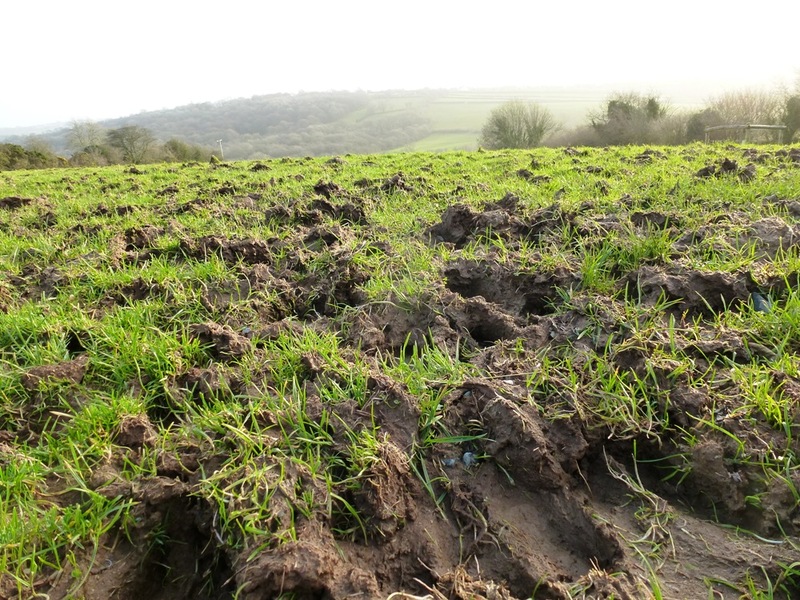 As the grass is so wet there is not much nutrient to be had from what’s left on the pasture. 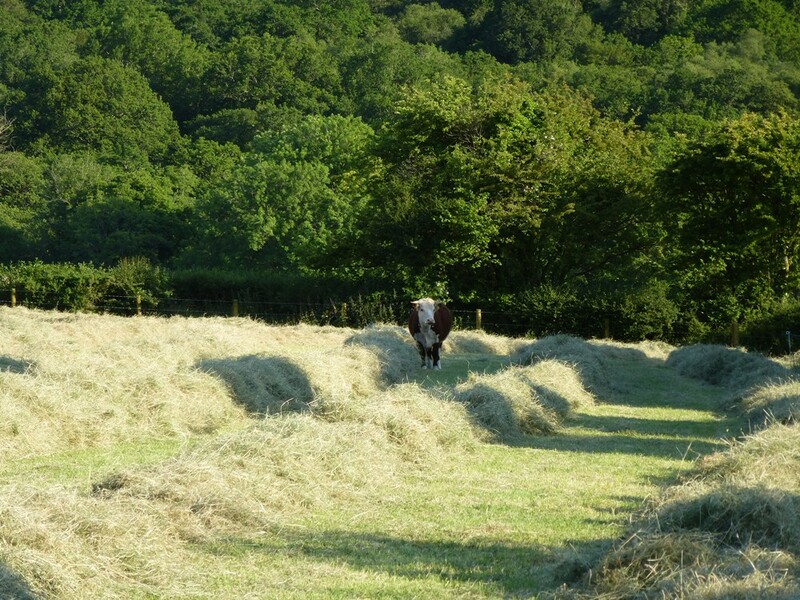 The cows are always hungry, they really love the hay. Every time I split a bale last summer just tumbles out. I have to corral them while I clean out their shed and divvy up the hay, otherwise it’s all a bit hectic. Just don’t get between a heifer and her hay! 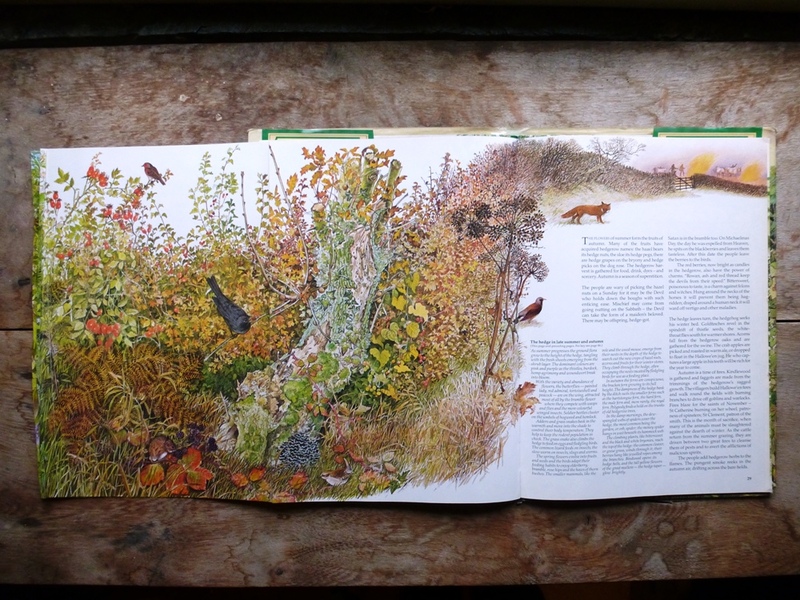 Another beautiful feature of the book are the double and four page spreads in the centre. Obviously my pictures don’t do it justice but you get the idea. 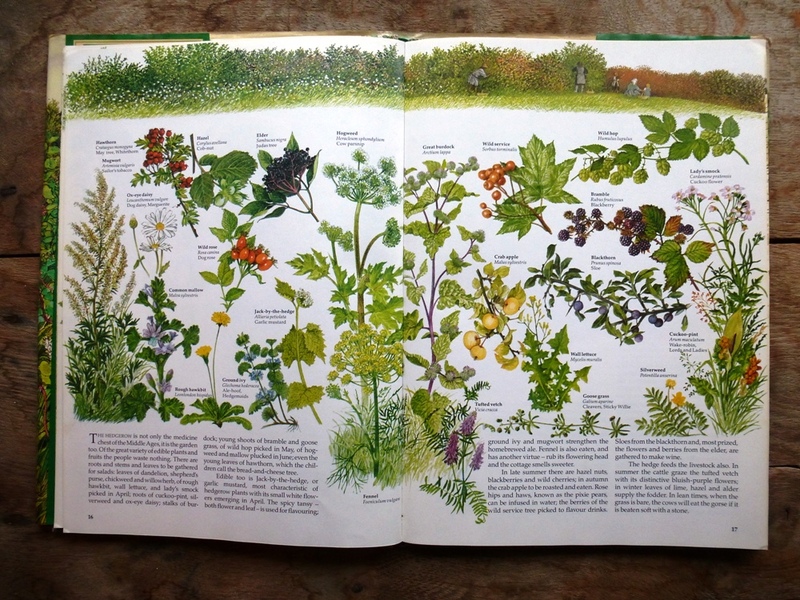 This is the diversity which you would hope for in a traditionally managed hedgerow. We’re coming, where’s our hay? I have not stopped looking at cows. Here is my selection for 2013. 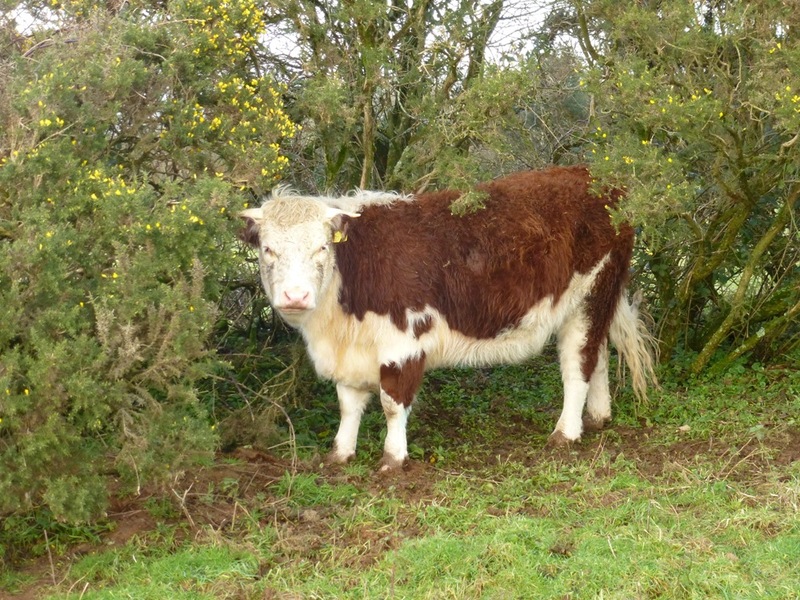 The first part of the year was a bit barren but soon the cows were appearing all over the place. 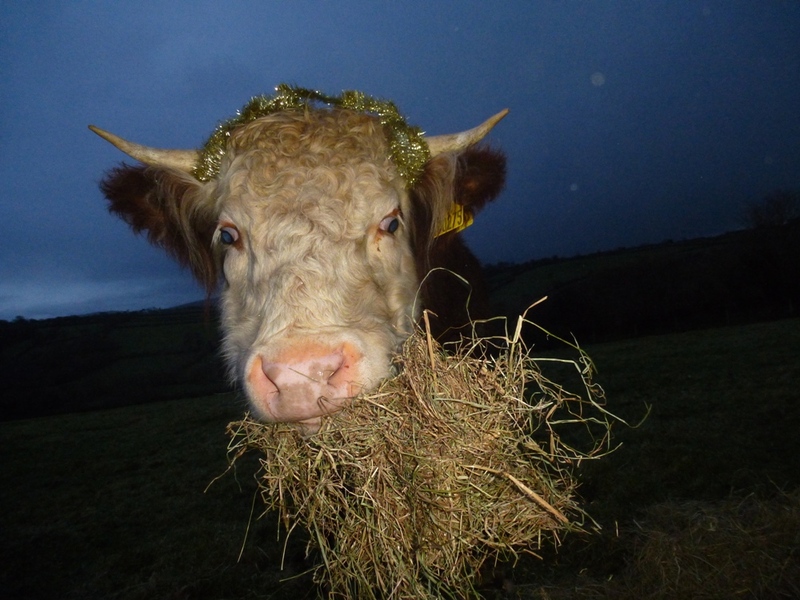 Well, we’ve just sung carols to the cows as is now the tradition. You can see what Lucy thought of the whole thing. Anyway I’d just like to wish readers of thinkingcowgirl a very Happy Christmas/day off and say how grateful I am for the time you take to read the blog. As you’ve probably noticed I haven’t been very active recently but I hope to do a post soon. Thank you and best wishes to everyone! 27th October. The storm of St Jude sweeps in from the west, gathering strength and we view it in satellitic swirls moving across the Atlantic. We batten down the hatches and secure anything that is likely to break free. I move the car away from the potential teetering of our tall pole barn which sways disturbingly in a high wind. 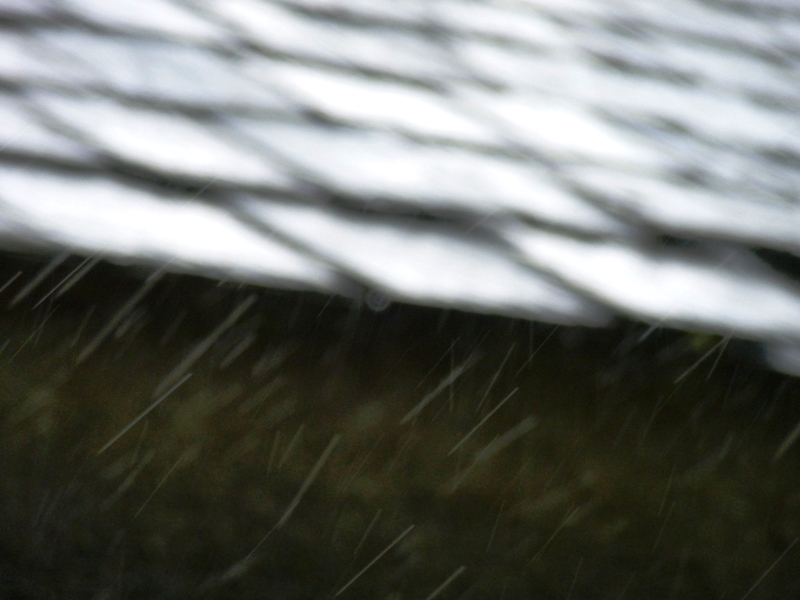 It’s been raining all day but the worst of the wind is scheduled for the night. Later, I stand on the step in the dark, and feel the sharp sprays of rain on my cheek, the wind bouncing around in my ears. I can hear a menacing rumble at the horizon and tree branches are shaking and lashing together. 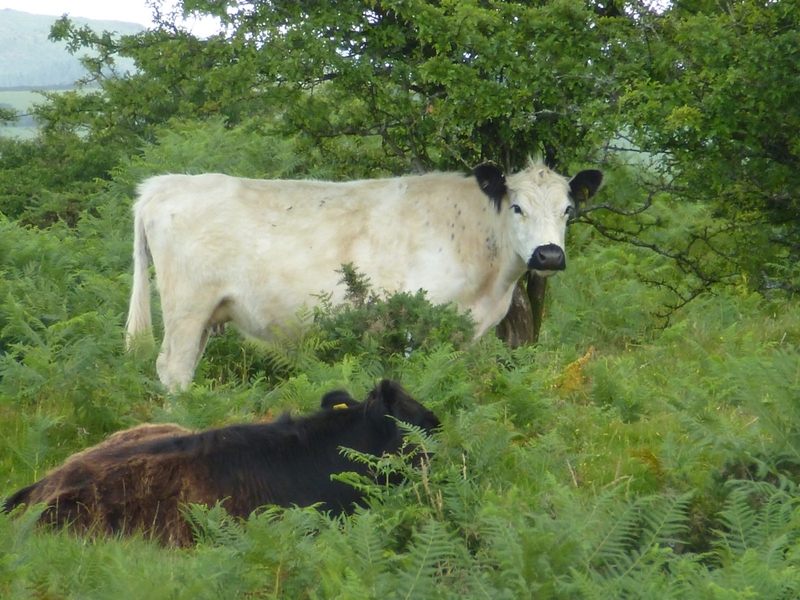 I wonder if the cows are in their shelter and I’m tempted to go over there, but the thought of flying sheets of corrugated iron and tumbling ash branches encourages me to stay put in front of the fire. As it turns out, St Jude is a bit of a damp squib in these parts, a big storm but not a colossal one, and he whirls on through, travelling east, tearing up trees as he goes, in Temple Meads, on Hilly Fields. 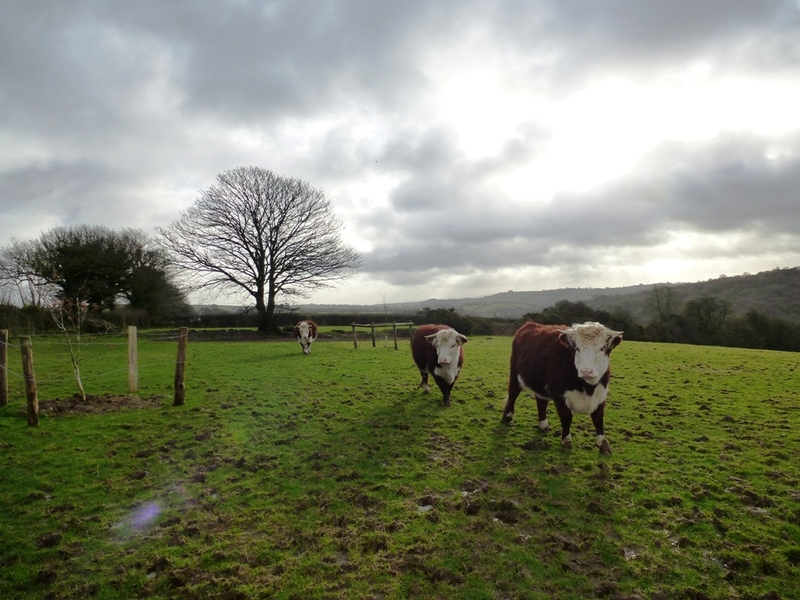 The pigs in the pictures above belong to a friend who leases a 200 acre organic biodynamic farm not far from here – they have recently benefited from the Natural England Higher Level Stewardship scheme and grant which has made life a lot easier. 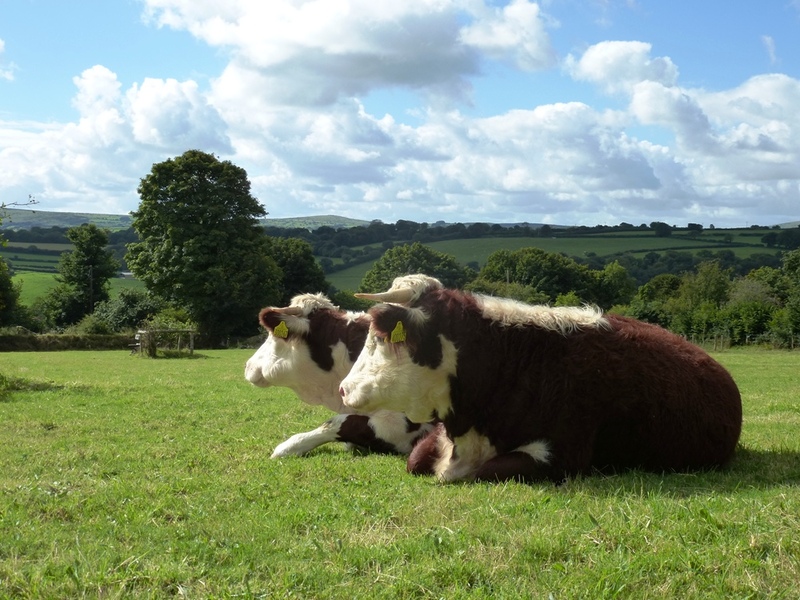 Last year I went on a trip to a farm in Somerset to see some South Devon cattle she was interested in buying. 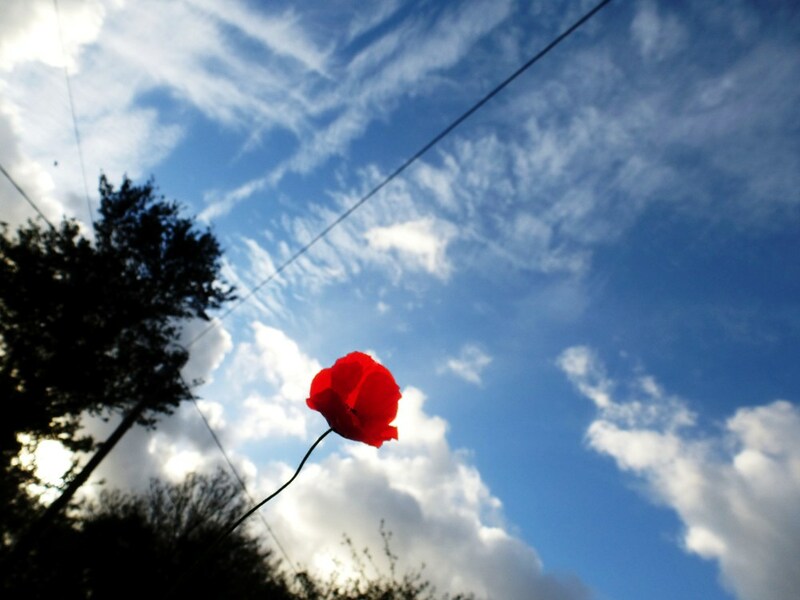 Winter temperatures have arrived despite a lone poppy making a brave stand on the brown roof. Water troughs start their seven month brimming. 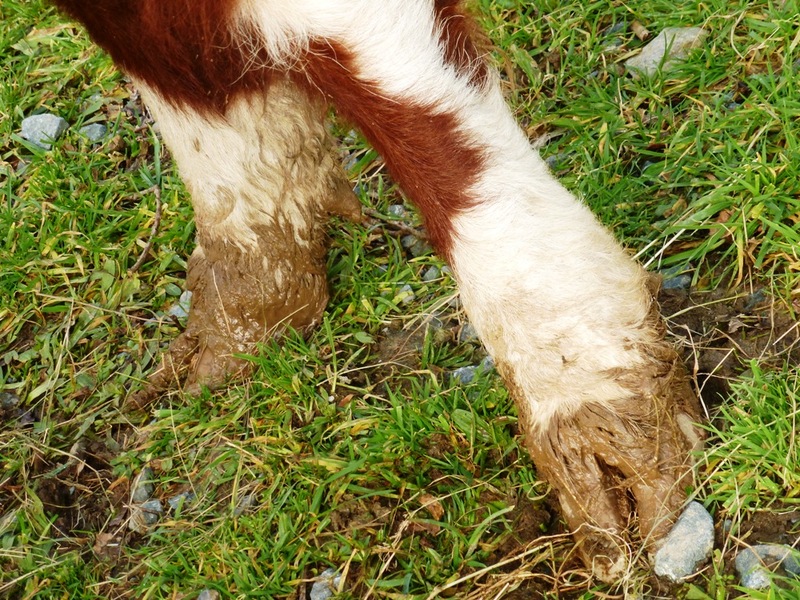 The land has become squelchy and soggy though the pasture still looks fresh. As the leaves fall different views are revealed. 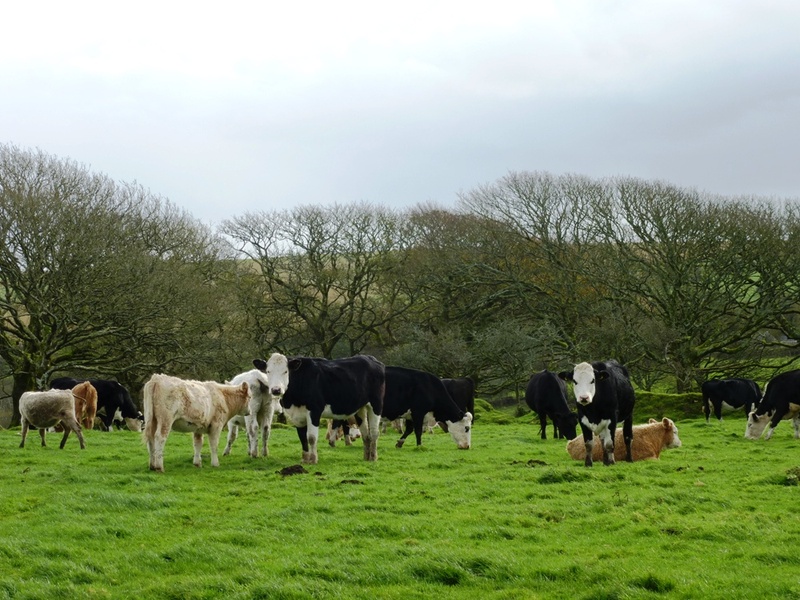 We moved the cows back into the Cow Field and there was sadly very little excitement from them…they just got down to their favourite occupation…eating. 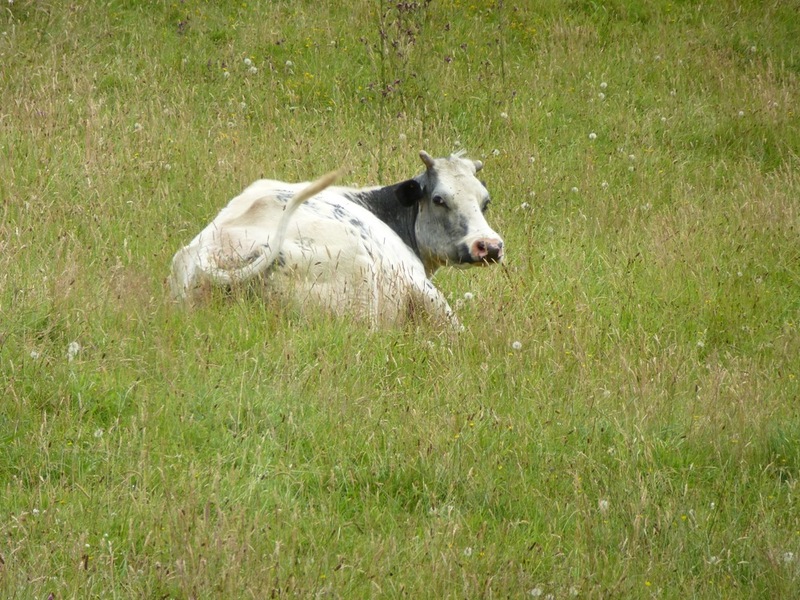 Which just goes to prove that cows are also stimulated by the new and unexpected in the same way we are. Last time they were far more thrilled by their unfamiliar surroundings. 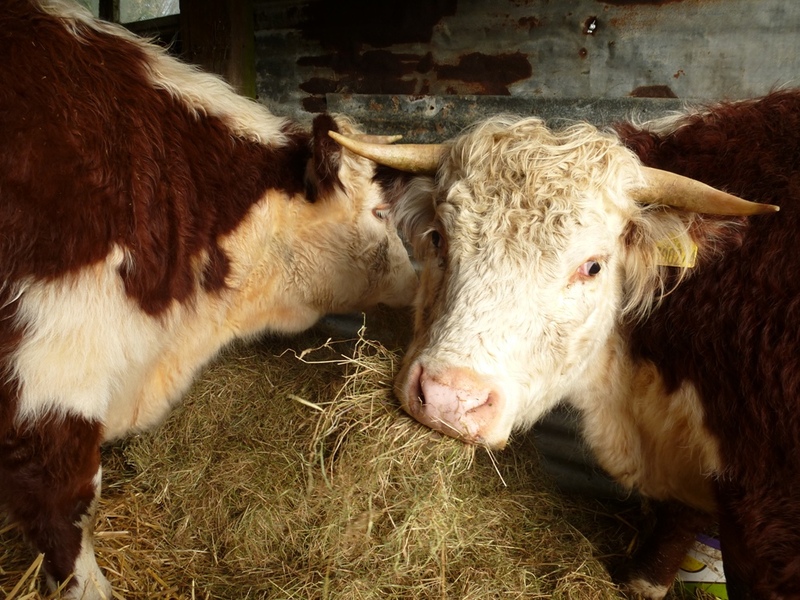 We have started supplementing their diet with some hay which helps them process the wet grass better. 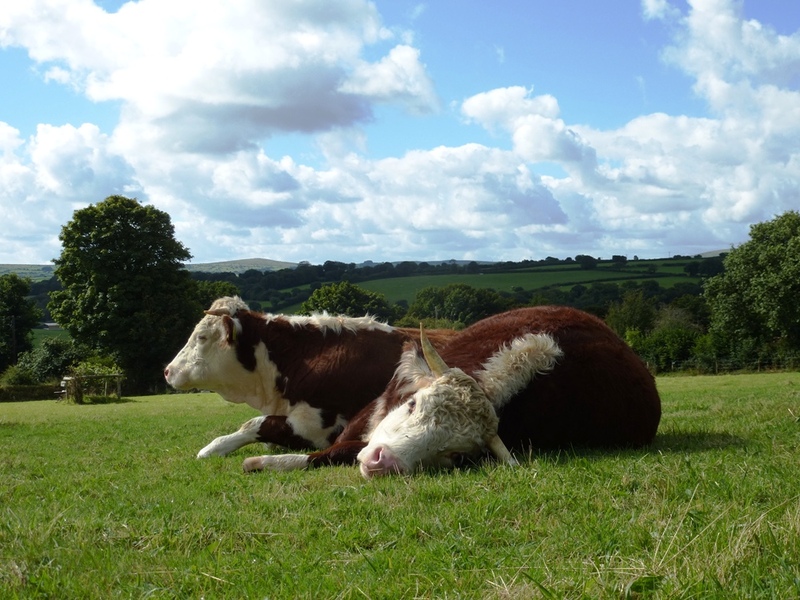 The time has now come for thinking about putting the the cows into calf. They are just over 2 years old. 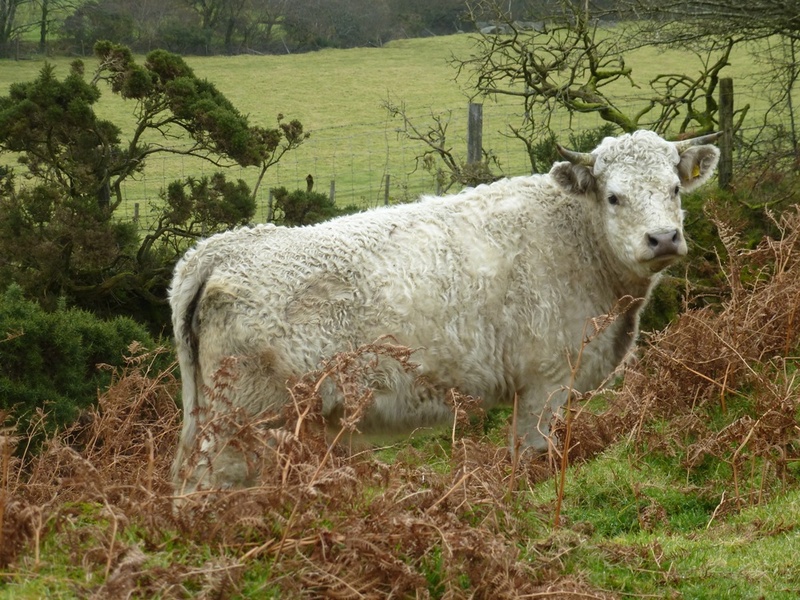 Regular readers will know that we lost our bull earlier this year so we have been thinking about how they are going to get pregnant. These are their pedigree certificates. I like their names, they are stupidly grand – Lower Eaton Ruby 14th, Lower Eaton Ruby 15th and Lower Eaton Amethyst 5th. What about any of the above? I quite liked the look of Freetown Klondyke …. 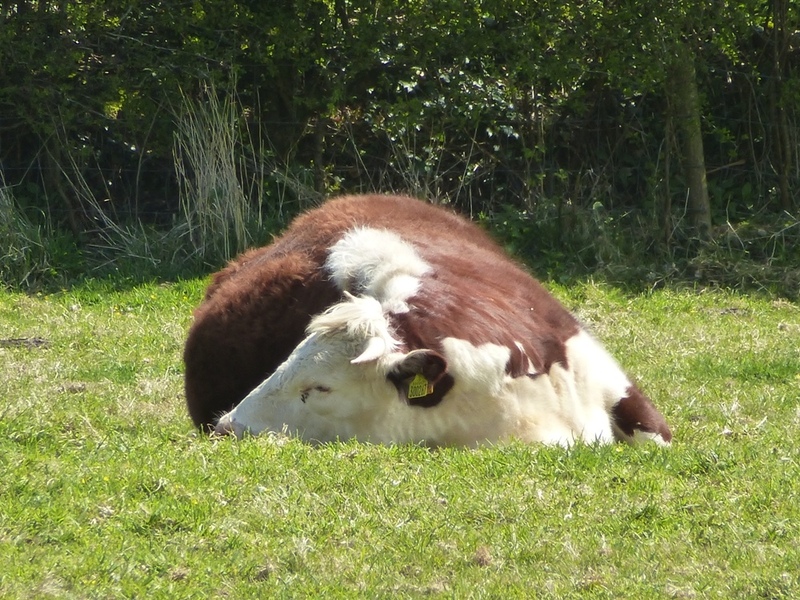 until I had a long conversation with the extremely knowledgeable P from the Traditional Hereford Society who seemed to be able to recall the names of all the bulls going back to the 1960’s. 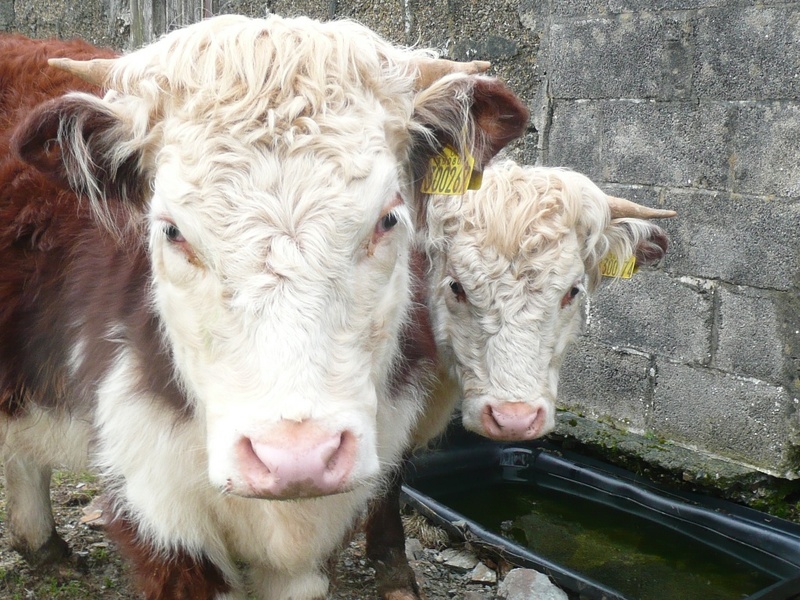 He put the names of the girls into his computer and the clever software tells him which would be the most suitable donors…as there are only a relatively small number of the breed it is important to expand the bloodlines. Ours come from the Silver family apparently, the biggest. These are the names of the bulls which we should select from. 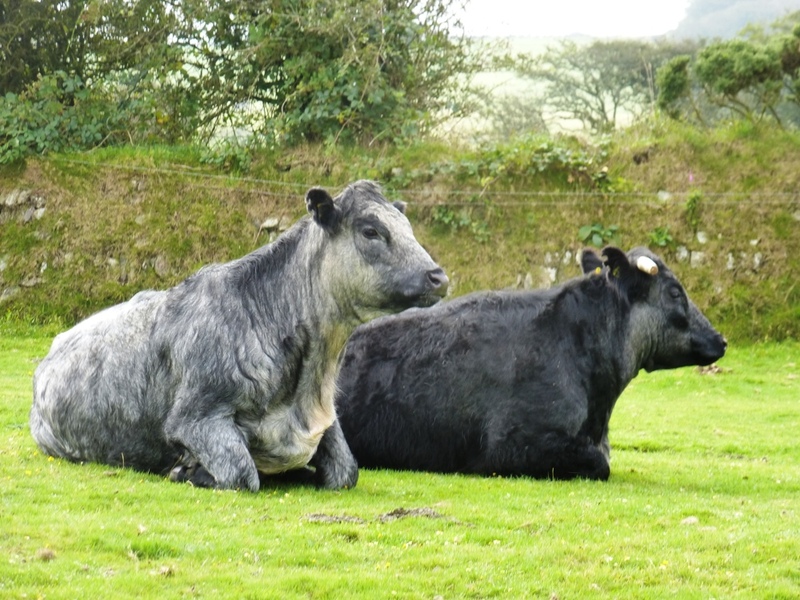 There are others but they are reserved for breed improvement on a commercial scale. 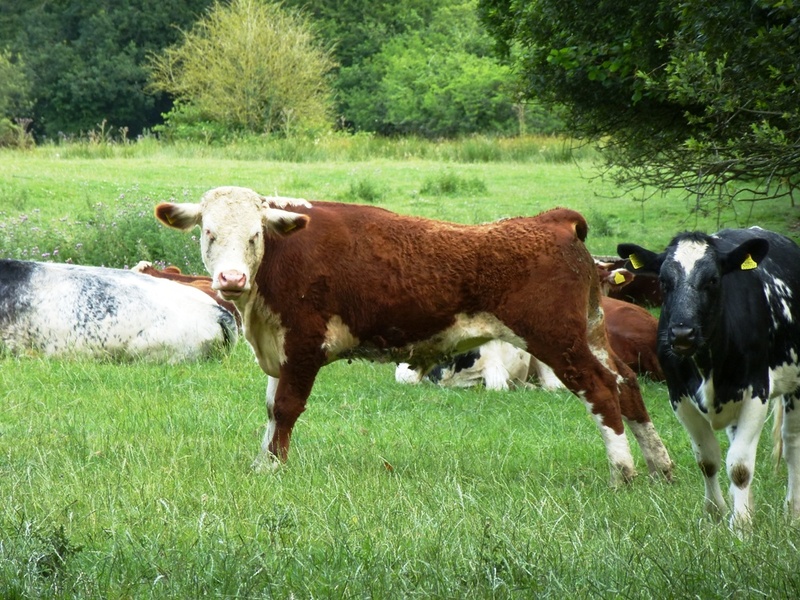 He also advised that the best time for them to calve is in February because on our rich pasture it is difficult to keep them lean enough to calve easily in the growing season. (What, the girls, fat?!) 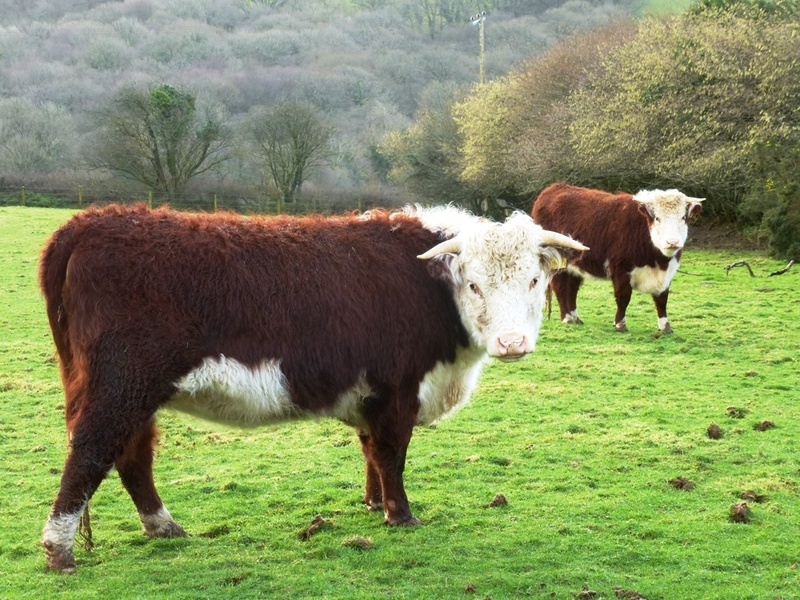 I had heard this before and it is true that they do get extremely rotund on grass – one of the main reasons they are cherished as a beef breed because they require so little input. So we have decided to wait until next May to do the AI. I love the softness of the autumn days, misty and strange. And this fine fellow, also of brown. A bowl of plums stands on the kitchen table, ripening one at a time. It’s been a good year for fruit. Though I felt for the cherry farmer who’s crop ripened all at the same time because of the July heatwave. To grow them reliably in this country the trees have to be tented to protect them from … too much rain, too little sun, too much sun… and of course the wind. Gone are the days of thirty foot trees and tapering high ladders. These cherries are grafted onto a small rootstock. The huge investment has been made and it’s thirty miles of tenting which has to be raised or lowered according to need. The farmer and his workers are lean. This September morning I will loop the bounds, walking out around the three and a half acres which encircle us. 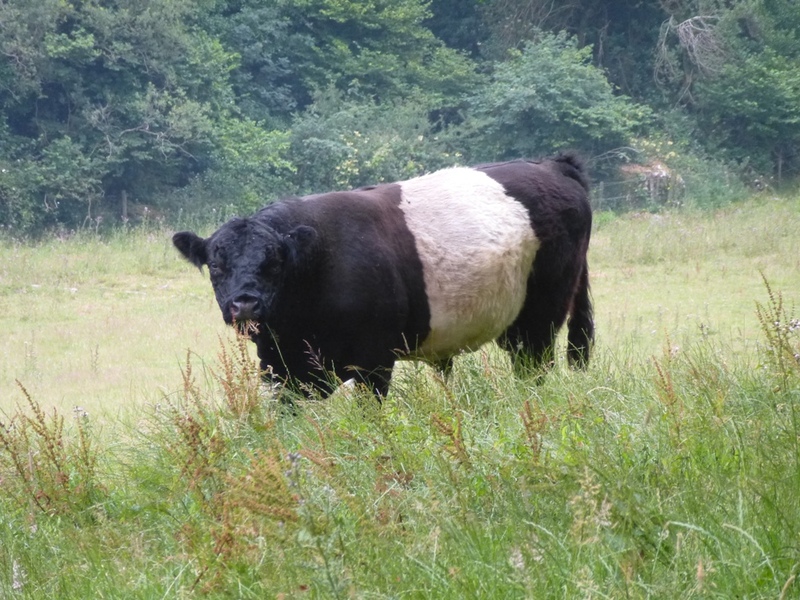 I step into the front yard and survey the slight devastation which the cows have wreaked on the galvanised trough planted with Black Scabious , Orange Cosmos and Cornflowers. 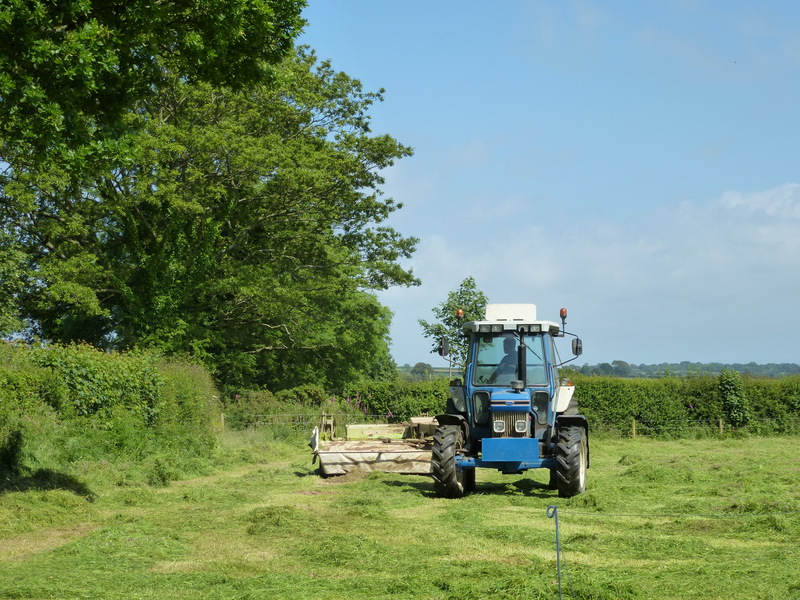 We moved the cows into the field behind the house after the hay was finally cut and baled in August (another 280 bales, distributed between us and others). This was their first visit and they were suitably excited. 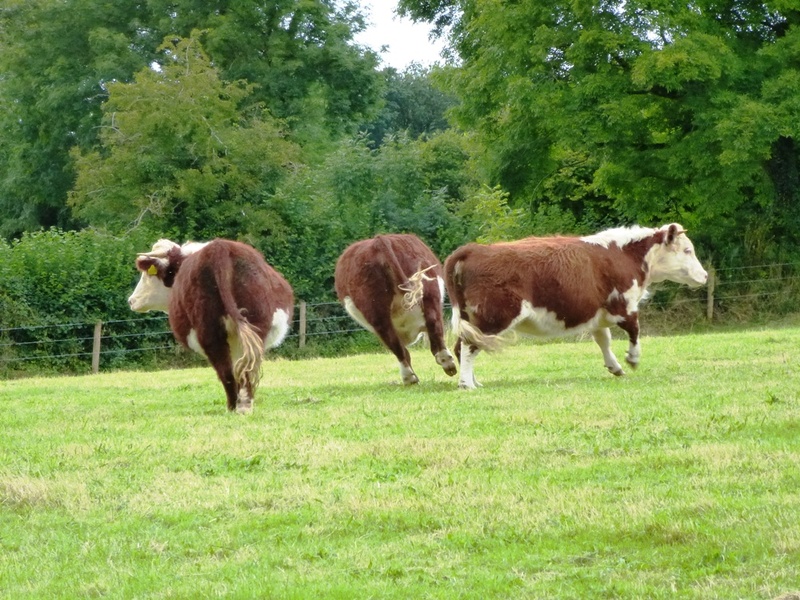 We put them in here to forage as they were getting a little rotund in the cow field. Now they seem to be lying down a lot, like it’s all a bit exhausting. 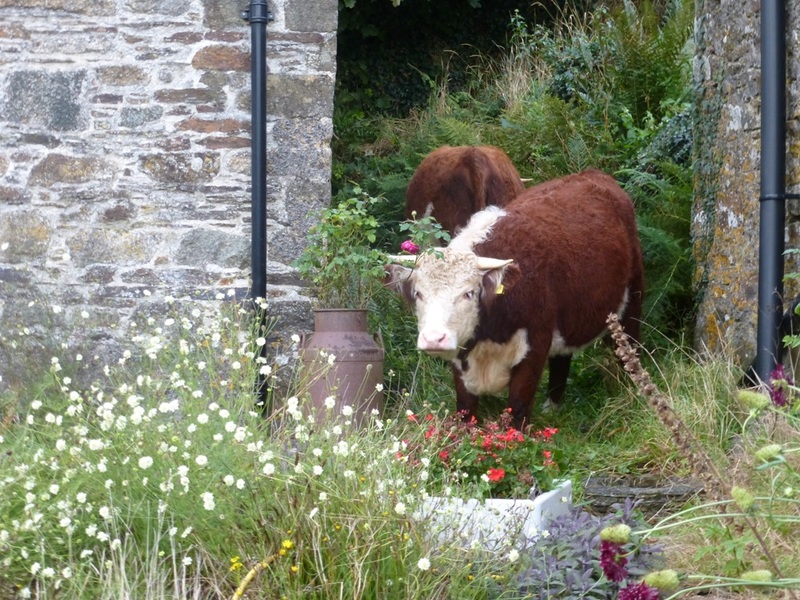 We cleared out the ground floor of the shippen so they have some undercover quarters should it take their fancy, but this entails them traversing the front yard, a cow free zone up til now, and hence the predation on my flowers. But I have always imagined them using the shippen just like our predecessor Mr. Creeper did. 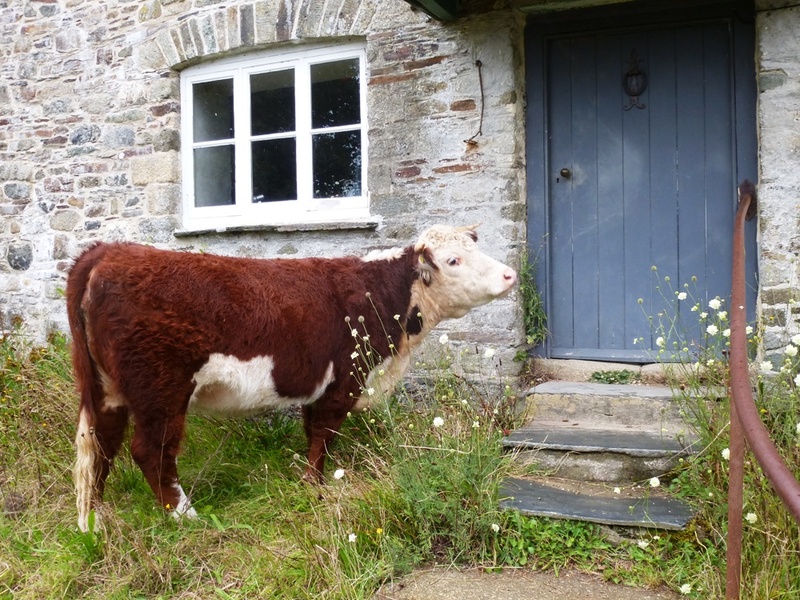 His cows used to come in the front door. We’re working on it. I carry on. 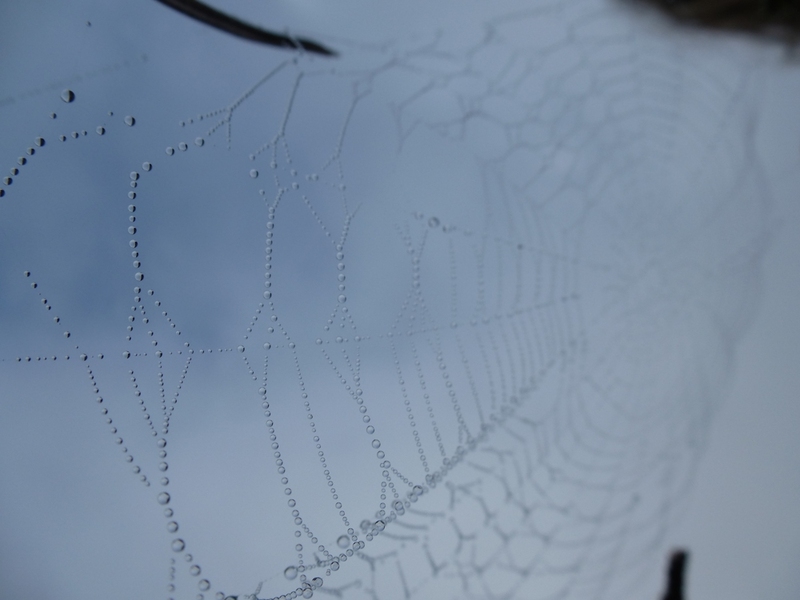 Astonishing worlds of spiders webs are draped in the damp stalks. A wren rat-tat-tats from the front hedgerow where the young Elms are, descendants of the huge trees which once stood here and gave this place locally the name ‘the Elms’. Let’s hope the Ash doesn’t suffer the same fate. 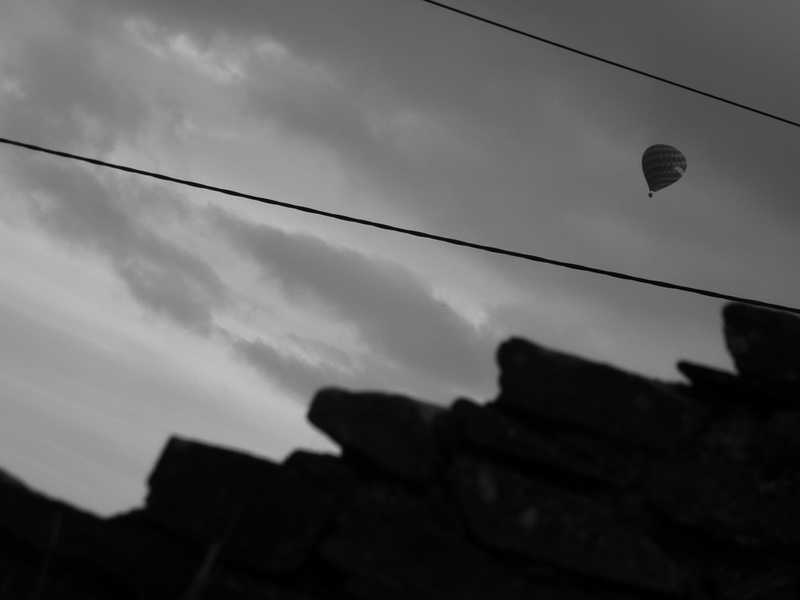 I can hear a plane, our neighbour crunches across the gravel and tinkers with something in the shed and a nuthatch barks from the phone wire, perhaps already staking a claim on a stony hole. The swallows are still here, flying high in the sky, clicking and wheeling. 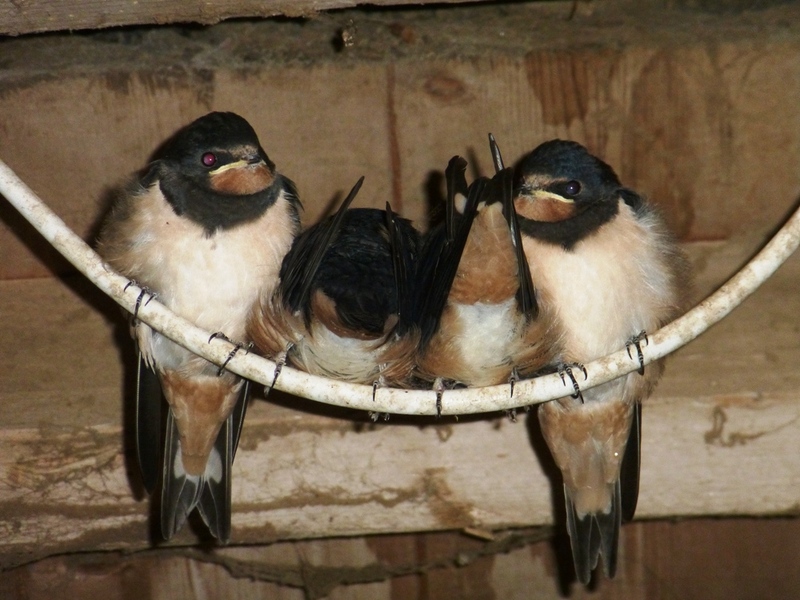 Although some kind of catastrophe befell our only pair I was pleased to catch some young fledglings over at T & N’s place when I went to visit the new calf. 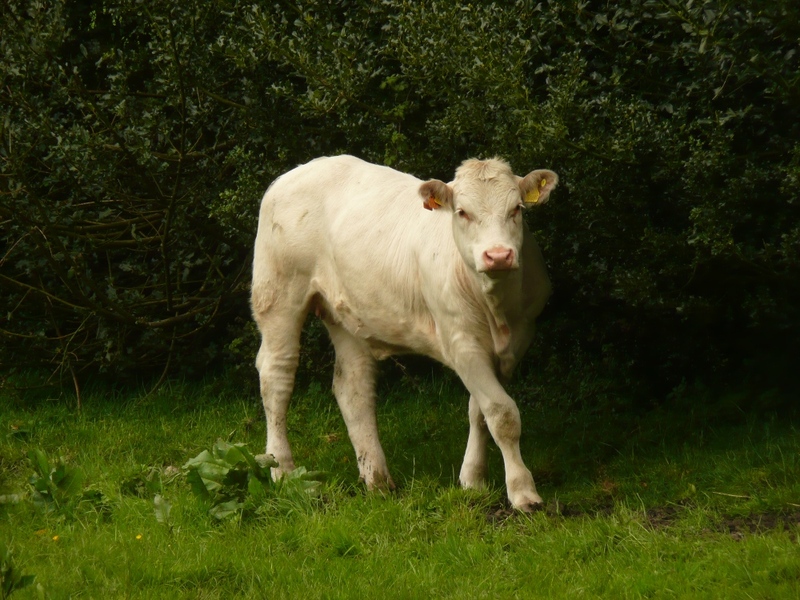 New calf? I hear you say. Yes! 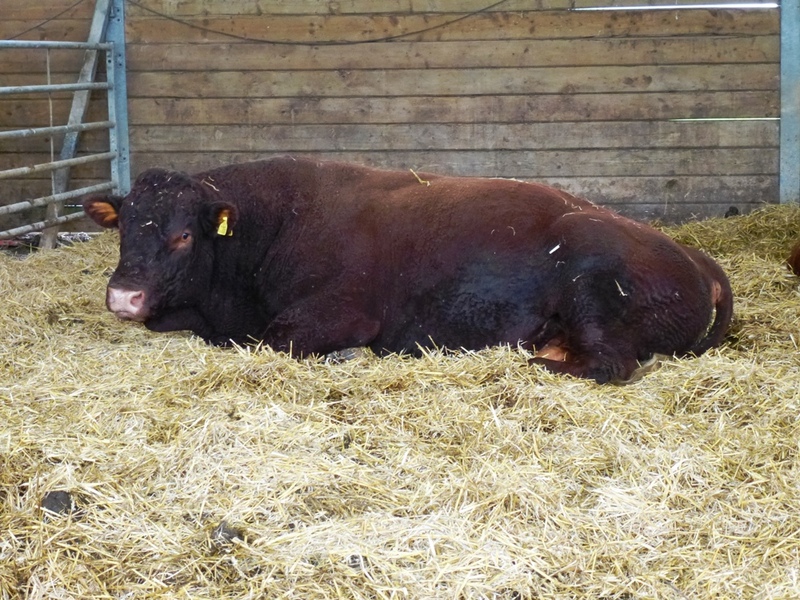 Born only a few weeks ago to T & N’s Hollyhock this little heifer was sired by Herald, who, for those that don’t already know, was our shared bull who we had to have culled earlier this year due to Johnes disease. Luckily the disease is not passed onto calves in this way. 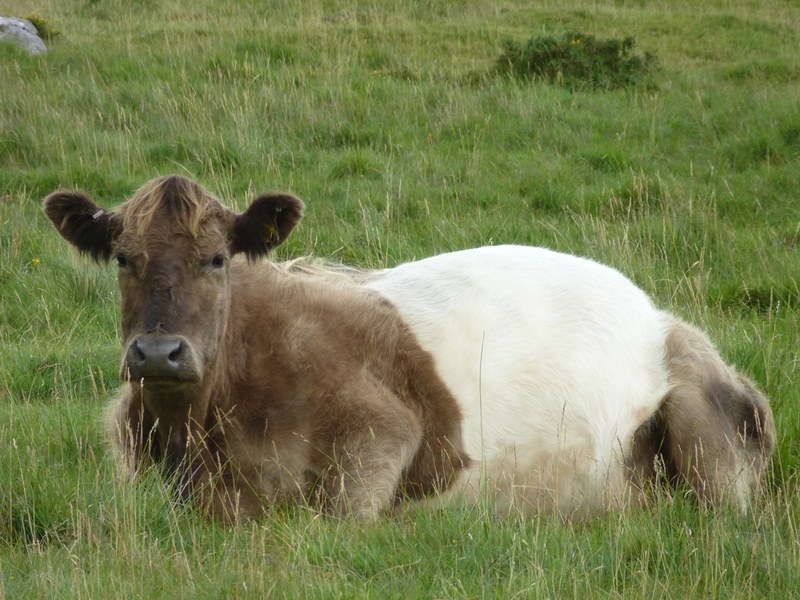 This is Hollyhock’s first calf and she did splendidly. 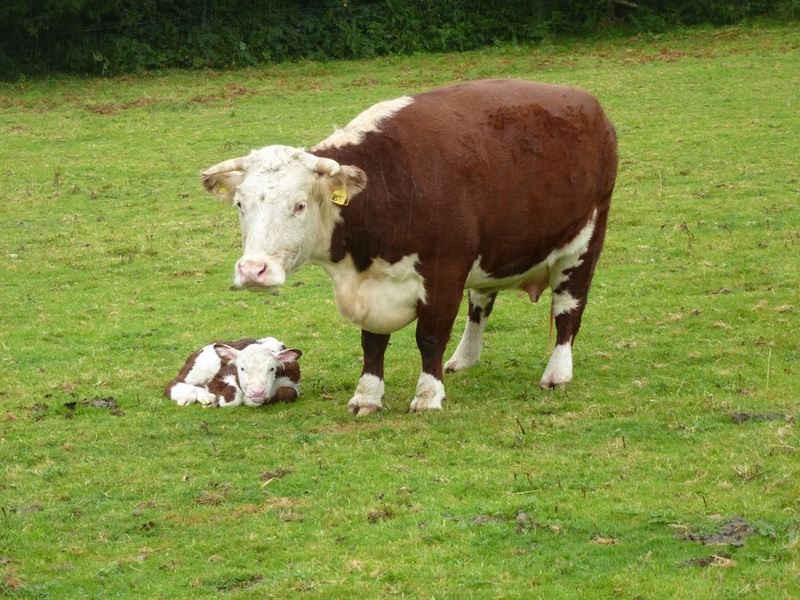 I missed the actual birth but arrived a couple of hours later and she let us approach quite close and only the next day allowed T to pick the calf up and move her indoors. Well done Hollyhock. A wood pigeon is cooing high in the canopy and I can hear the jackdaws calling and cackling, landing and then swooping low over the field. The sun is warming things up and a tortoiseshell butterfly is spread out on the ground on some small stones then moves to a post. The Purple Knapweed has gone over, hard black seed heads silhouetted like little soldiers. A few bees are still buzzing around late flowers and the Goat Willow which has self seeded in the front of the house has been stripped of its leaves by the cows. 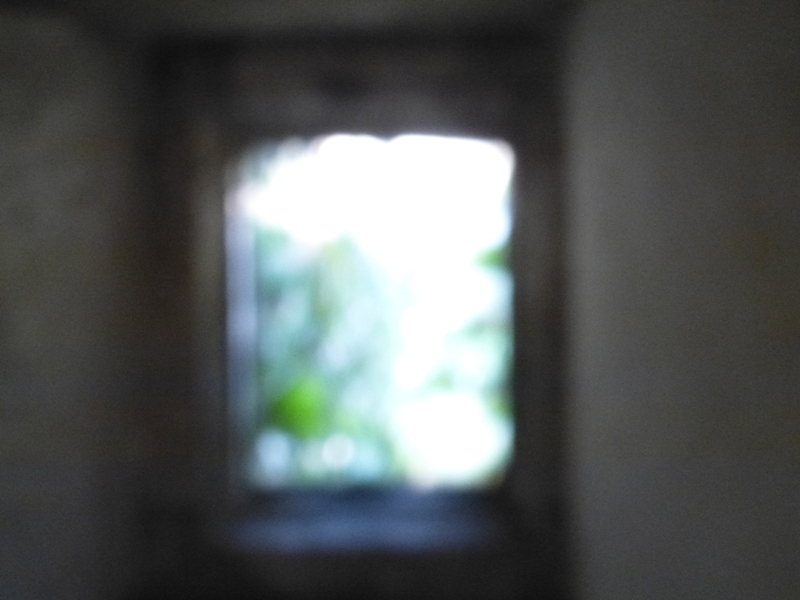 I go through a gate into the garden, a development project which is still at the thinking stage for the moment. The apple tree is weighted by both fruit and time, this one planted many years ago, it’s flattened profile telling of an espaliered moment. 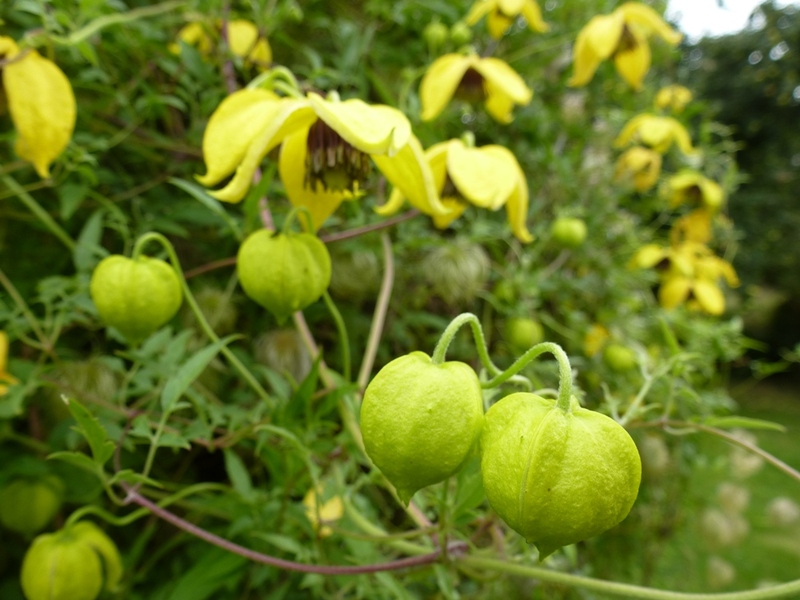 Bill Mackenzie, a yellow clematis, is curled around the swing seat supplying a nectar filling station for late honeybees. It’s whiskery whorls mingle with the bright sepals. One side of the garden boundary is the stone wall of the barn. In front of this are the collapsing stems of Wild Carrot, Yarrow, Woundwort, Deadnettle, Ragged Robin and Meadow Cranesbill. Windfalls stud the grass. Leaving the garden I move on into the new orchard, part of the back field. Here we have the compost heap and the polytunnel. 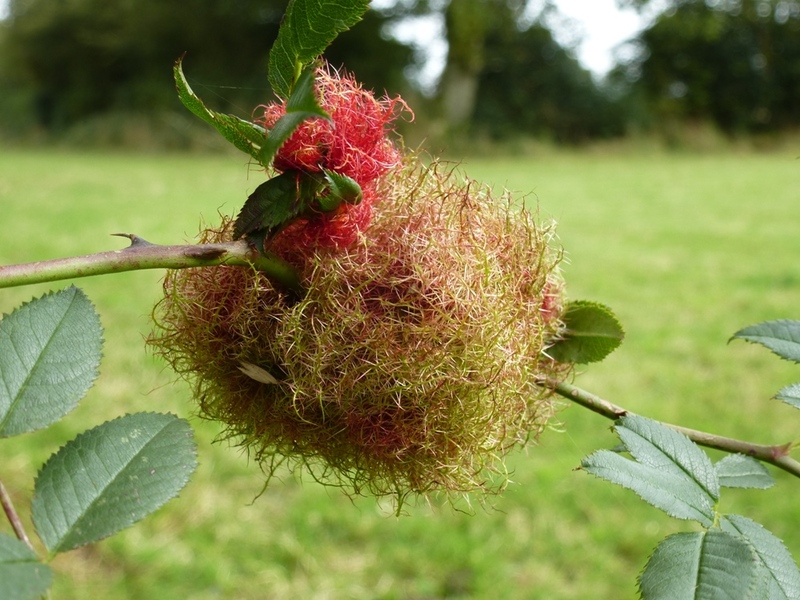 The trees are still young and have been slow to get established because of the wind but they are just beginning to produce a small amount of fruit. Sadly, a flurry of anticipation for a few pears was hijacked by a splitting event and then a wasp feeding frenzy. 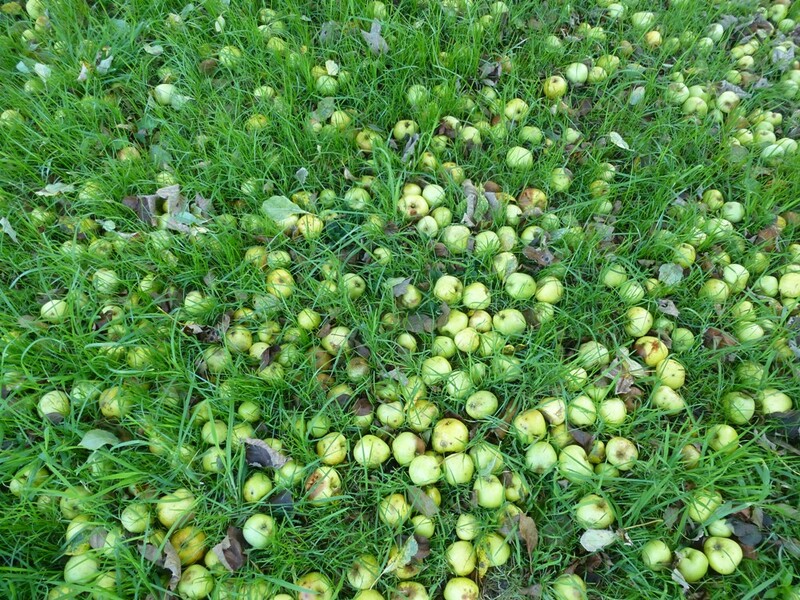 Empty husks of pears floated to the ground like lanterns. Sigh. 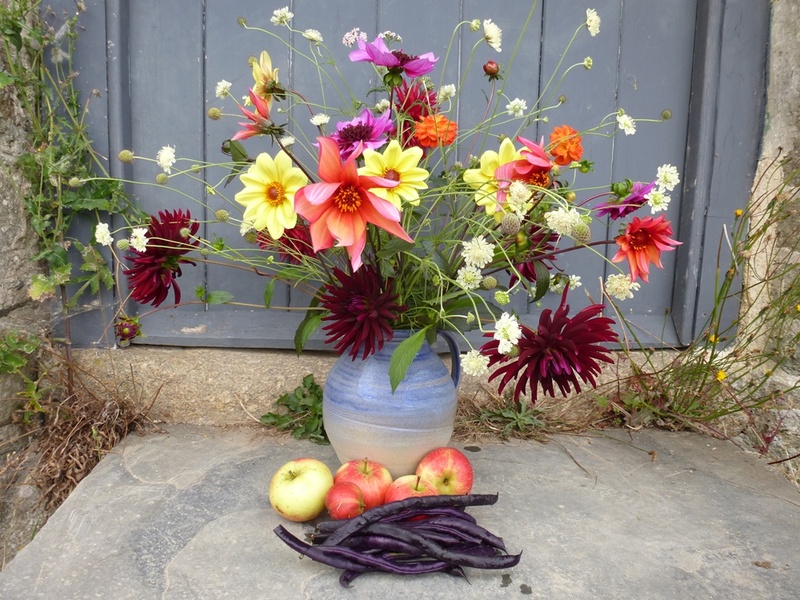 The Dahlias did well though and they’re still going strong in the polytunnel. The hedgebank here is full of Wood Avens, Foxglove and Bramble. The leathery straps of the Harts Tongue Fern are still green, feet-deep in between the stones and the one time feathery upstanding grasses; of Foxtail, Bent and Yorkshire Fog, are breaking up and bending down. 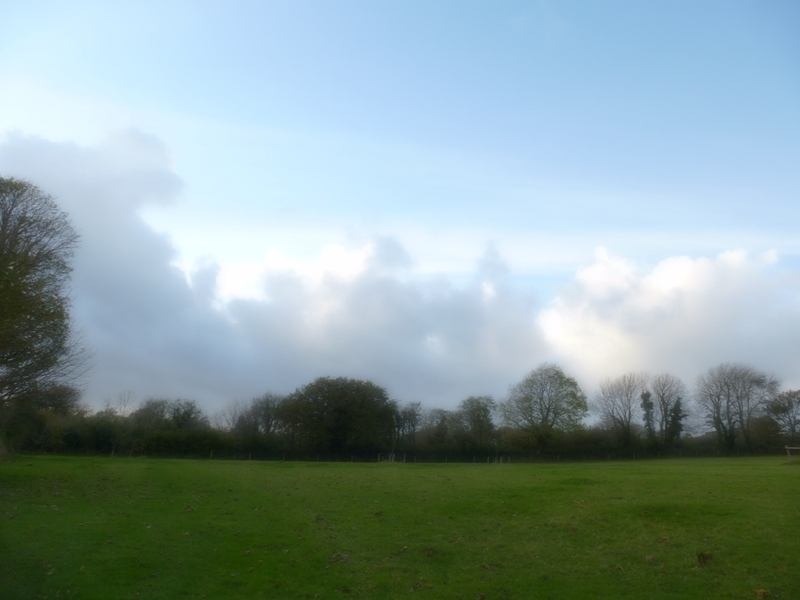 I can see the cows coming down this way as my footsteps make a squeaky sound on the wet grass. 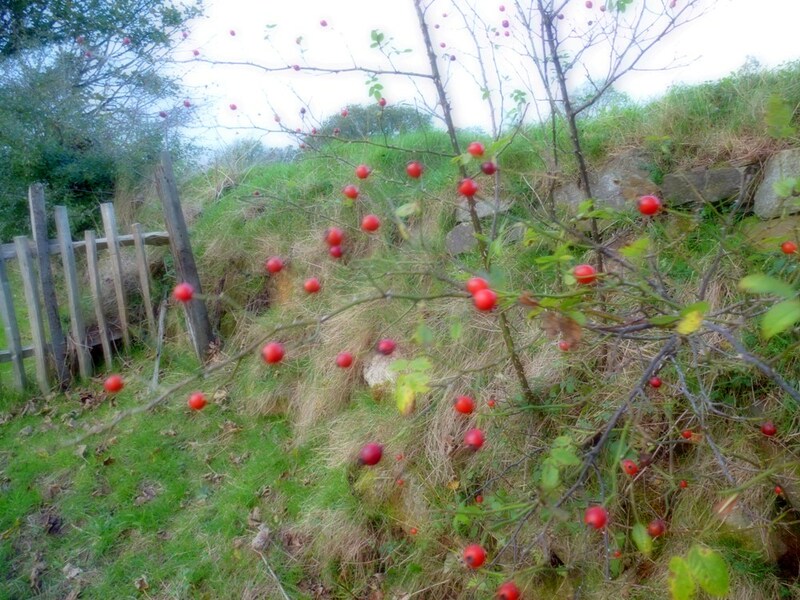 Walking up the field, the hedgerow is a jumble of Bramble, Hawthorn, Hazel, Ladys Bedstraw and Dogrose. 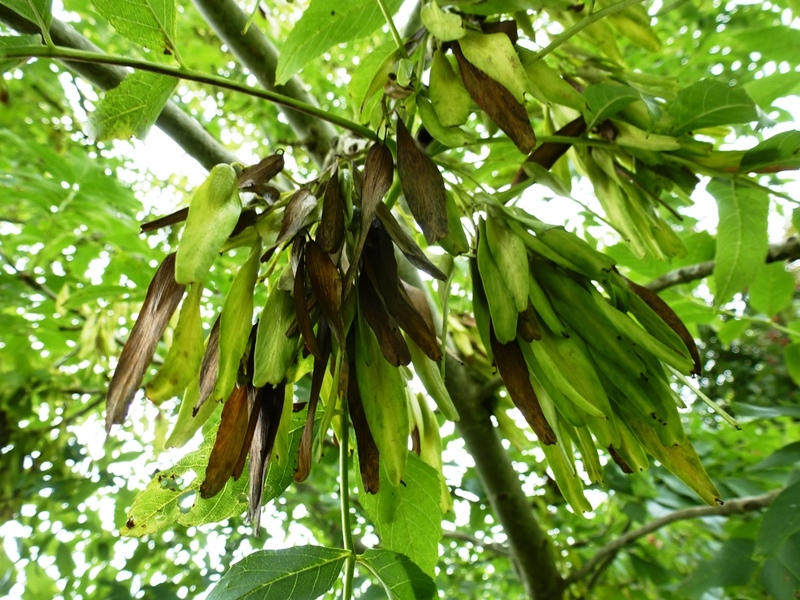 A young Ash which we’ve allowed to grow away is now fifteen feet, heavy with ash keys drooping like pea pods. A glossy compact Holly nestles comfortably, belonging in its place, and on the bank a plethora of next years Red Campion seedlings jostle one another in a thick bloom. 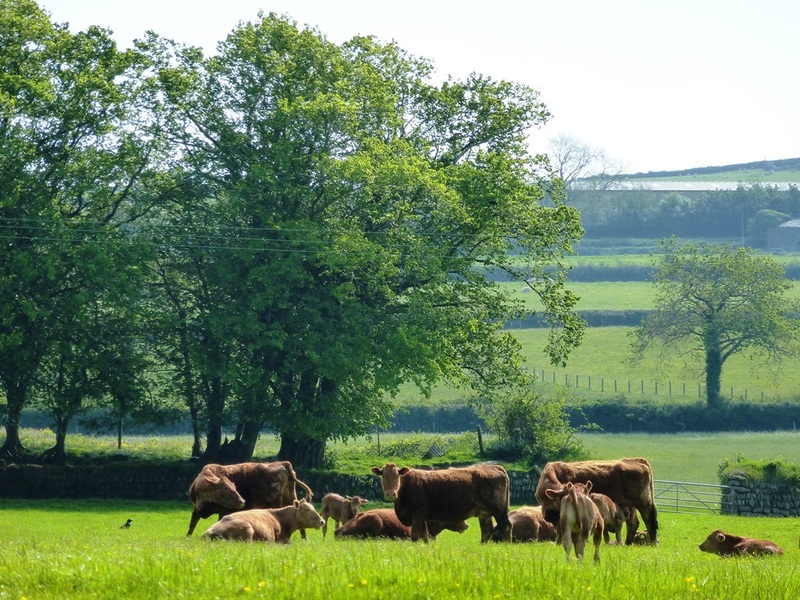 I duck under the electric fence which divides the field from the orchard and behind the birdsong I hear the rumble of traffic up on the top road a mile away. 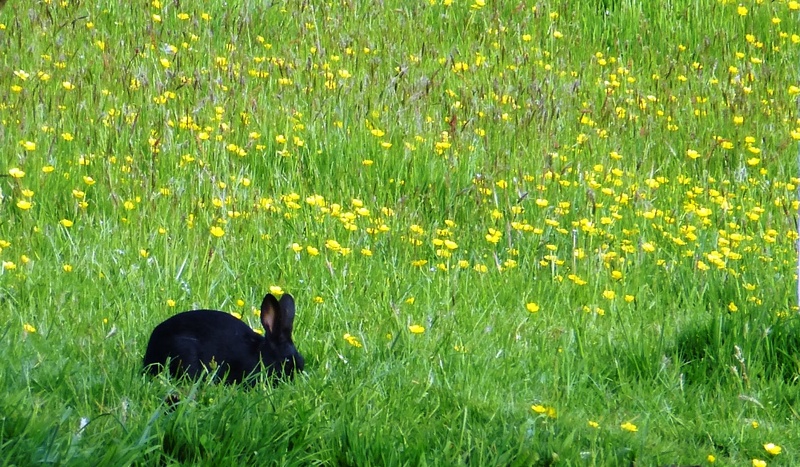 Rabbits have been making new holes as this years’ youngsters claim new territory. The blackberries are fat, dark and shiny, really black. They remind me of my grandparents in Kent and how we used to go out blackberrying and my grandmother would make blackberry and apple pudding or crumble. They loved their damsons too and told us stories of picking fruit during the war years. We are not the only ones who like the berries, flies are also fond. Bluebottle, Greenbottle, Horsefly, Dungfly, Biteyfly and a black one with tawny down trousers. A crow caws from neighbouring airspace, the woodpigeon coos again. On the reddy-orange hips of the Dogrose I find a peculiar growth. Ivy wraps itself closely around the branches of a leaning hawthorn, a twiny embrace. Tiny green nodules are just beginning to show in clusters, when they turn black it will be a winter feast for the birds. 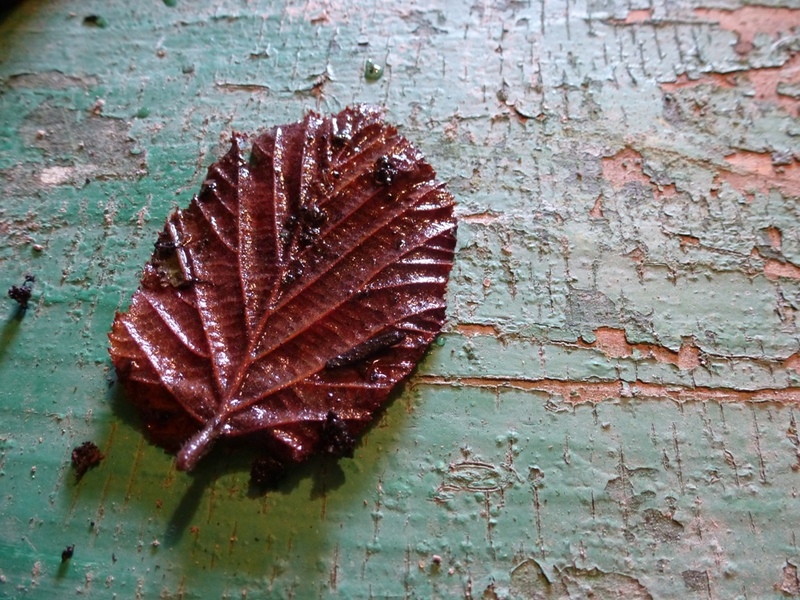 Bramble leaves are just going over; red,orange, bright green and yellow. I walk up the finger of land, rising all the time. 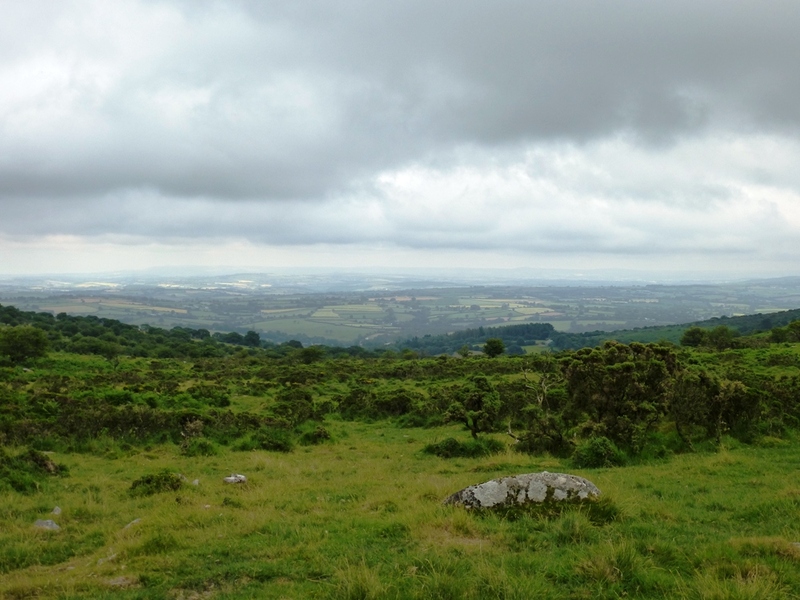 I look back to the moor, there is a heavy grey cloud squatting on top of a misty tor, while in the foreground small sloping fields criss crossed with hedges hug the contours of the land. 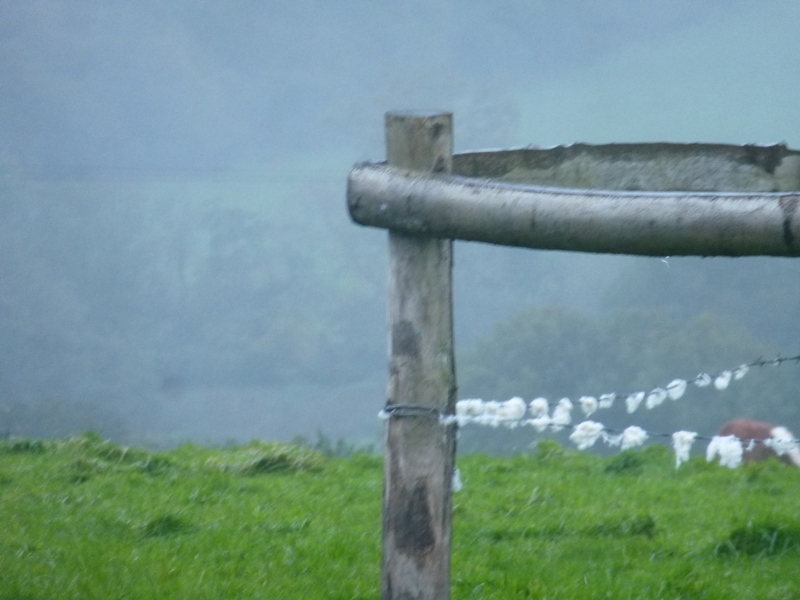 A flock of sheep pour into a waist thinning gateway, then spill out again, like an egg timer. As part of the ongoing hedgerow restoration project we released a Holly from the thickets of Hazel a couple of winters ago. It is now is shooting strongly from the trunk where the light has been let in while some young Oaks have a chance to get away. 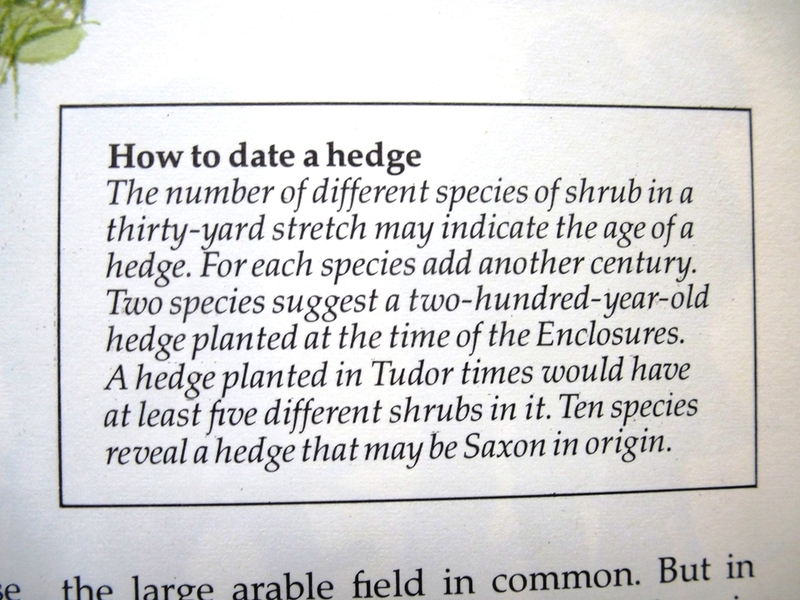 The idea is to have mostly hedge, with larger trees at intervals. 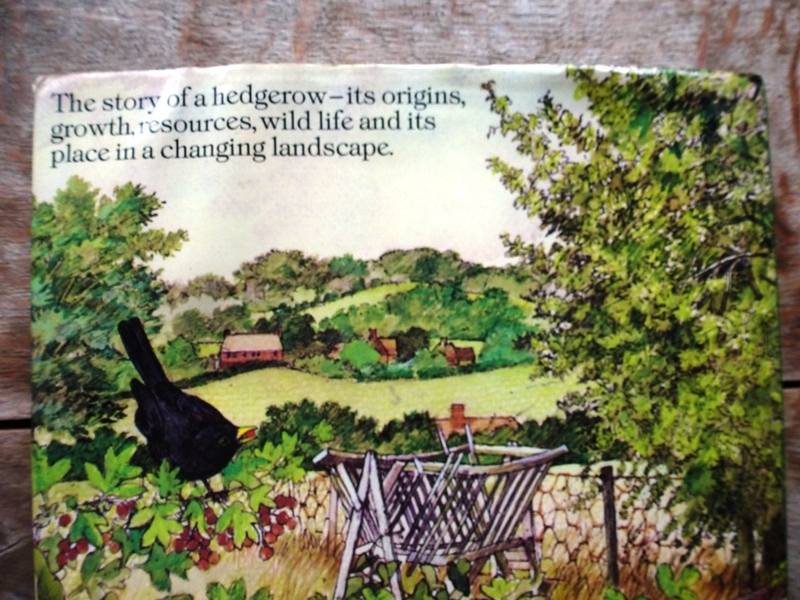 Hedgerows are invaluable for wildlife and it is part of the conservation here on the farm. It’s one of the reasons we get the Environmental Stewardship subsidy. 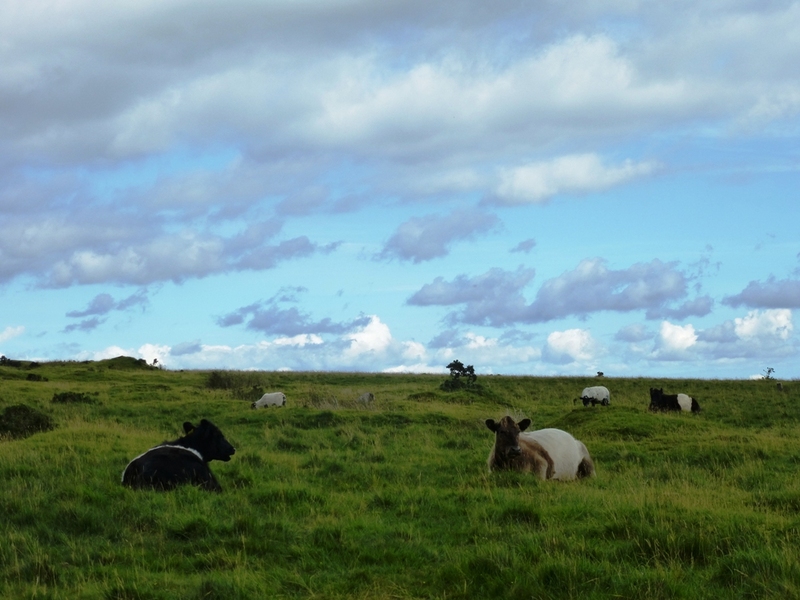 I reach the top of the finger and beyond the gate is a bright green field with black and white dairy cows lying down. 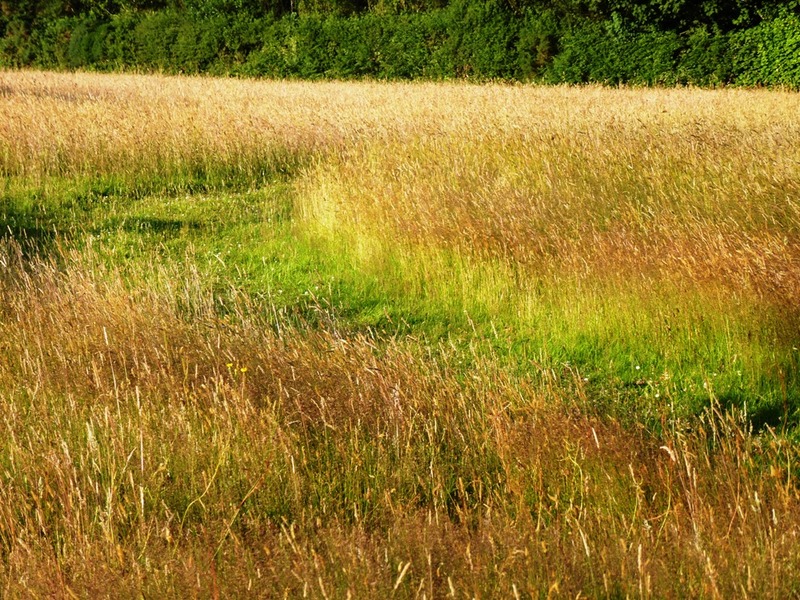 It looks attractive in a clean kind of way but this kind of pasture is what conservationists might call a ‘green desert’, a monoculture landscape devoid of biodiversity. 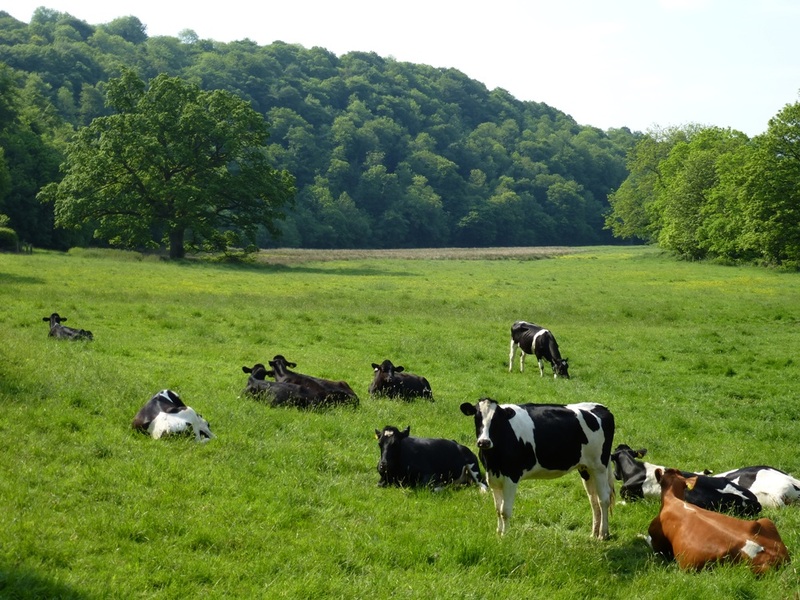 The cows look young; this is the less intensive part of their lives, before they are pressed into service to provide us with a constant source of cheap milk. 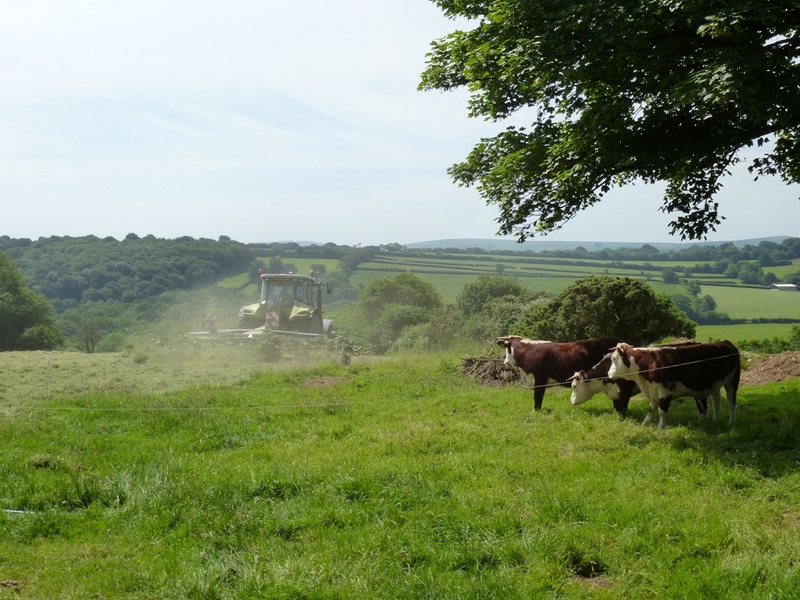 This demand makes dairy cows the hardest working animals in farming with the squeezed farmers needing to monopolise every square inch of land into production. 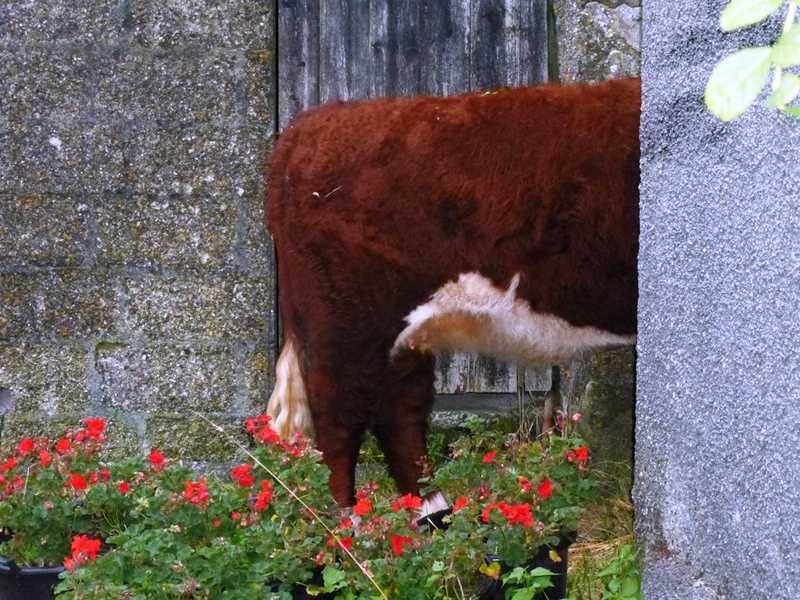 No such luck for a dairy cow to enjoy her calf like Hollyhock. They will be separated when they are only two days old. When I start to think about it, it doesn’t sound good. 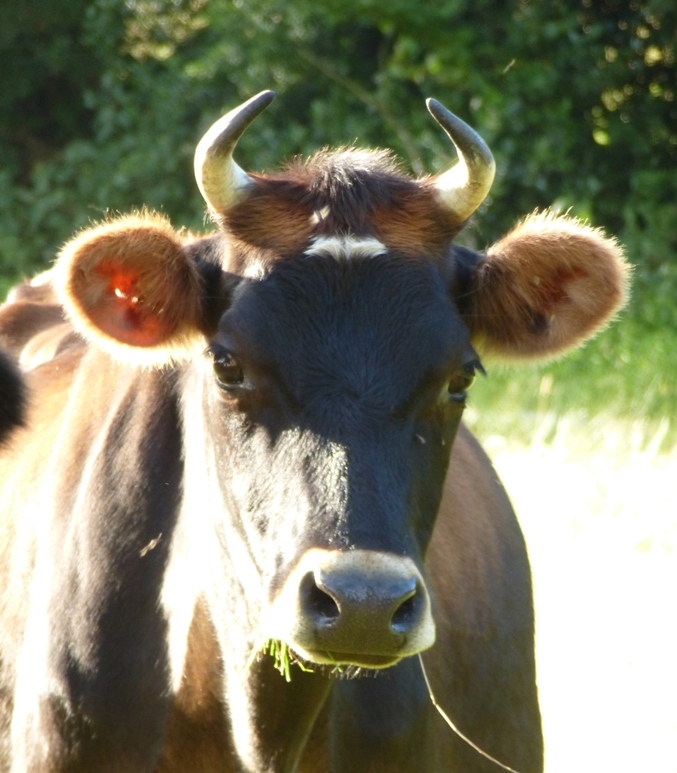 Apparently, in the UK, the average working lifespan of a dairy cow is around four lactations (milk-producing periods), and hence many dairy cows are culled when they are relatively young. 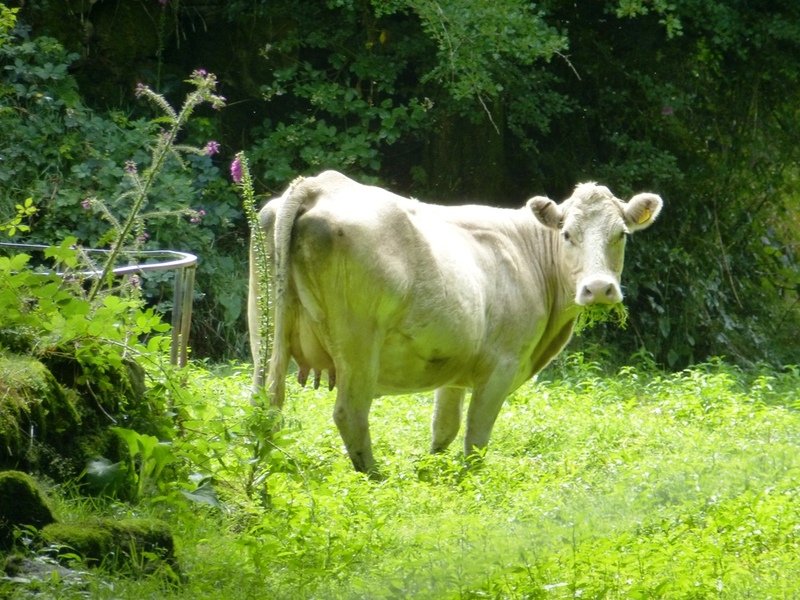 On the plus side, at least the RSPCA, along with some other organisations are working together to campaign for higher welfare standards for European dairy cows and we as consumers can help by looking for either the Freedom Foods labelling, or failing that, organic. I then experience what a lot of people do – a concern which is ignited and then changes into a feeling of general overwhelm at the enormity of the task. So, as I pass a beautiful mature Ash, I look up into its branches and get lost. But I will do what I can. It’s an ongoing process. I come to the outward facing corner on the east of the finger and here is a large Oak with a really nice big bulbous base which a strand of rusty barbed wire running through it which the bark has swallowed in a ripple. 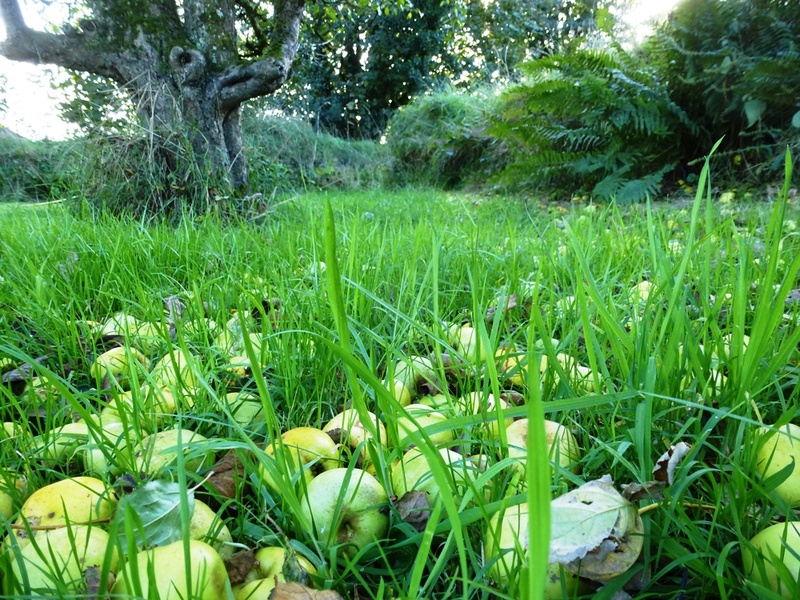 The acorns have begun to fall, they are fresh green at the moment, cupped in knobbly cradles with a perky stalk. From here the big Sycamore behind the house is just getting a coating of rust. I turn into the last stretch back down towards the house. I sit down by Lucy who doesn’t mind me at all and see a tiny ladybird crawling along a stem of grass. 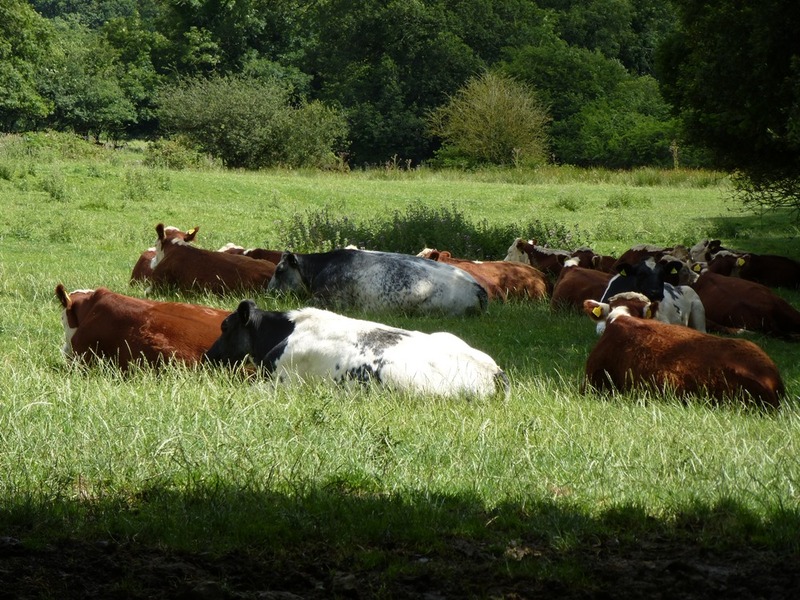 The cows are lounging by what we hope one day will be a pasture woodland – not in our lifetime of course, but in a hundred years it might look pretty good. 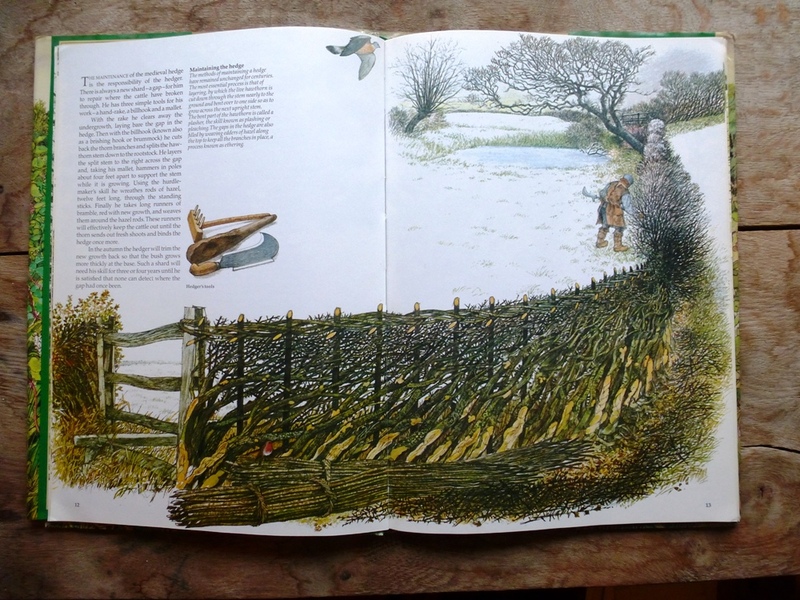 The thicket of Holly and Hazel at the gate is full of chirping birds. The Nightshade is heavy with berries and the Hazel is already forming catkins. 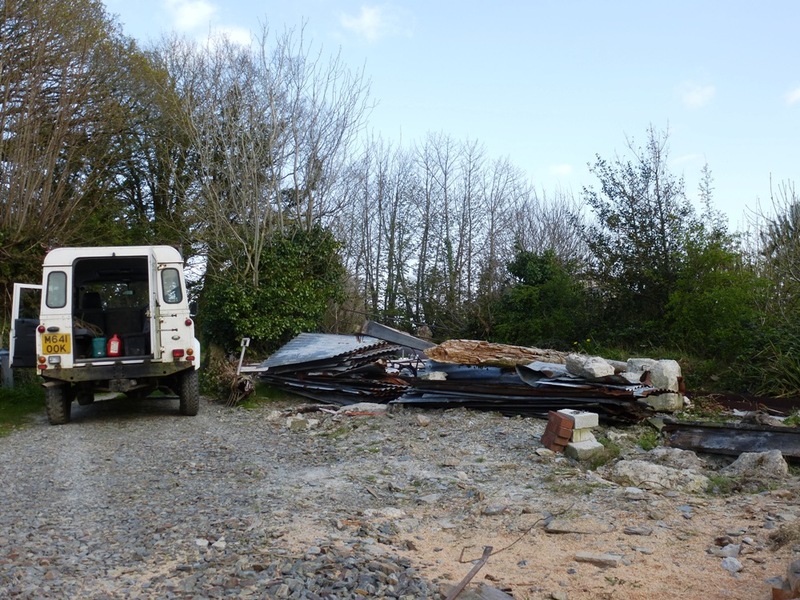 This is the spot where we had our temporary home, the straw bale house with caravan attached. You’d never know anything was ever there now, just a few months and the only sign is the blue plastic standpipe now lying in the grass. 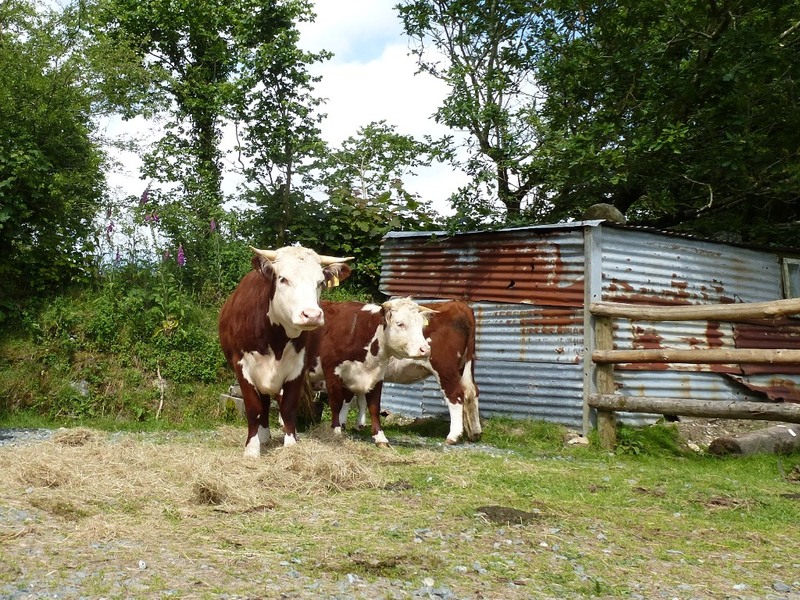 My last stop is the upper floor of the shippen, now satisfyingly full of the straw we saved from the balehouse which now gives the cows their bedding (which they also sometimes eat, incomprehensibly). Oh and all those things destined for a car boot sale. September is also a month of beautiful skies. Here are some of them. The following poem is by Theodore Roethke. Of those so close behind me, which are you? 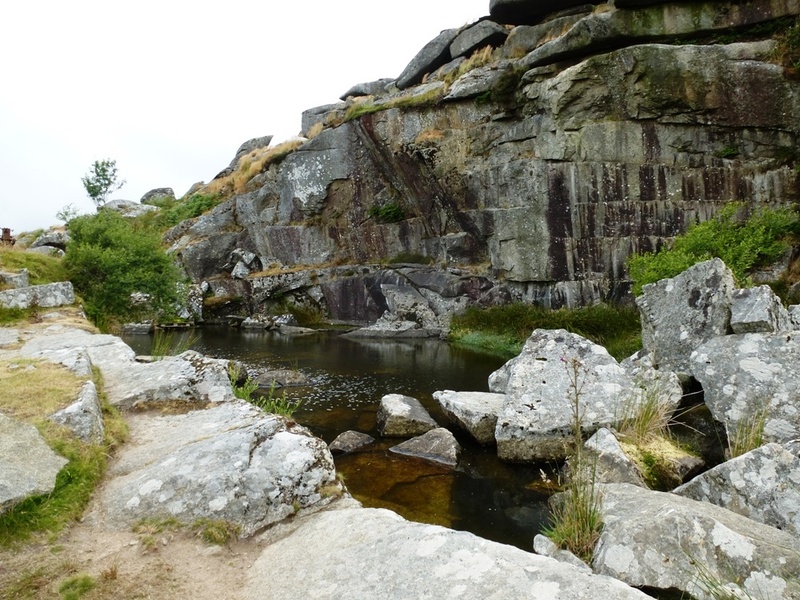 The quest to find all the beautiful swimming spots on the moor continues. 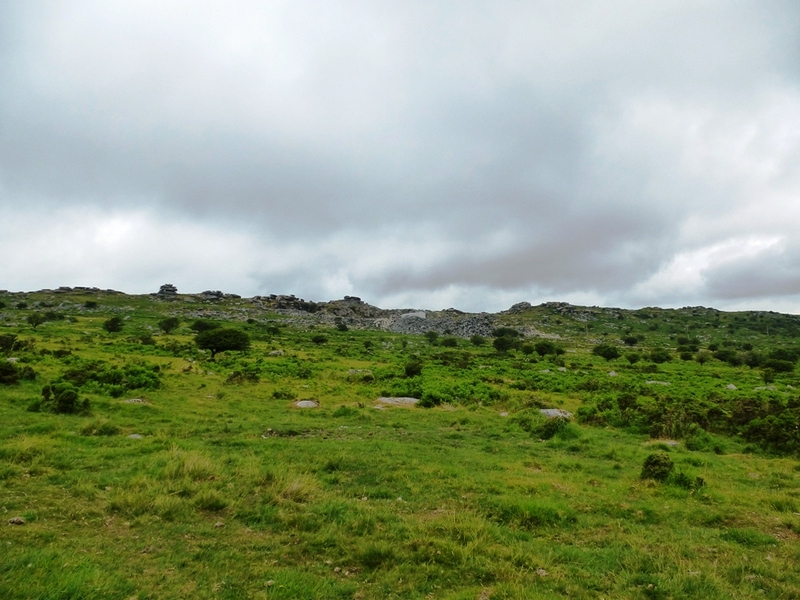 Before the rain filled clouds roll in from the west we have a few hours in which to find and explore another quarry which we have located on the OS map. The tiny tear drop of blue indicates a pool of some kind on top of the Tor and looks promising. 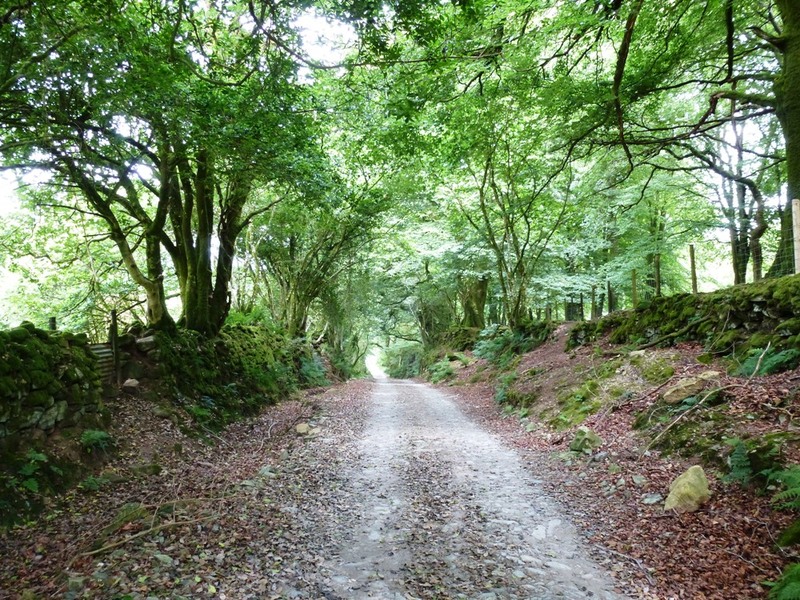 This time we cross the spinal A30 to the south side of the moor and drive along deep lanes heavy with foliage. 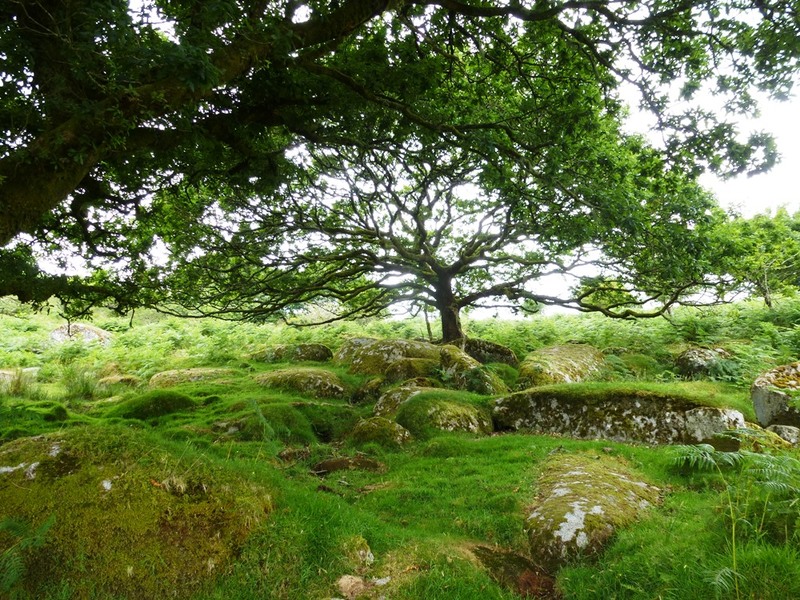 The track is easily found and is bounded by mossy stone built hedgebanks topped with outgrown multi-stemmed hawthorn, hazel and sycamore which form a shady canopy above us. Last autumns leaves are still intact, rusty and dry. We can see the gate ahead, a bright aperture through which we’ll pass onto the open moor. 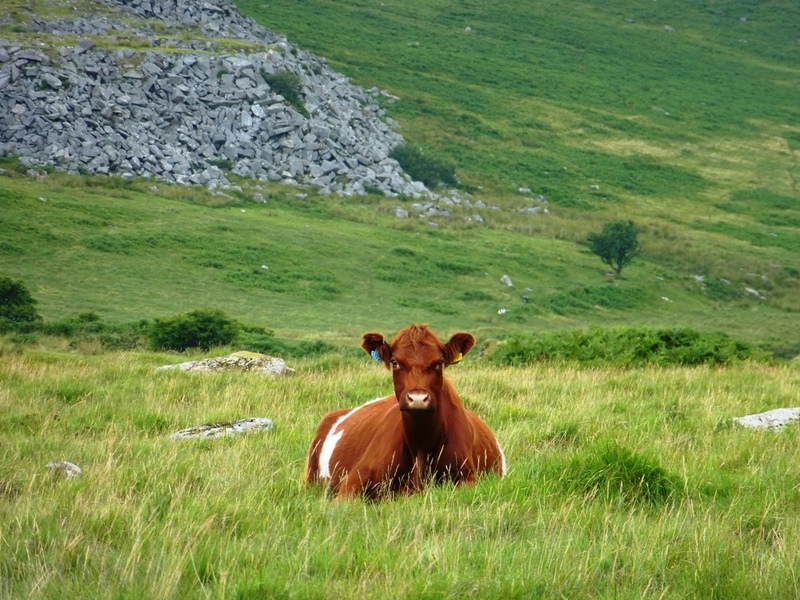 Centuries of over grazing on this upland have created a unique landscape which is slowly changing with a different management. 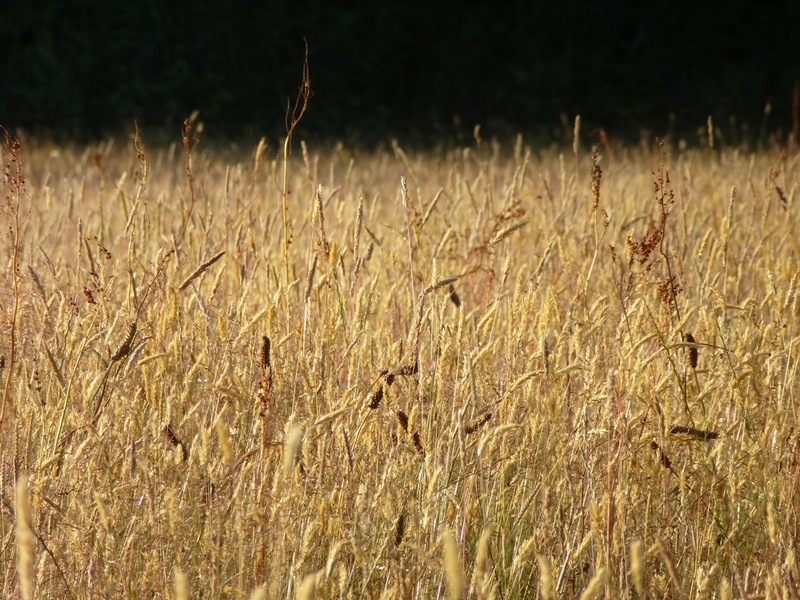 Farmers are no longer subsidized for the number of animals they produce but instead for the amount of acres they have. 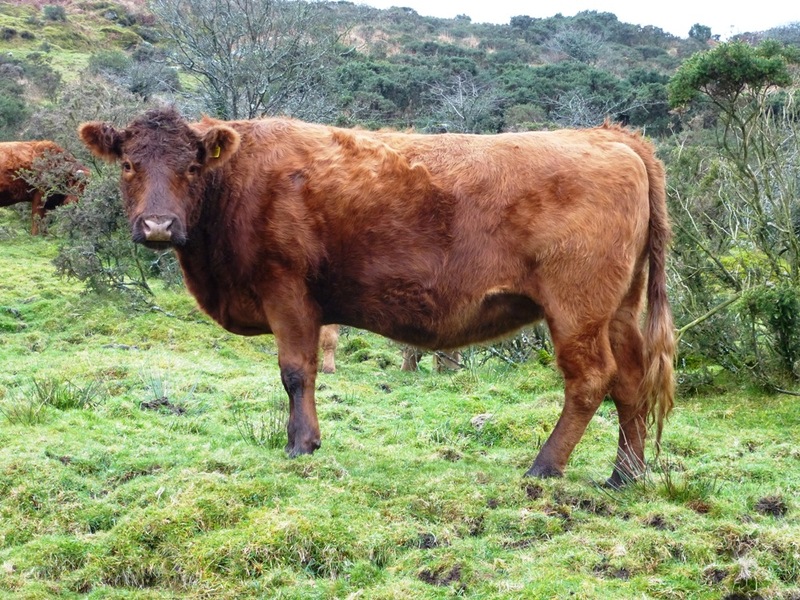 Hill farmers have been traditionally acre rich but production poor, given the harsh conditions in which they are raising animals. Now the pressure is off there is less need to go for maximum grazing and the moor is beginning to look a bit shaggier as a result. 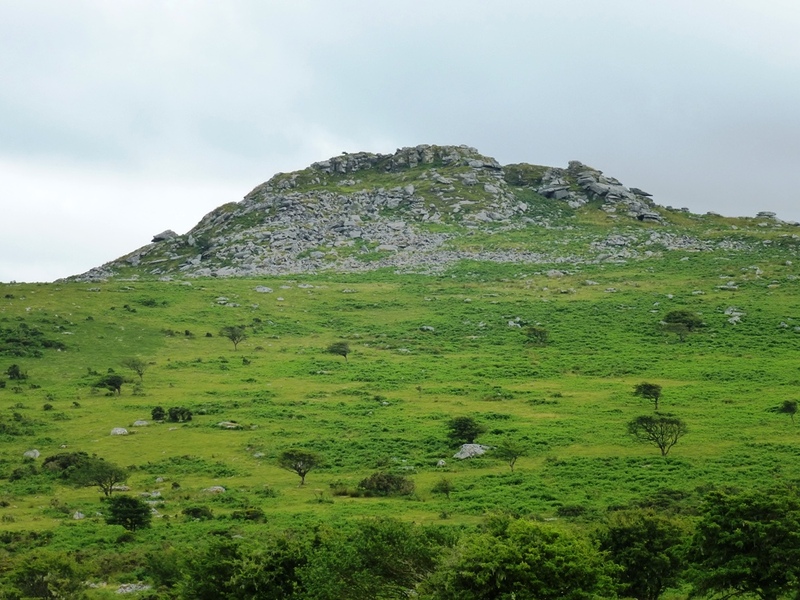 I don’t think anyone would want to see the landscape change entirely as it has evolved alongside human habitation since the Neolithic period and has its own ecology – but a few more trees, areas of scrub and increased hillocks in the grassland can only be good for wildlife. We make our way up the hill and much to our surprise there is a sign on the gate proclaiming that this is a working quarry. A slight disappointment that no swimming will be happening any time soon gives way to intrigue about the quarry. 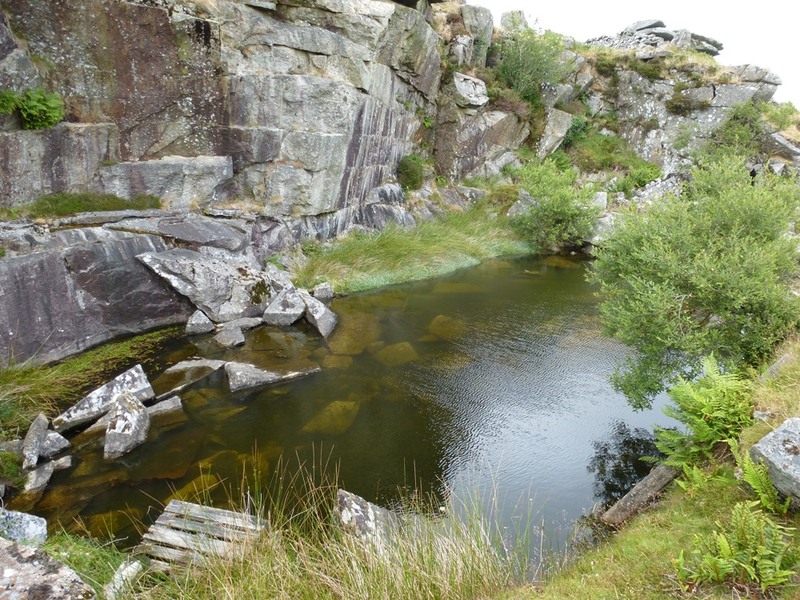 As far as we know there is only one granite quarry still in operation on the moor at De Lank. We pass through the gate and make our way upward along the track. Possibly because the side of the hill is in the lee of the wind there is a gentle feel to this moorland scene. A dry stream bed snakes through long tufted grass pinpricked with heads of bracken which hides rocky knolls and dips. 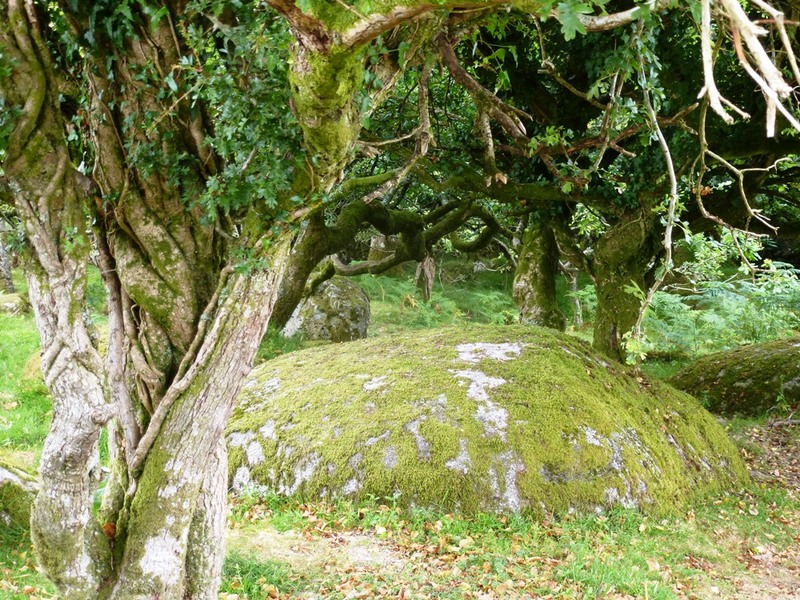 Huge rounded boulders are fringed with trees; small oaks and twisted sycamore. 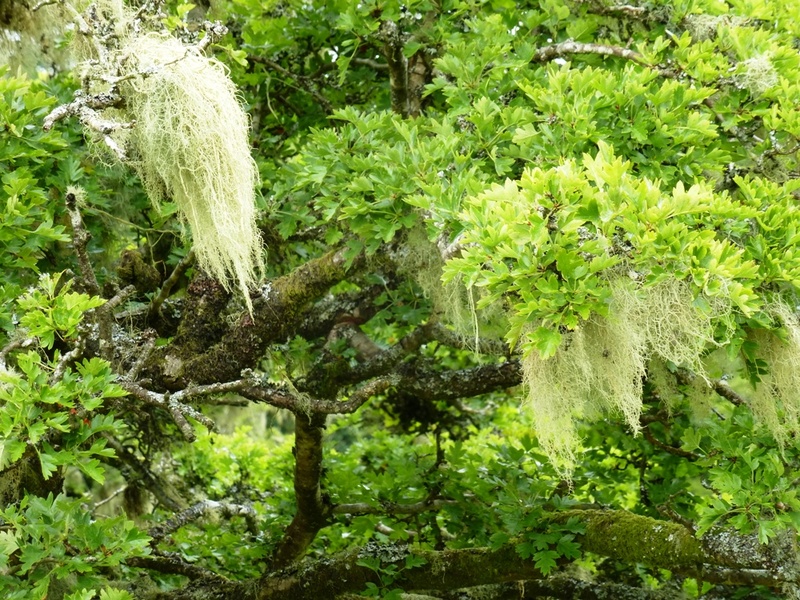 The telltale rags of lichen drape the branches, whispering about the clean wet air. 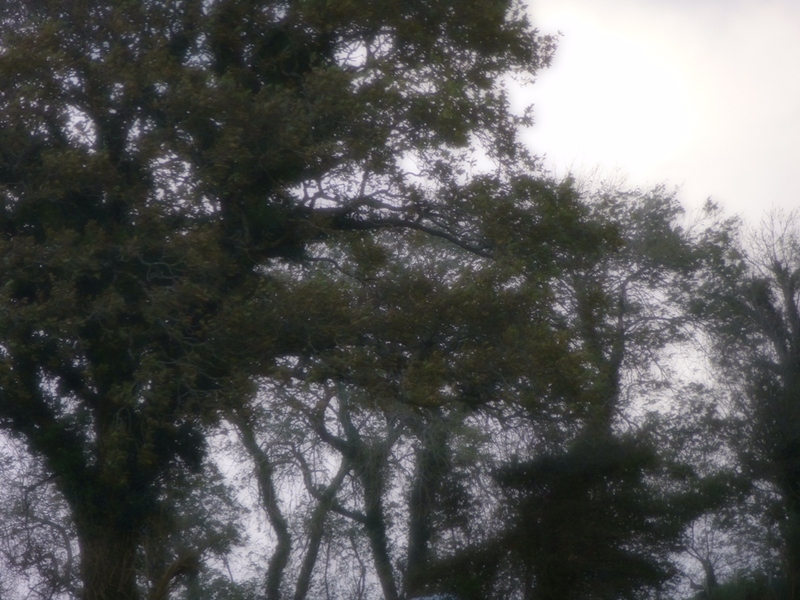 Rarely seen, a fairly mature gnarled holly stands alone, leaves dark and glossy. 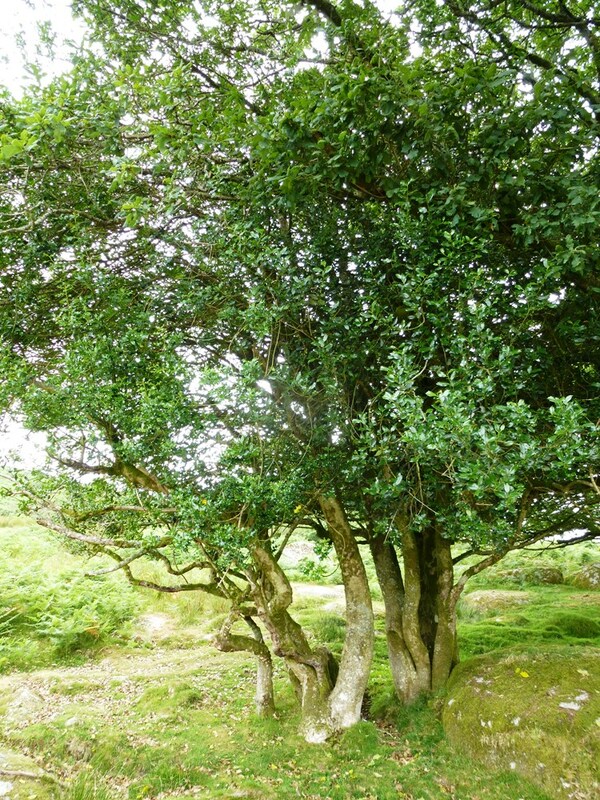 The Holly – once probably nibbled by sheep, hence it’s multi-stem appearance. As we climb we look backwards across the land. The horizon is hazy but the light is beautiful. The hot weather has passed and we are back to our usual cloud filled skies and though we may miss the heat, nothing can beat the endless changing; the billowing and brooding backdrop we know so well. 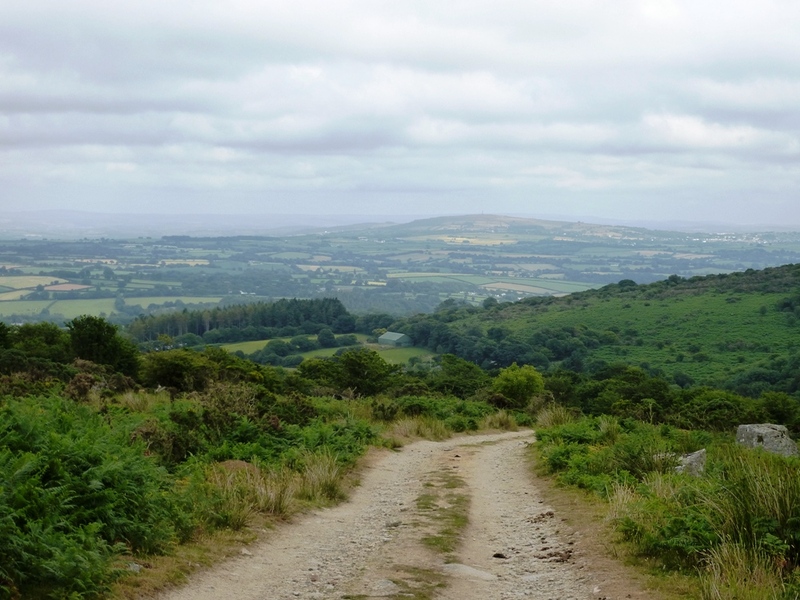 Up ahead is Bearah Tor. We make it to the top and glimpse the entrance. 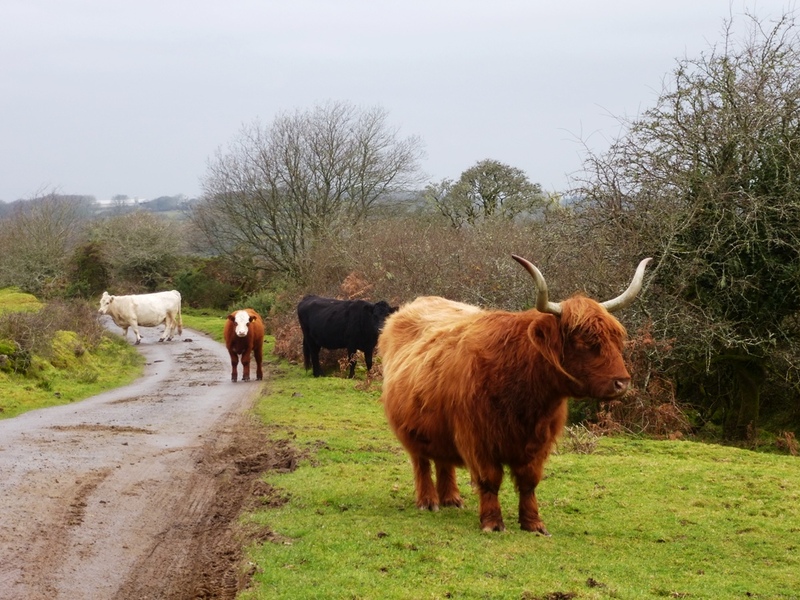 There is a slight frisson of apprehension that we will be seen off by the owners but this is Cornwall where everybody is really friendly and we are invited in to have a look around. Note relaxed stance. I am not in a hurry. 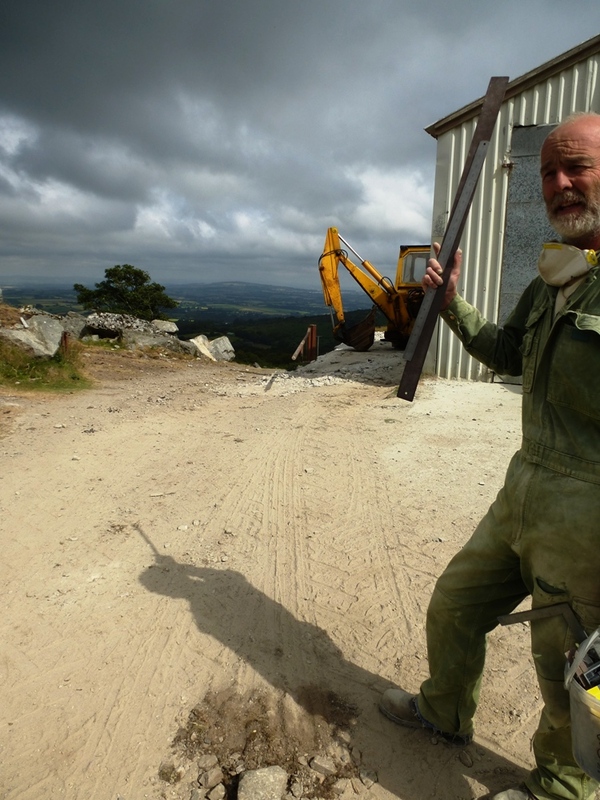 He explains that they no longer lift granite from the quarry itself but cut and dress stone of all different types which is brought onto site from different places. 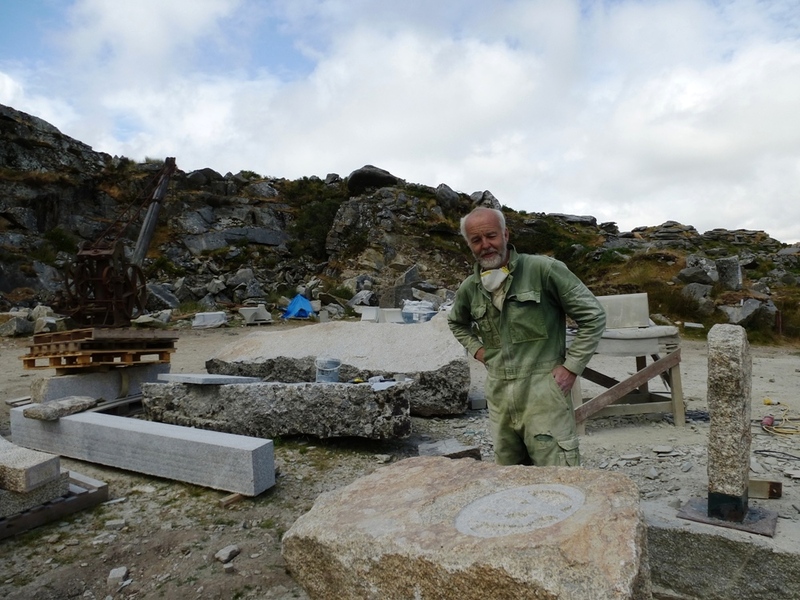 As there are not many places doing this type of work stone can come from quite far. A lot of their work is for local projects but they do a fair amount for historic buildings all over the country. Today there are just two of them, but they also have an apprentice, putting things in place for the years ahead. He has worked here for 25 years. 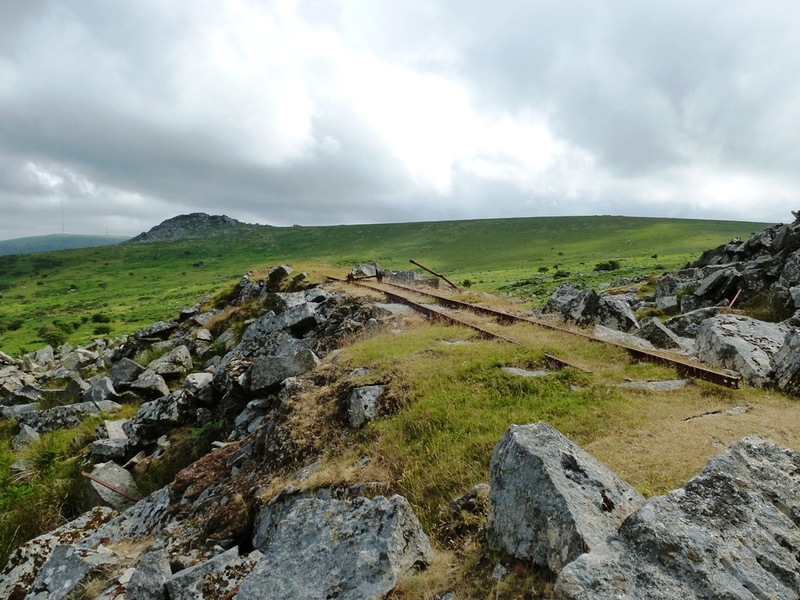 Regarding the history of quarrying in general on Bodmin Moor, the Tors and hills have been quarried for granite for over 6000 years. 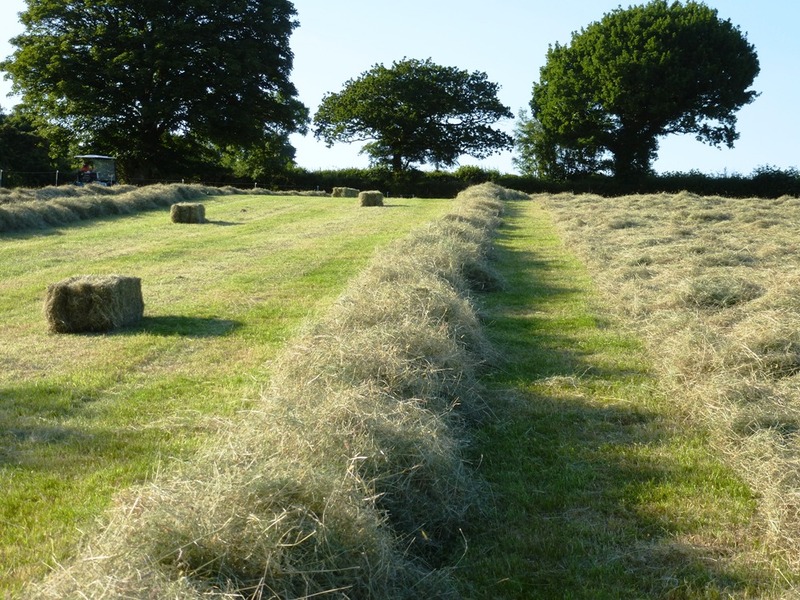 Incredibly durable, it was used for major monuments and buildings throughout the centuries including Early Neolithic chambered tombs and long cairns; Later Neolithic and Early Bronze Age standing stones, stone circles, stone rows and burial cists. Much later, granite-clad office blocks, 19th century lighthouses and 20th century war memorials are like the modern sisters to these ancient monuments. 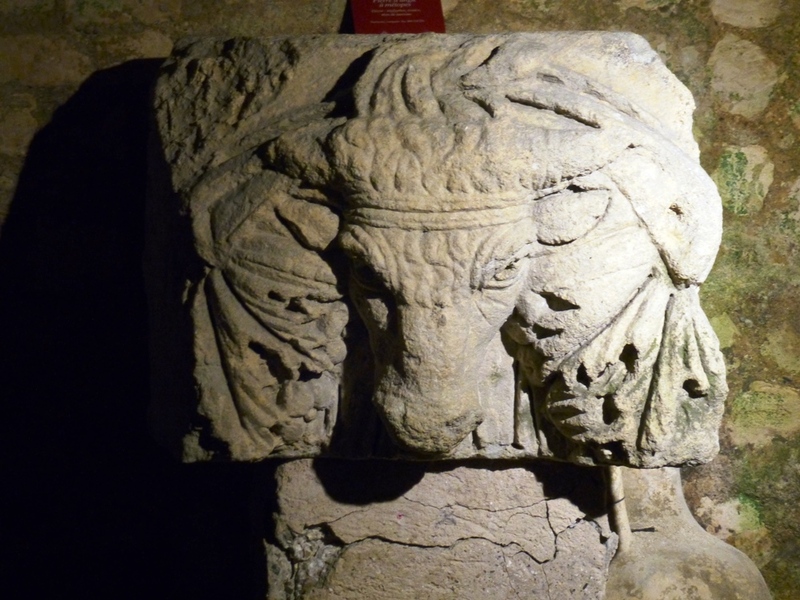 The early medieval period saw inscribed stones and crosses and later medieval wayside crosses, bridges and churches. 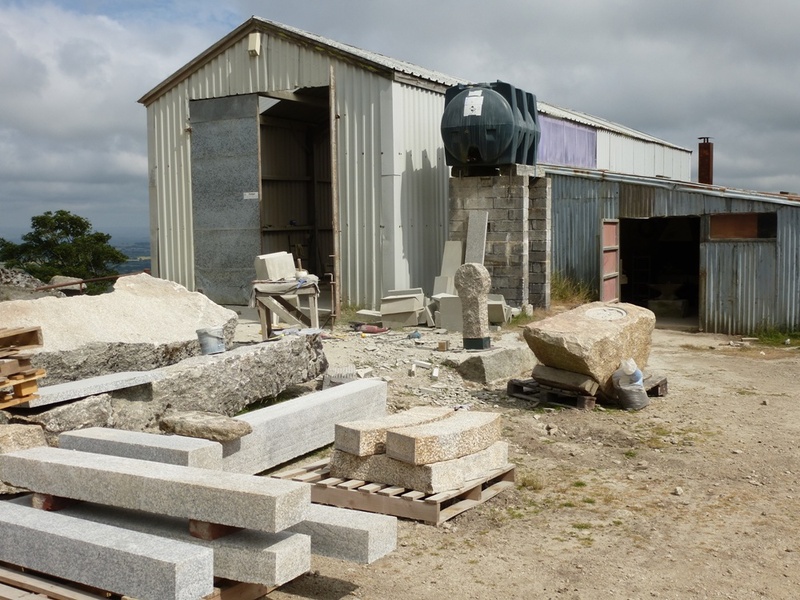 The granite was used extensively in the nineteenth and twentieth centuries for bridges, dockyards and churches and other important monuments, toiled over by quarrymen to produce perfectly dressed stone. It was also used after the two world wars for the headstones of the dead. Smaller pieces were used at least from Tudor times for lintels, jambs, mullions, thresholds and other principal stones in domestic buildings. 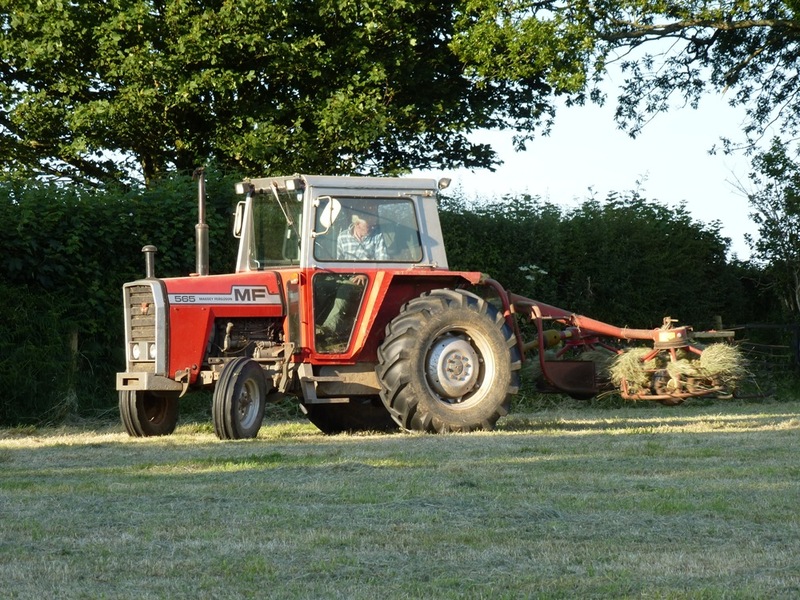 It was also an essential part of farming, being used for gateposts, field rollers, salting troughs, pig troughs, cider mills and presses. 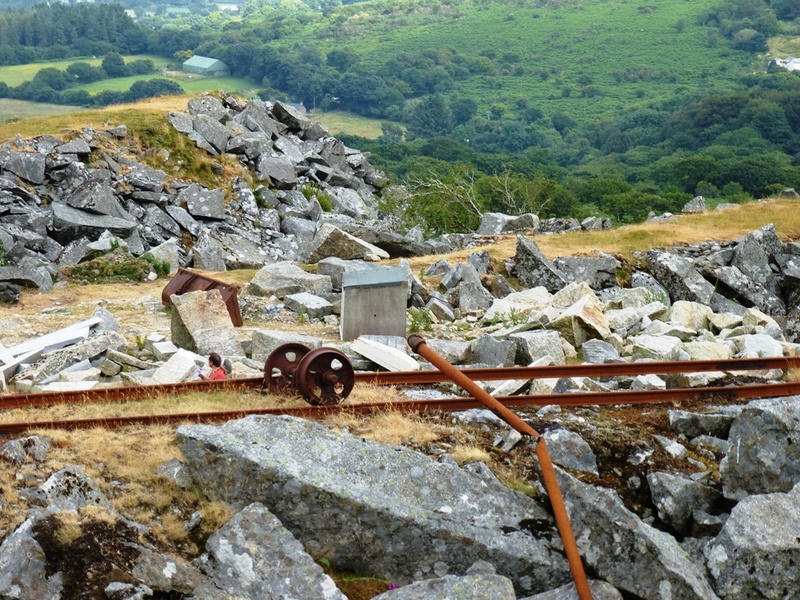 A miller would grind the flour with it, and others, including tinners (mining) and claymen (china clay) needed a stone which was strong and hard. 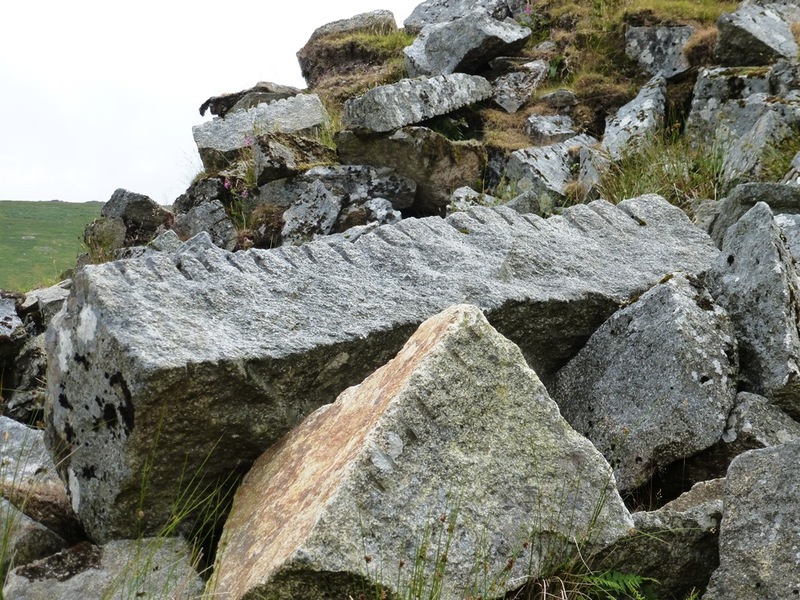 Granite of lesser quality with its densely packed vertical joints and dykes of elvan (quartz porphyry) which easily crumbled also started to be quarried in the late 19th and early 20th centuries for roadstone and ballast. 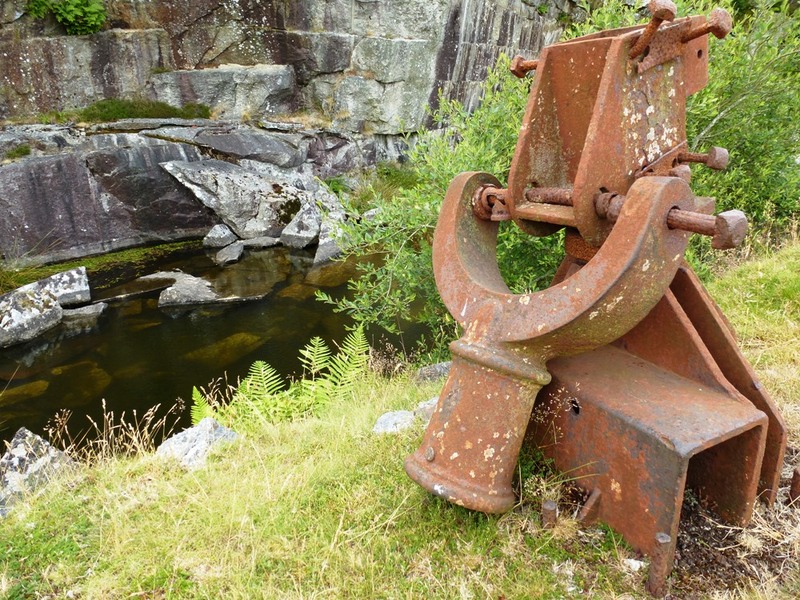 Industrial scale quarrying on remote Tors only became commercially viable with the advent of better road access and a more efficient method of splitting. 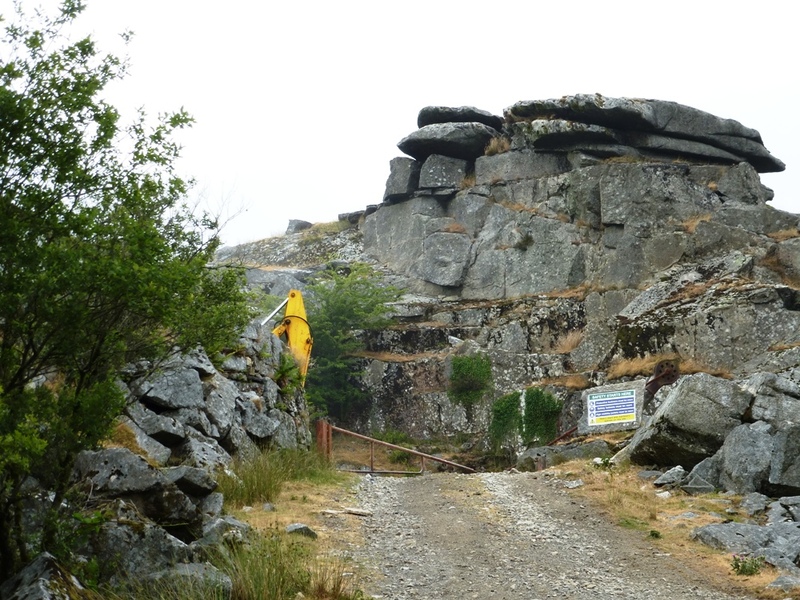 Prior to this they were visited for centuries by stone splitters, laboriously chiselling series of grooves and using metal wedges to cleave the granite. 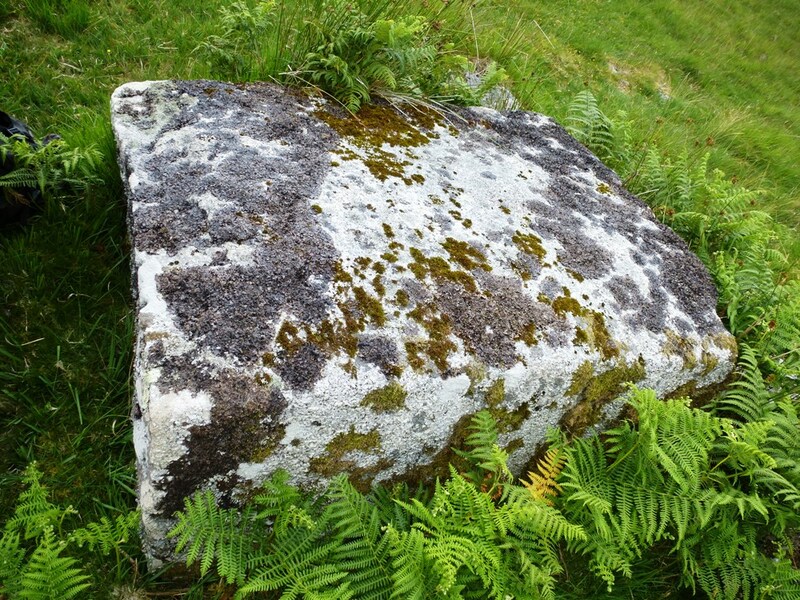 Mostly these splitters and skilled stone-masons used surface stone, or ‘grass-rock’, the large weathered blocks which are scattered over the landscape. 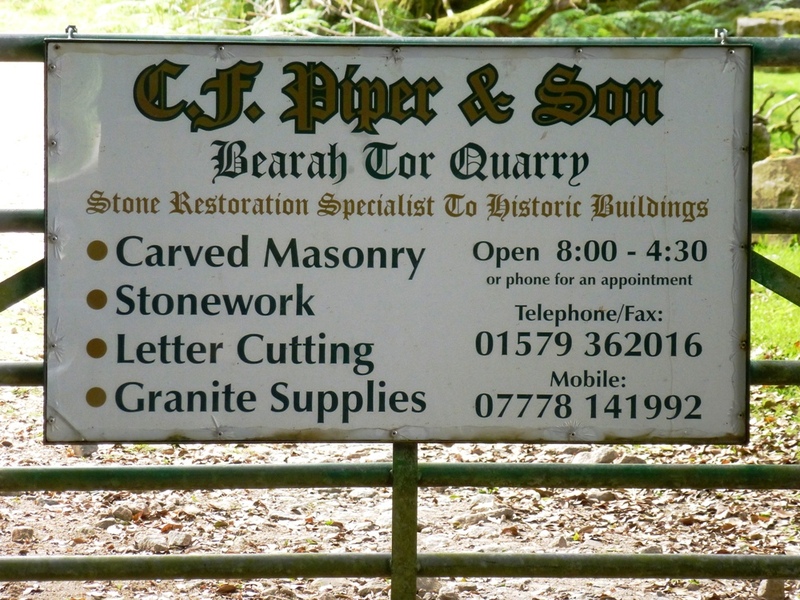 From around 1800 the plug-and-feather method for splitting stone was used, which meant hand drilling series of holes, then placing short iron chisels, the ‘plugs’, between pairs of thin iron feathers which reached the bottom of the holes. Striking the plugs cleanly in turn brought percussive pressure to the sides of the holes and thence to the heart of the stone, making splitting more efficient. From the outset, deftly controlled blasting was also used to extract the stone before splitting, using gunpowder in hand drilled charge holes, lit by a safety fuse. 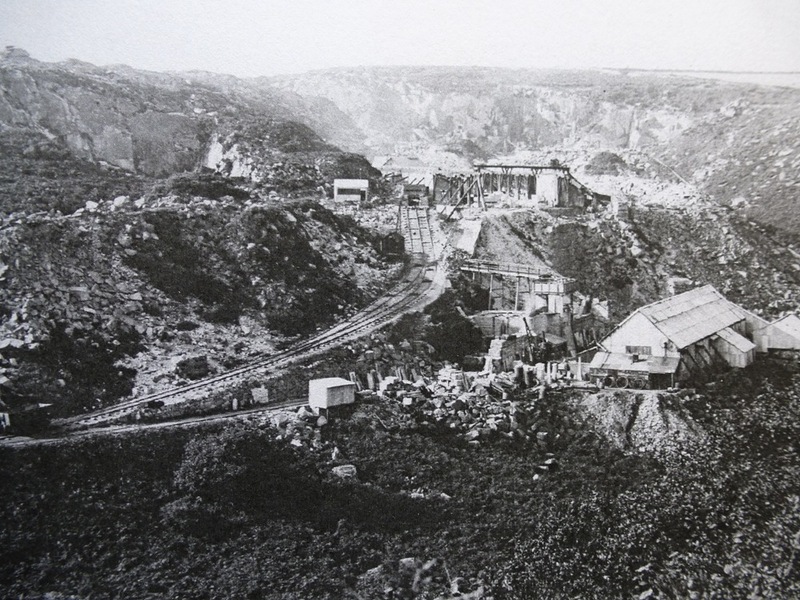 The powder was stored in small secure powder houses or magazines, away from the main quarry. Nice place to work eh? 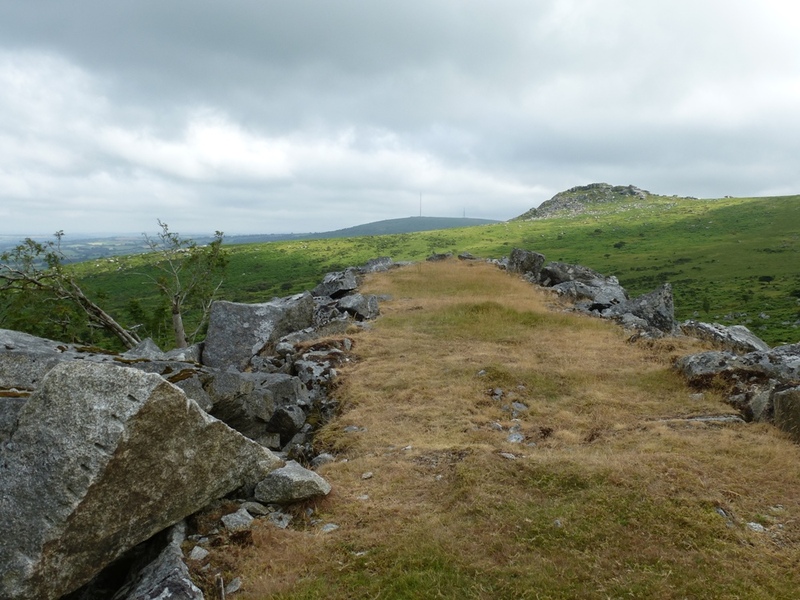 The fortunes of the Bodmin Moor quarries were always unpredictable, even though some attempts were made to churn out the more stable products like headstones and setts. 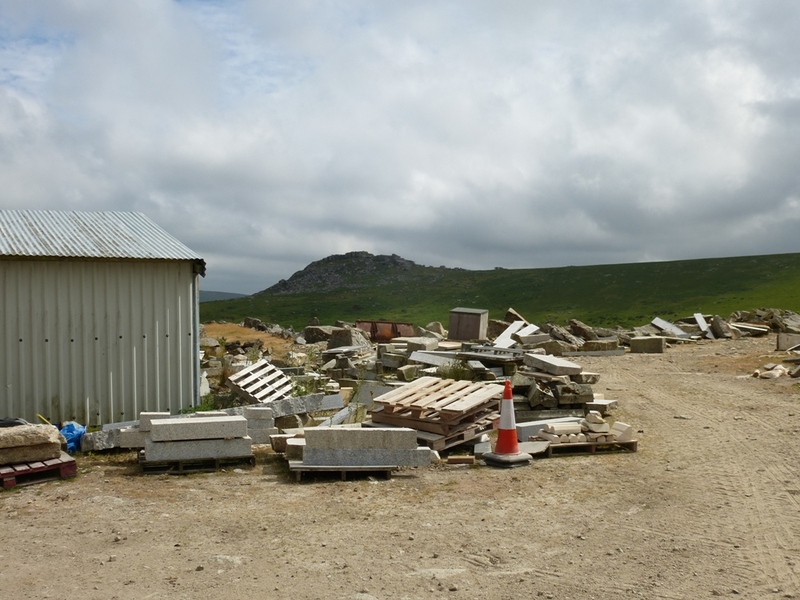 But in the end, competition from abroad forced many these moor quarries to close. This one has survived as a going concern for specialist pieces. 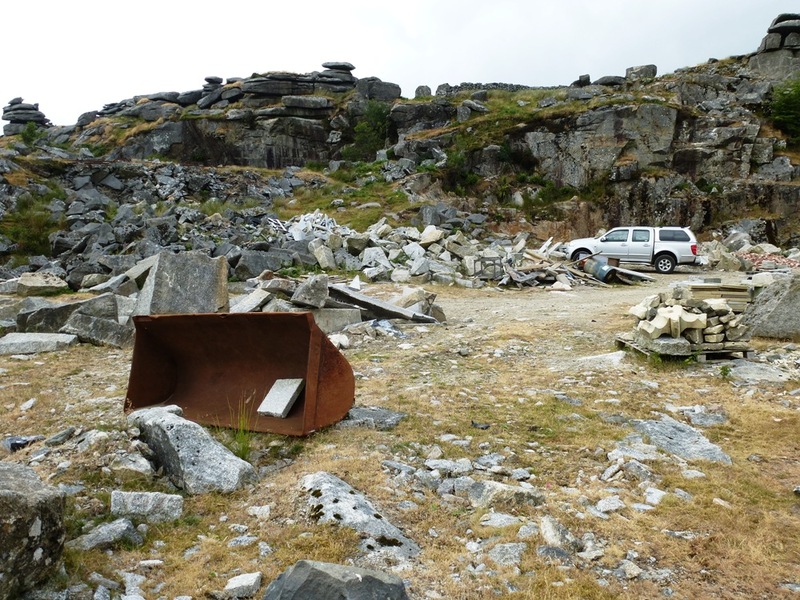 Here is a gallery of images of the working quarry. Please click on a photo to enlarge. I think this is York stone. You see this a lot on metroplolitan pavements. They used heat up, quench and retemper tools in the forge. Now the quality of tungsten is so good the don’t need to. 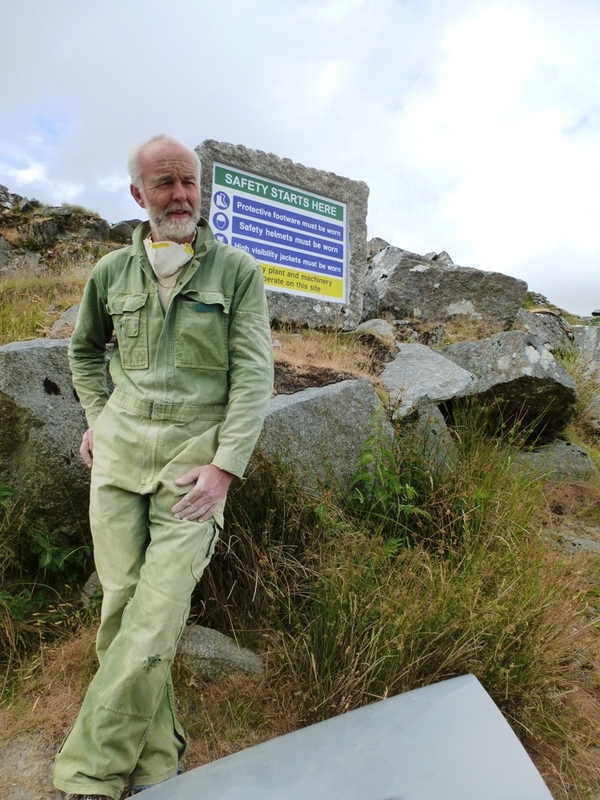 There is also the great St Breward pit of De Lank where granite is still lifted, now cut by thermal lance. It is sawn and polished and mainly used as cladding for smart high rise buildings and provides high quality memorial monuments too. On their website there are some interesting images both past and present. Hopefully this yard will survive into the future but one thing is for sure, what will remain forever are the plug-and-feather and charge holes, the traces of cleaving etched indelibly into rock. Leaving the others chatting about machinery I climb up above the yard and find the pool. It’s possible for a swim but I don’t like the look of those submerged angular rocks too much. Maybe a launch from here? 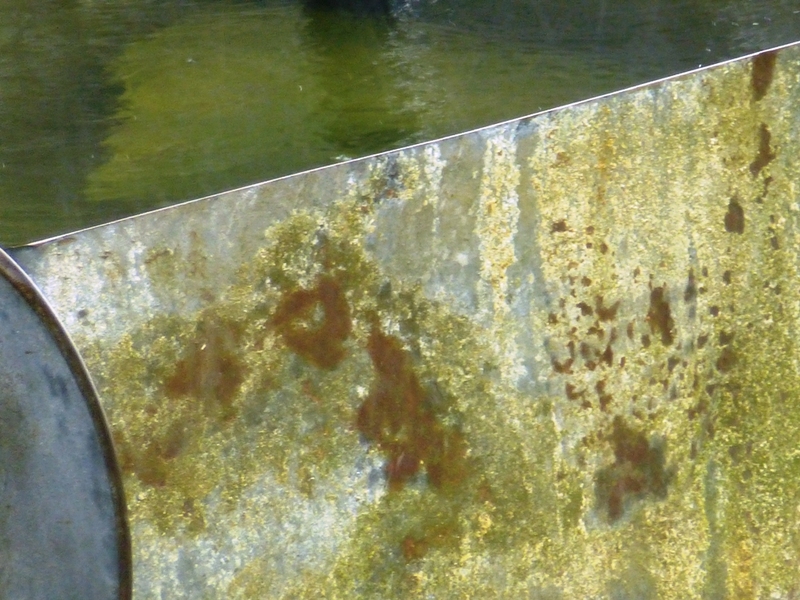 This is the same pool as in the 1979 picture above. 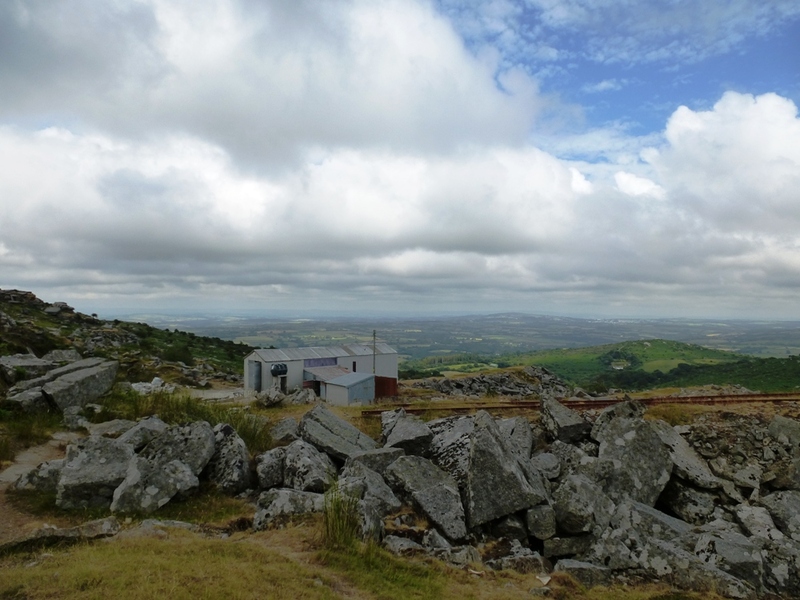 The landscape is fascinating though, a mix of industrial and wild, the present and the past. 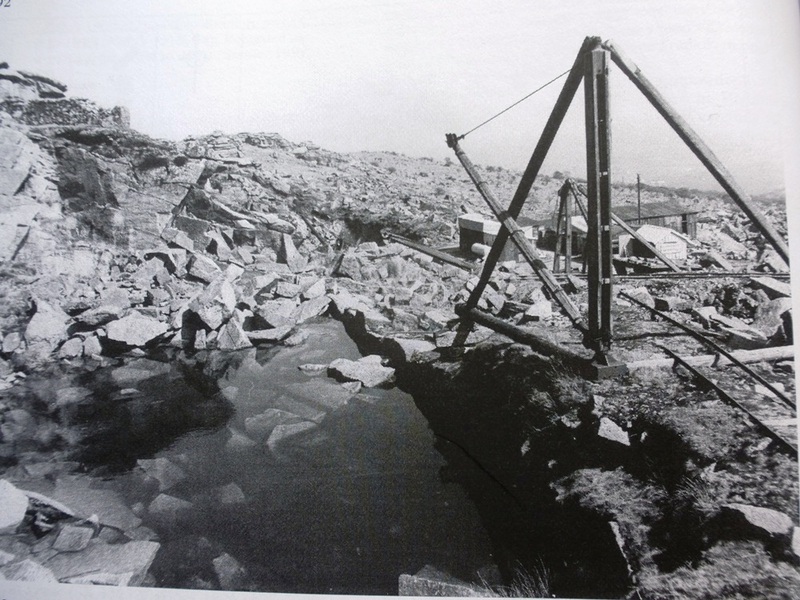 Is this the base of the crane in the 1979 picture above? This is a ‘finger dump’ with trackway. ‘Wasters’ were piled in long fingers away from the pit, often 4 metres or so in height. 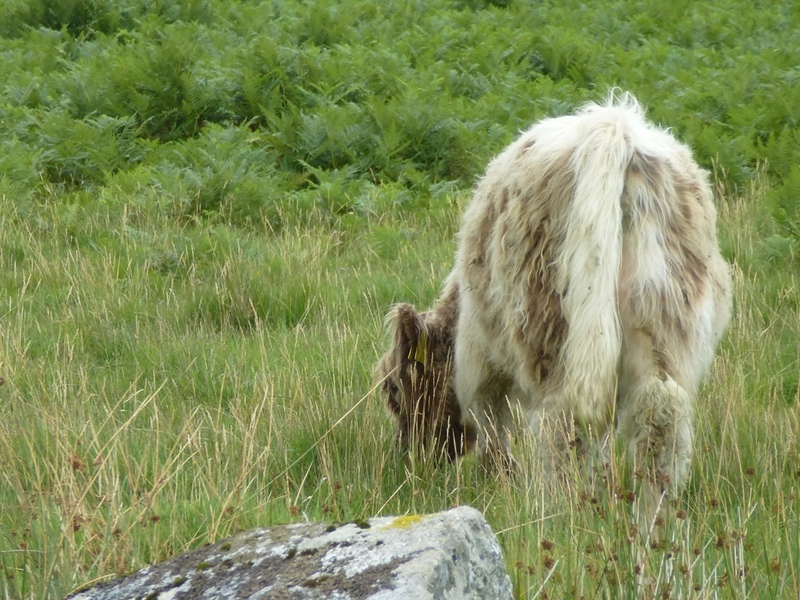 Afterwards we go onto open ground for a picnic, Twelve Mens Moor above us. We are watchful of the gloomy mass of dark shapes heading our way. A lone walker with her collie dog strides across a few hundred metres away but other than that and a few alarmed looking sheep we are alone. 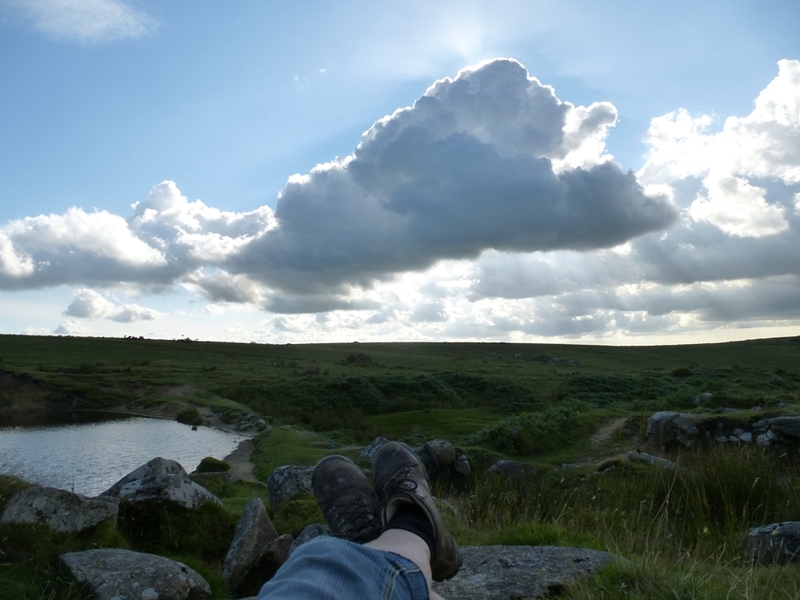 We sit on a massive rock, eat our lunch and listen to the noise of the moor. 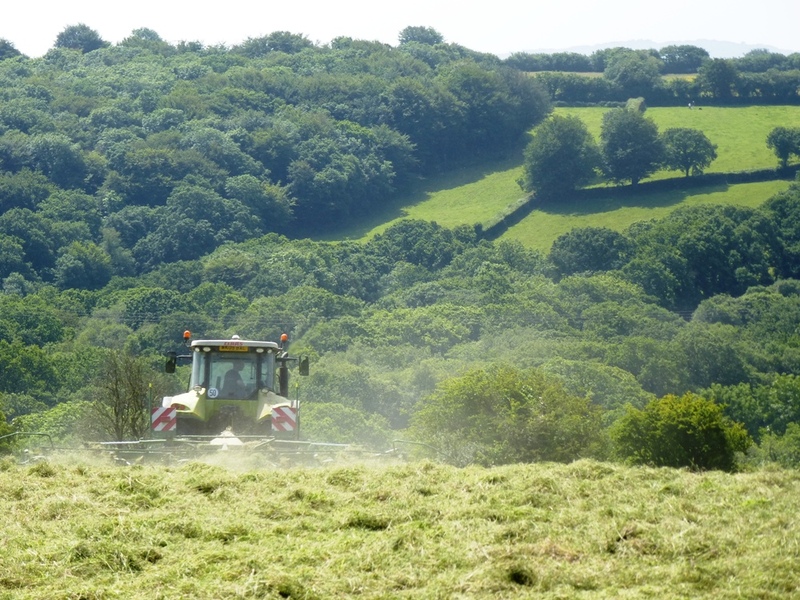 This year haymaking has not been as stressful as last year. And again. That’s because (oh joy) there has been some spectacularly fine weather. Having a summer at last has lifted everyone’s spirits and has also come just in time for those running holiday places. After four rubbish summers the tourists are making a come back. 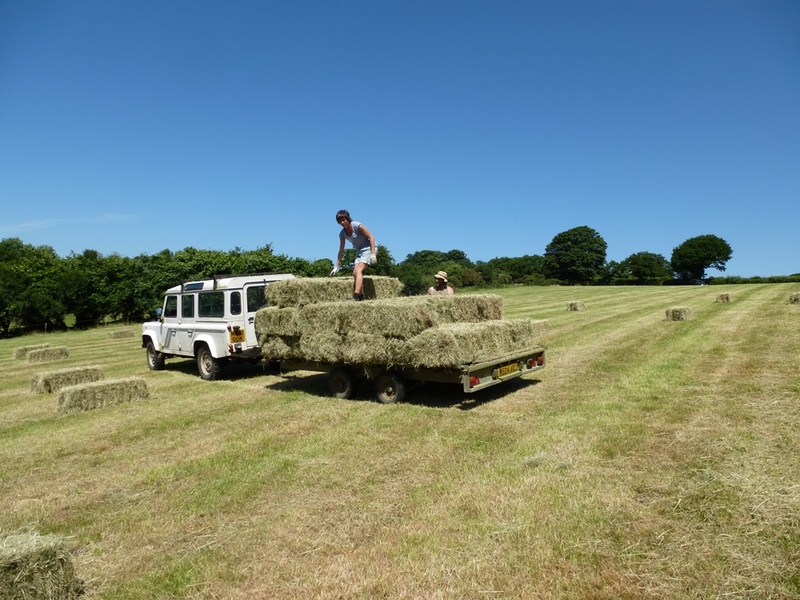 It’s quite hard to find people who still do small bales – and have the machinery which will fit into our old style gateways. But after scanning the horizon with binoculars last summer we spotted a young guy doing just that. 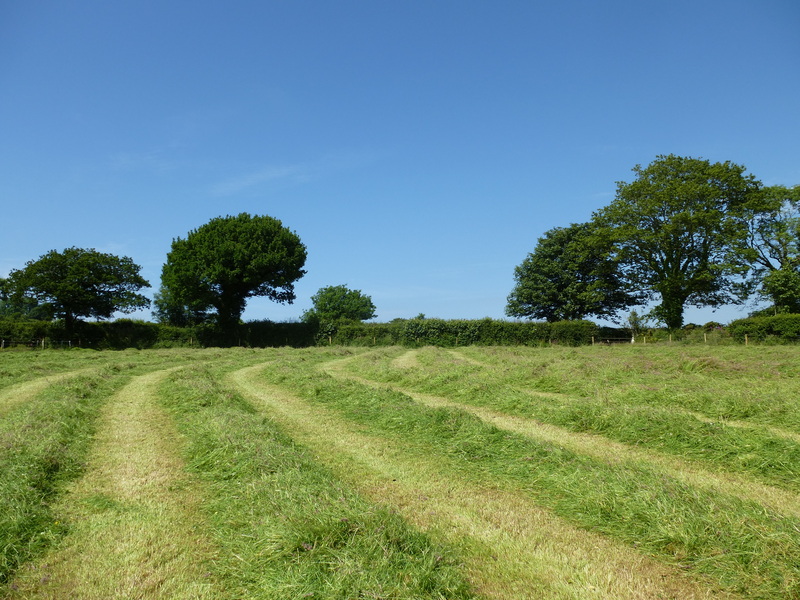 A short car drive, a tramp across a field and a conversation, then lo, our fields were cut that evening. 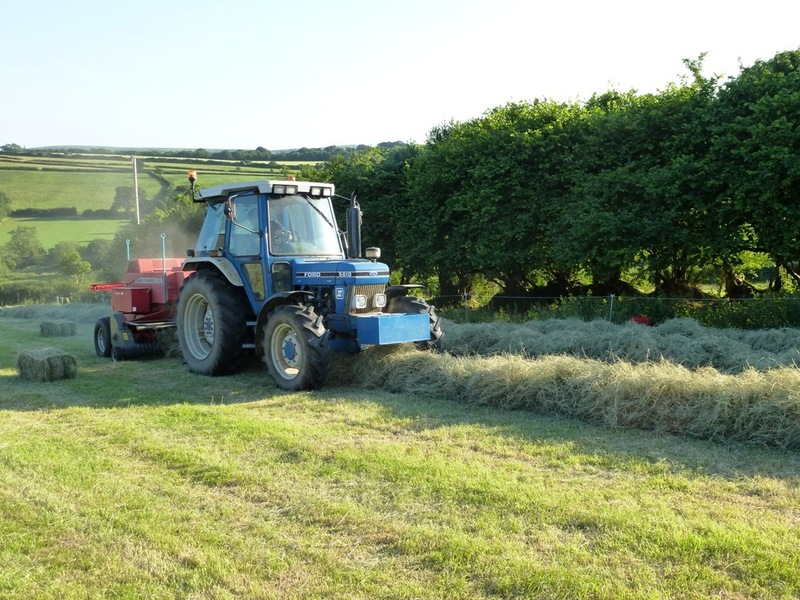 This year he did everything…cutting, turning, baling…which made it simpler than rounding up the bevy of faithful neighbours who have always helped us out in the past. It was achingly hot. The air was buzzing and the sky intense. 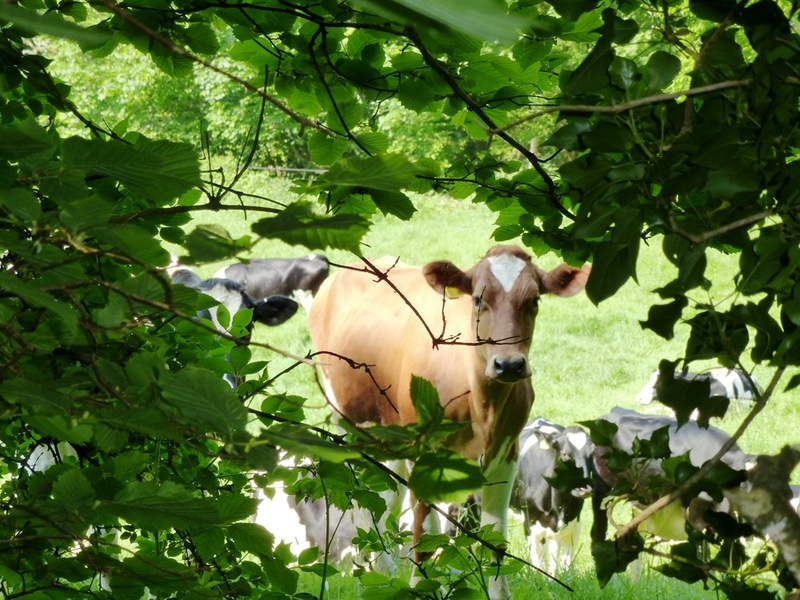 The cows took shelter in their shed under the oak. I could feel the burn on my skin. 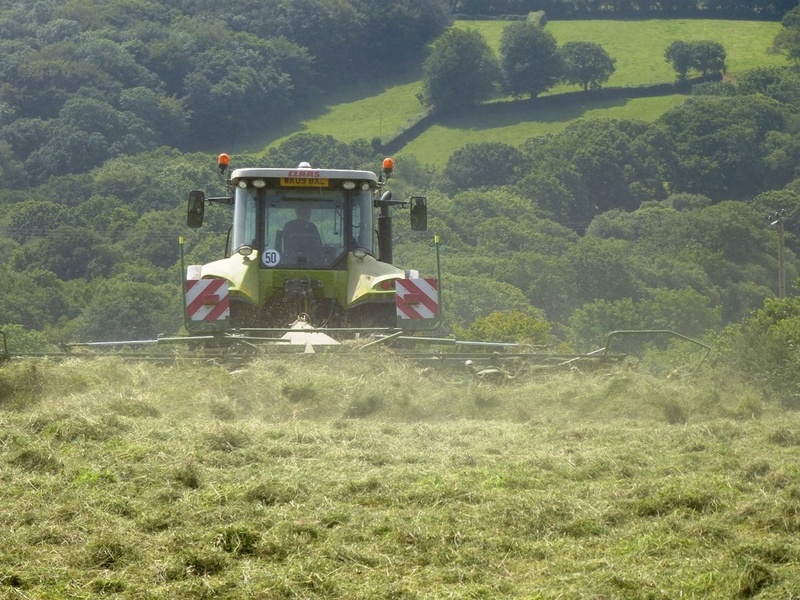 The cut grass is turned until it is dry, over a period of three to four days. It is usually turned once a day. 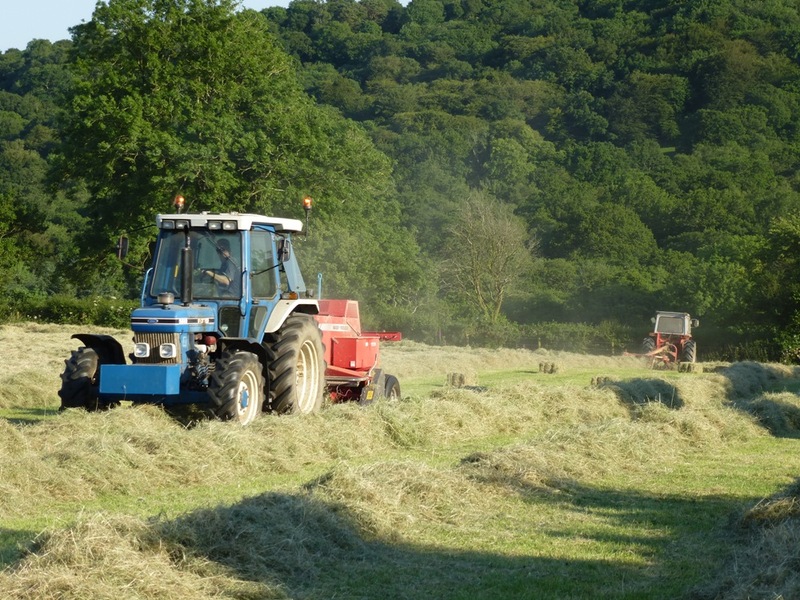 Next comes rowing and baling. 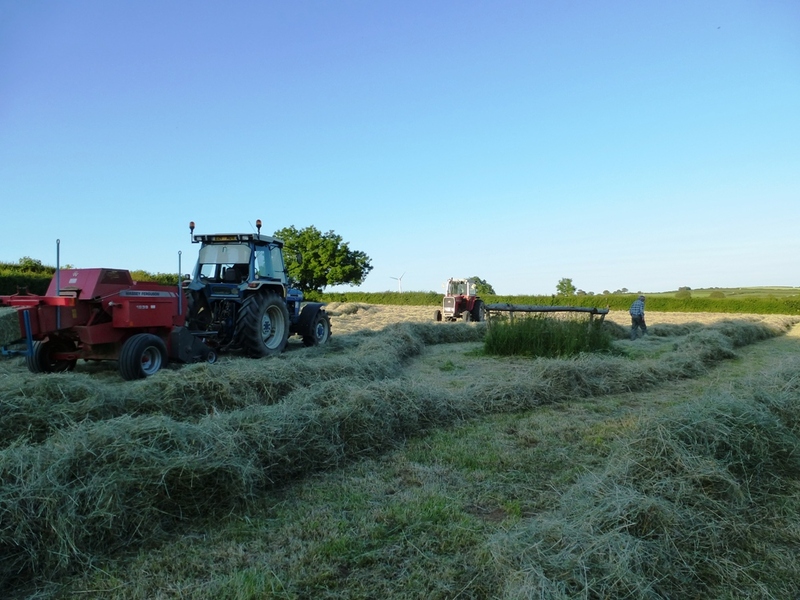 The turned hay is put into rows and then the baler comes along and sweeps it all up into it’s belly and the bales come out like sausages. I never tire of this process. 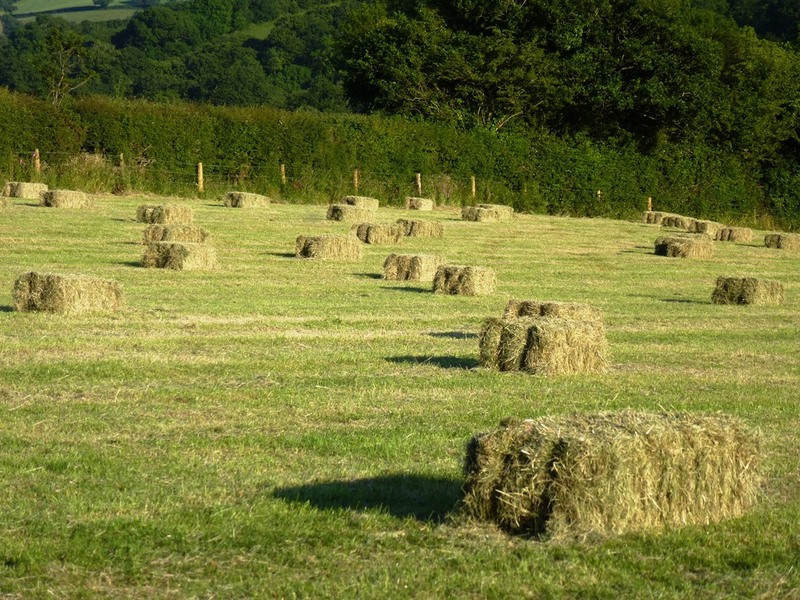 Time to Collect the Bales. 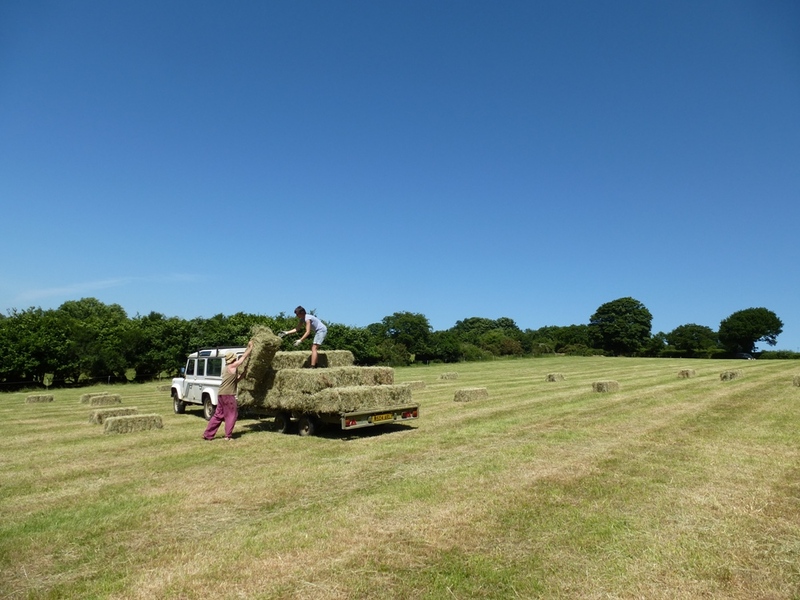 We made 280 bales from the Triangle Field and half the Cow Field. I would like to point out here that I was not always swanning about with my camera! Heaving was done. One evening our friends R & A (thanks!) came over at 8.30 and we got 100 in the shed before dark. 60 went to our neighbours A & P and the rest to our friends T & N. We still have one field to do. S on top of the trailer – her first job as intern! 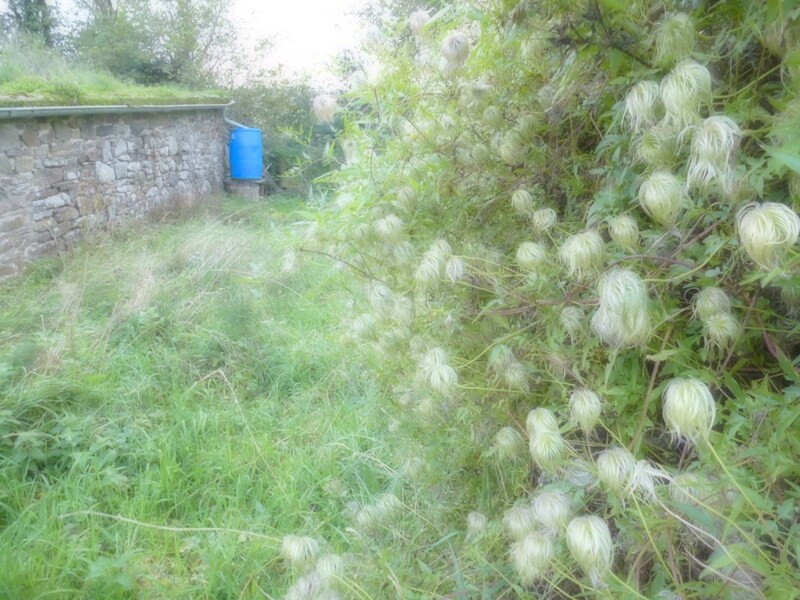 Oh, and this is the green/brown roof on the barn today – I’ve already tweeted this I was so excited by the bees. 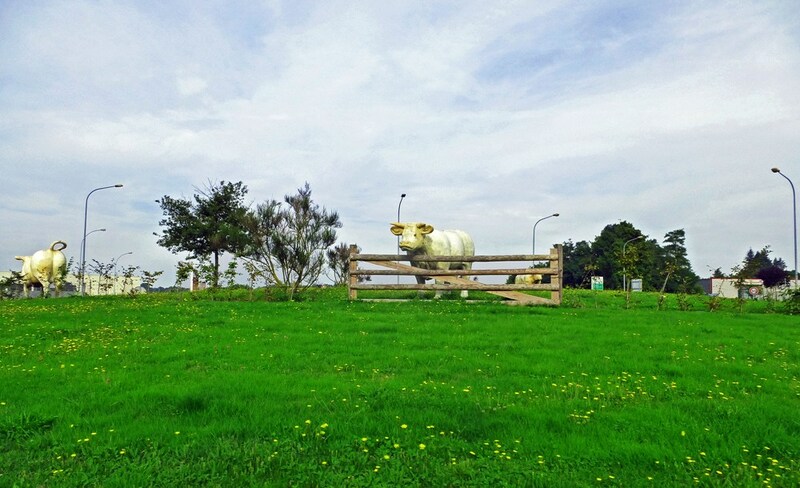 Tomorrow is the anniversary of the cows’ arrival, they have been here a whole year. 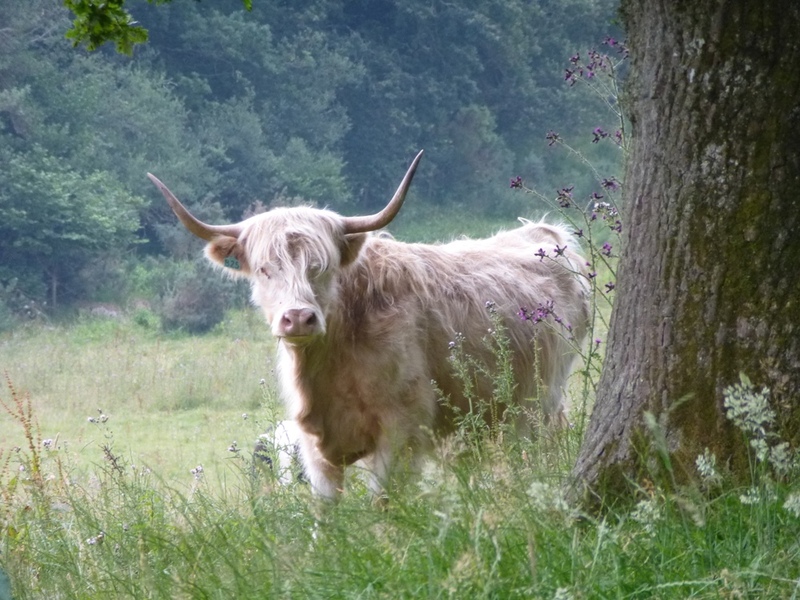 We have really enjoyed getting to know them and the gentle rhythm they bring to the days. 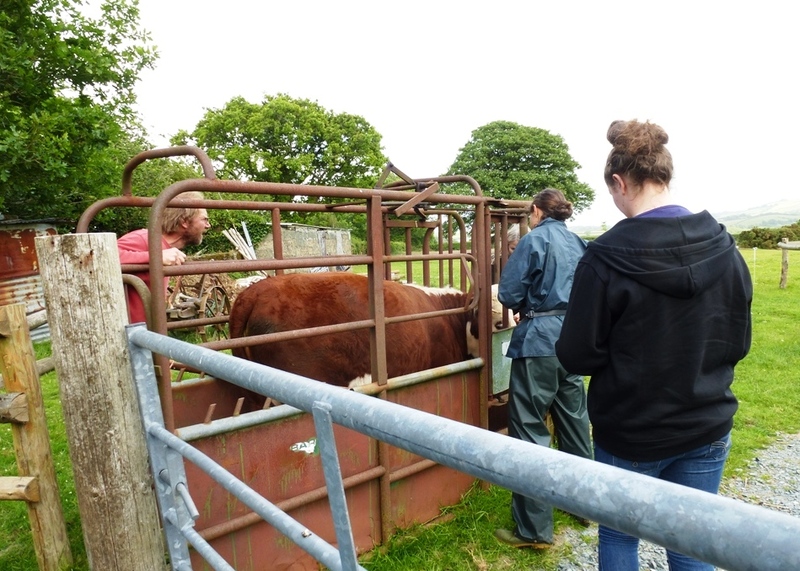 At the end of last month it was TB testing time. A positive result inevitably ends in slaughter so I was not looking forward to it at all. 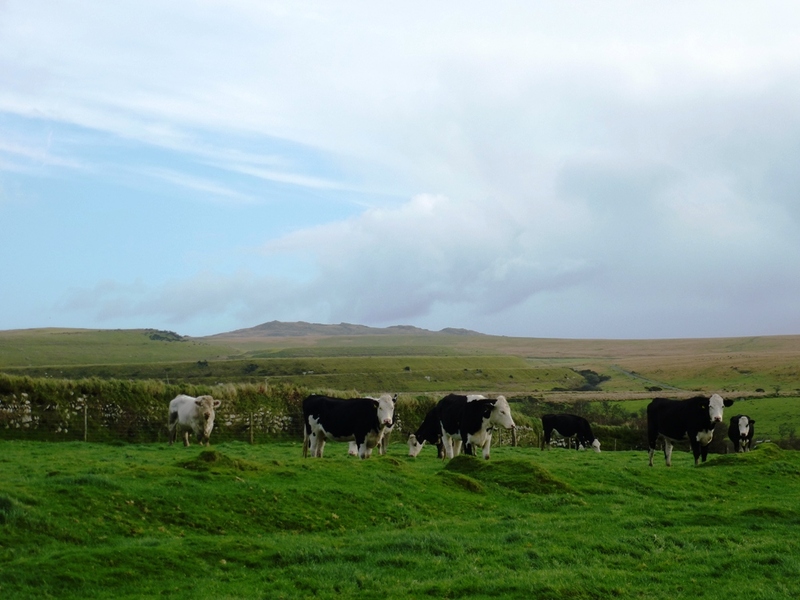 This area is quite high risk for TB and most farmers build in a certain amount of loss into their herds. I’m not sure this is possible with only three! Maybe this is why my friend L counselled that I shouldn’t get too attached. Fat chance. Anyway I won’t spin this out, they all passed. Hurrah. 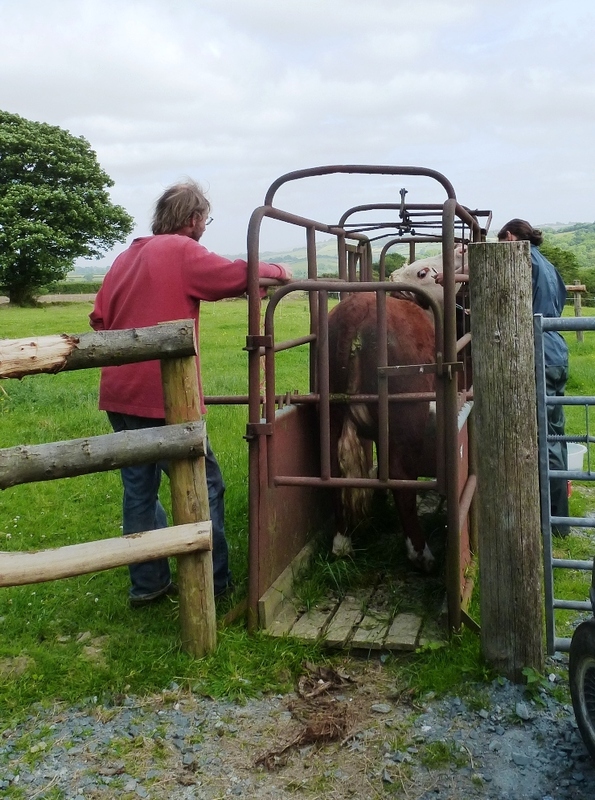 However, there was a nervous moment when the vet kept Mary-Rose in the crush for longer and had to check her several times. But, she concluded, it was because Mary’s skin was thicker anyway. Funnily enough even though this was a bit of a surprise, it seemed to fit. She has always looked heavier and clumpier than the dainty Belita or the handsome Lucy. 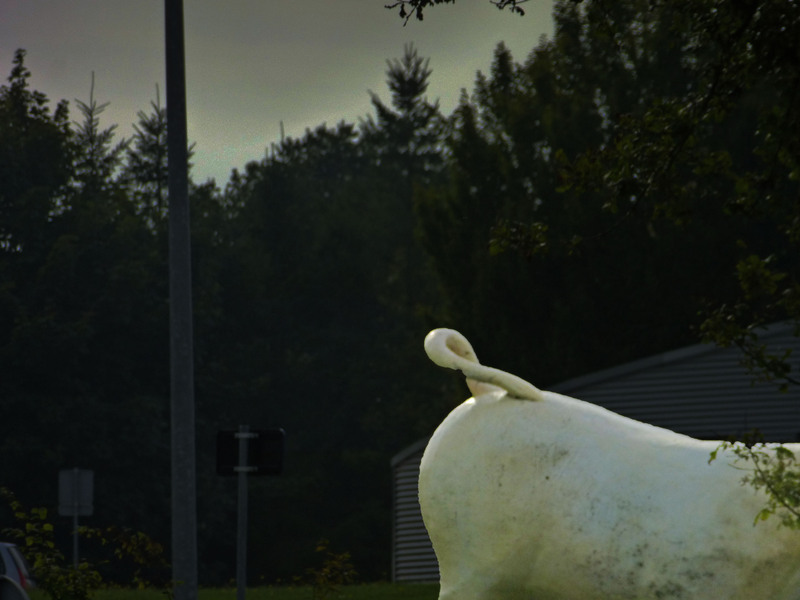 As with people, so with cows. The look of alarm as they become aware of what’s coming.